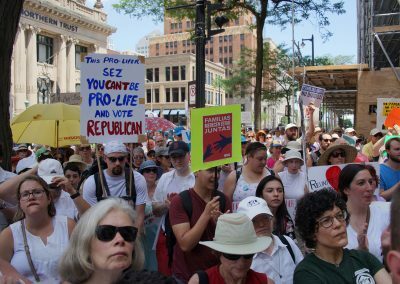 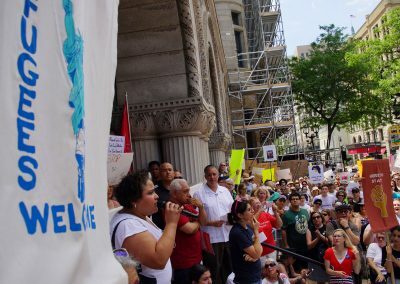 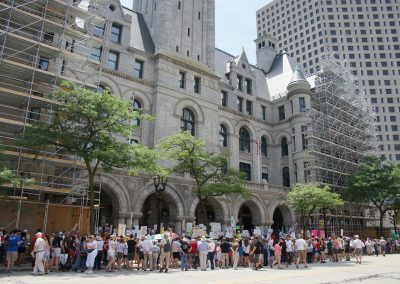 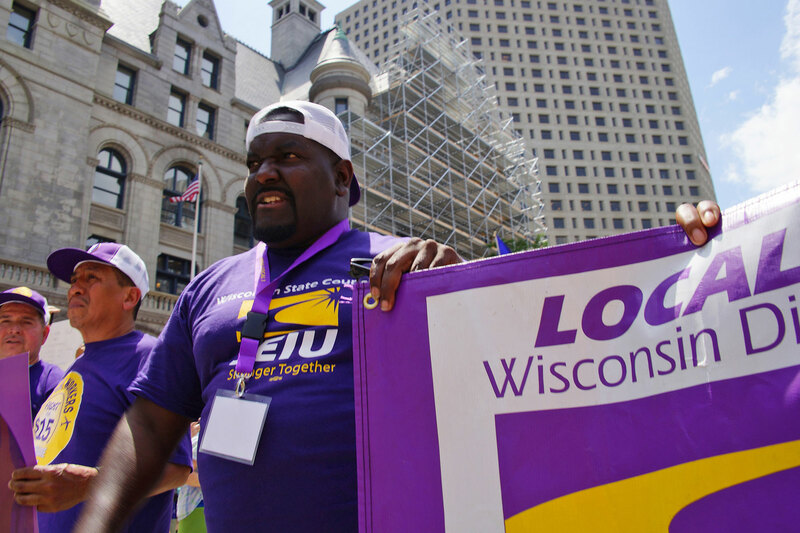 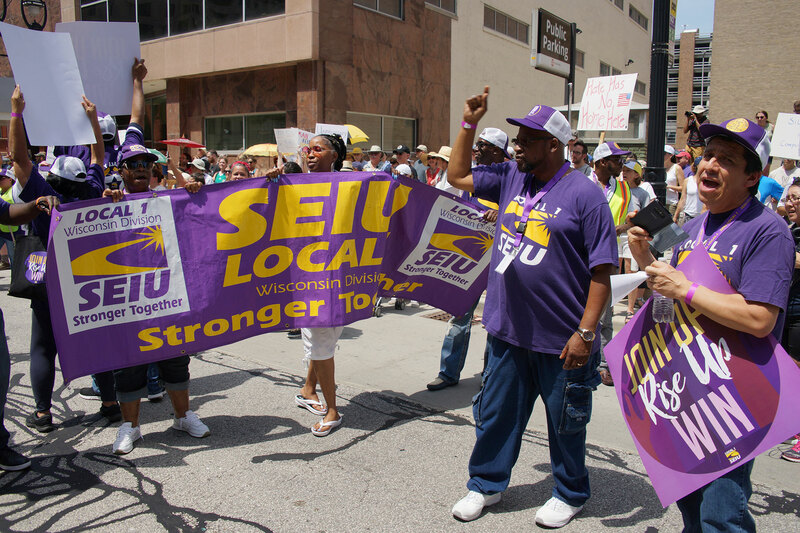 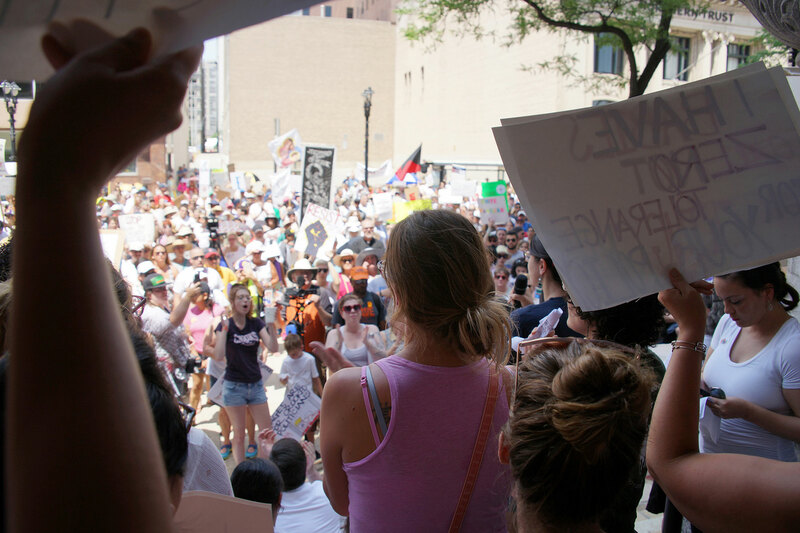 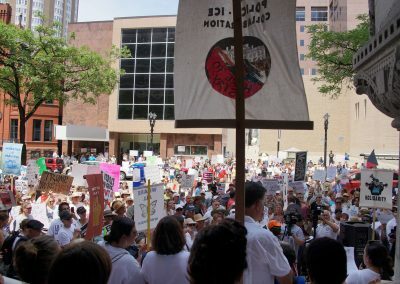 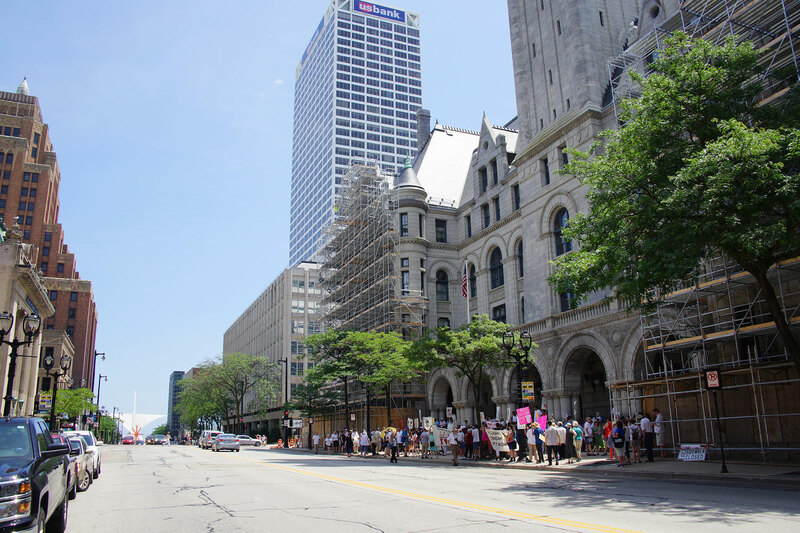 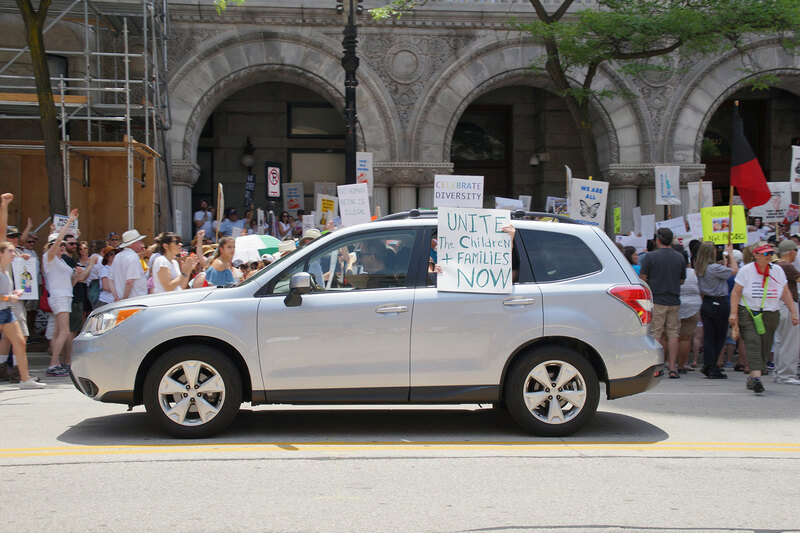 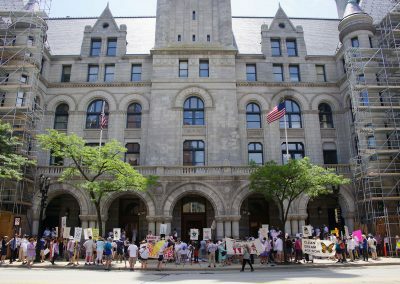 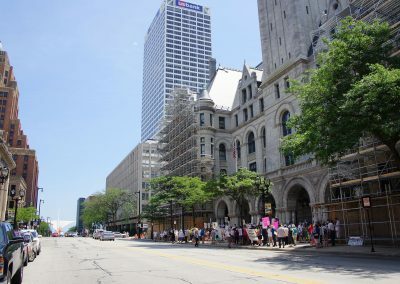 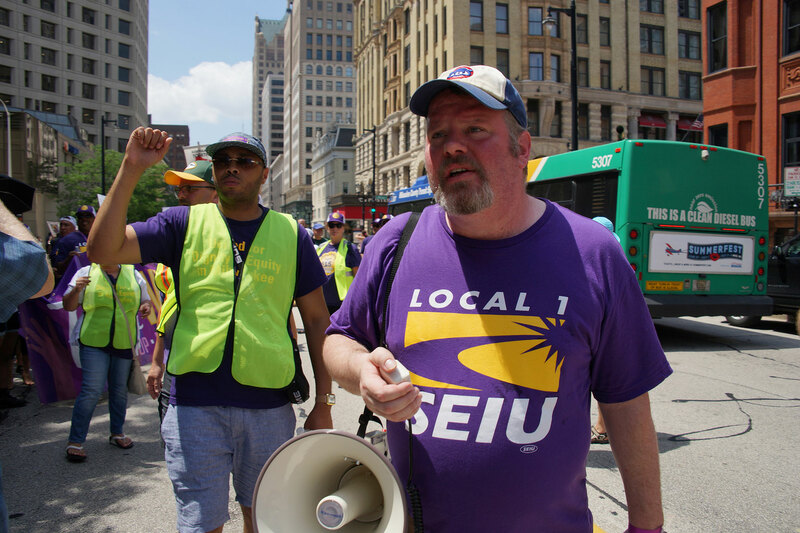 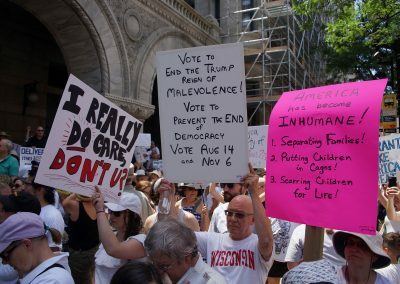 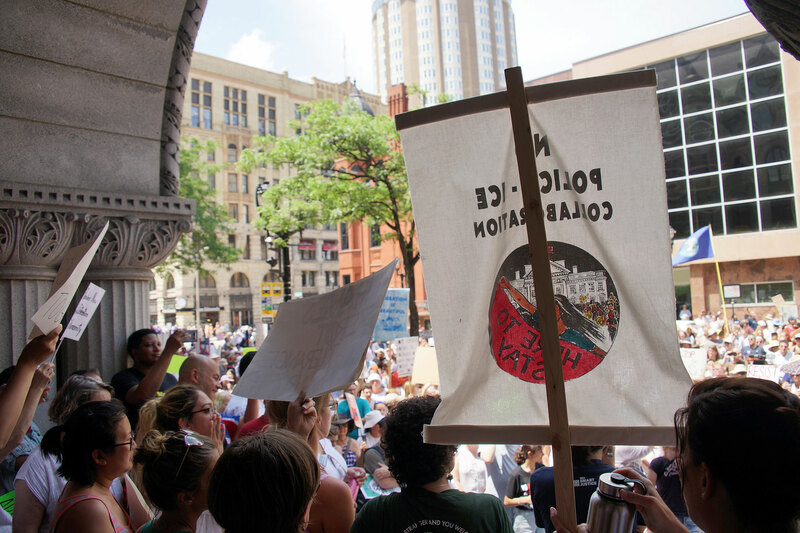 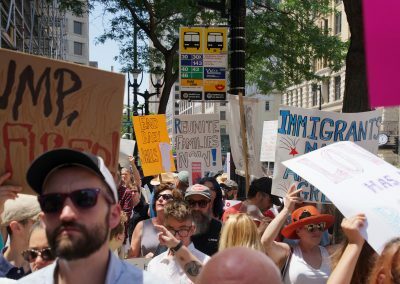 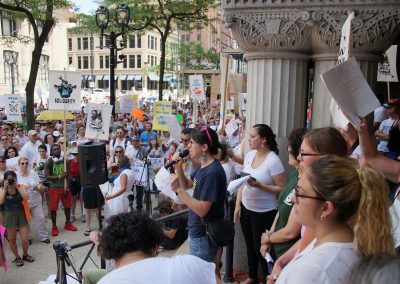 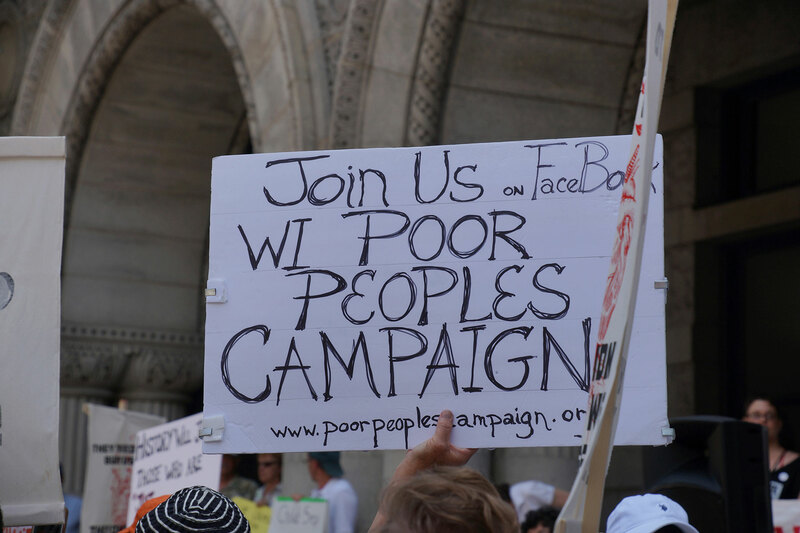 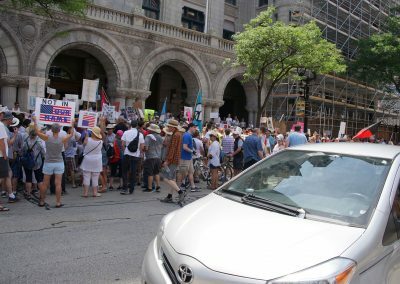 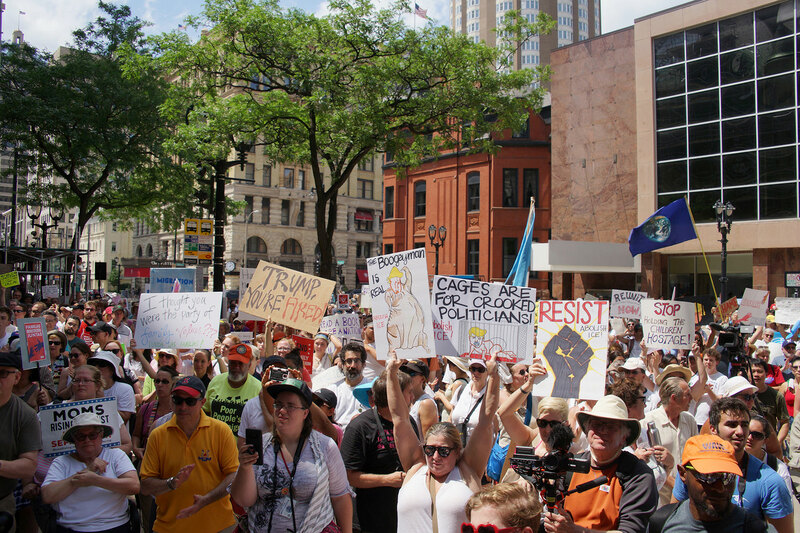 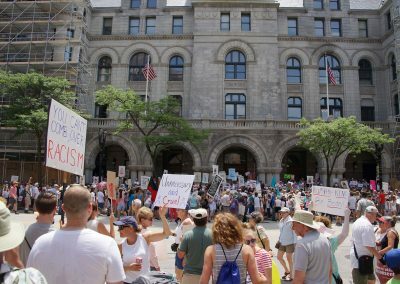 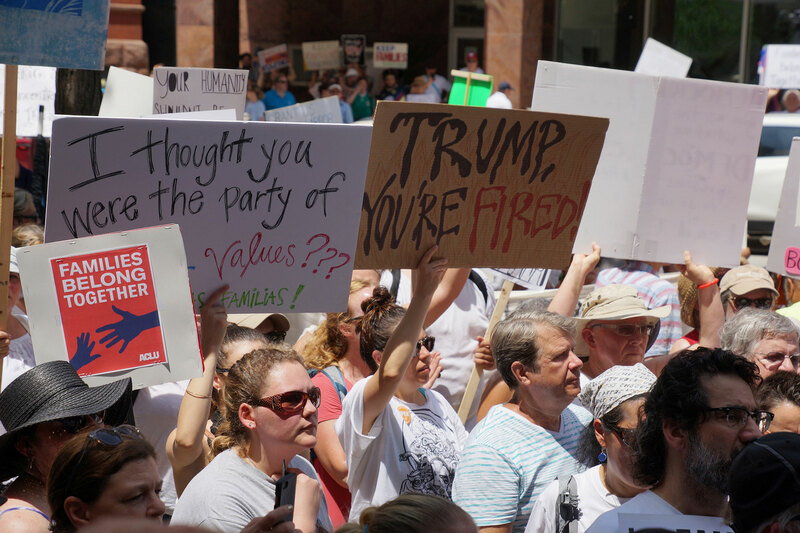 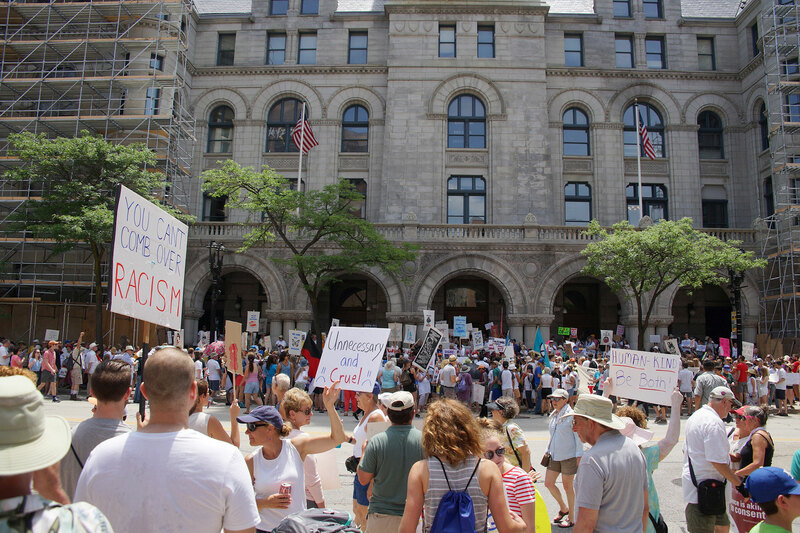 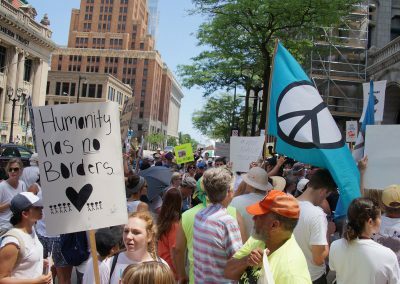 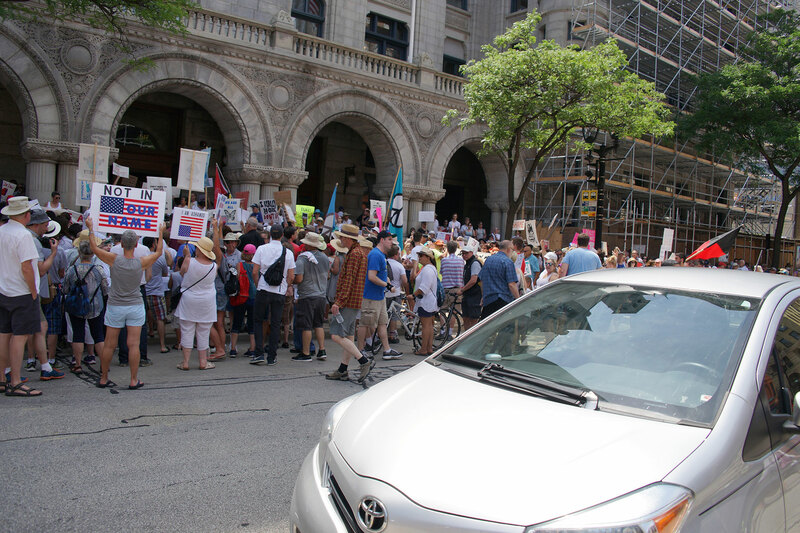 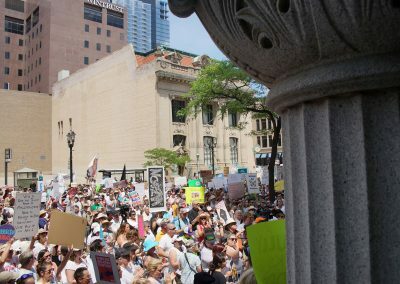 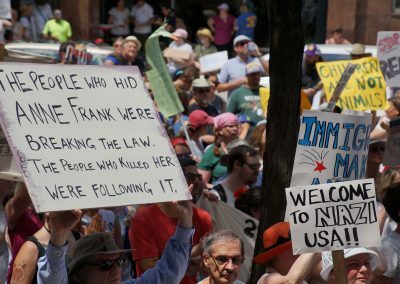 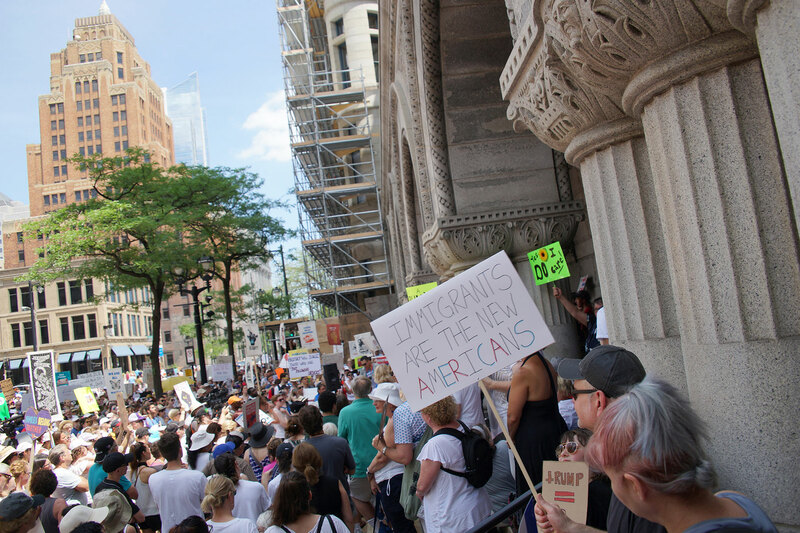 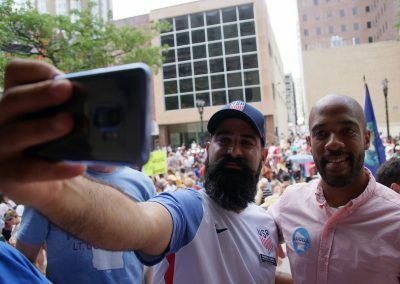 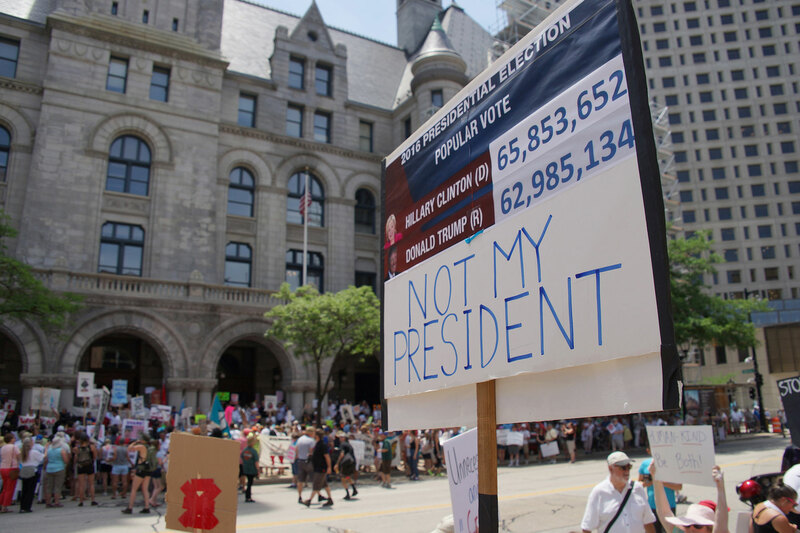 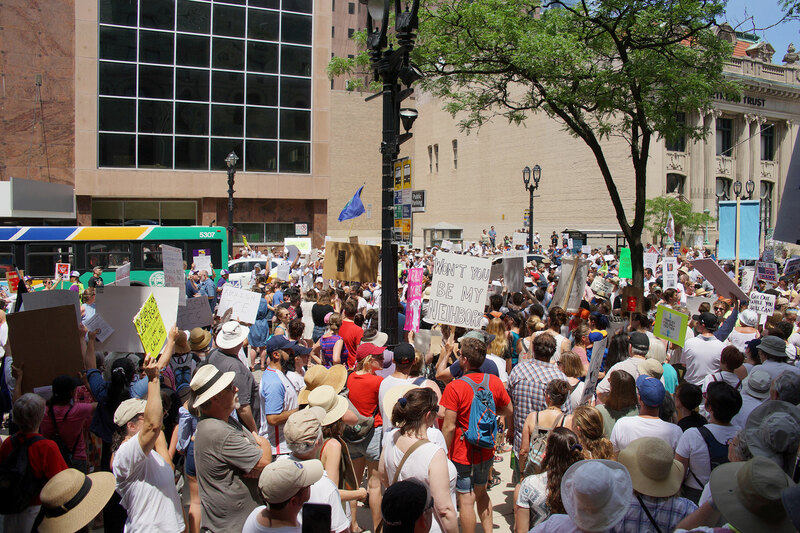 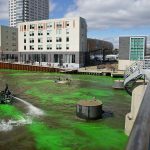 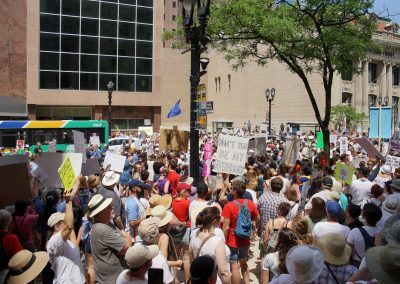 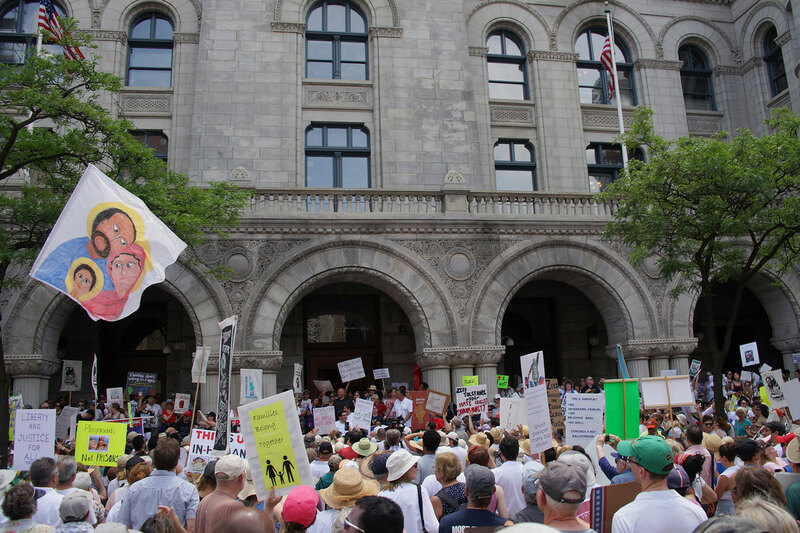 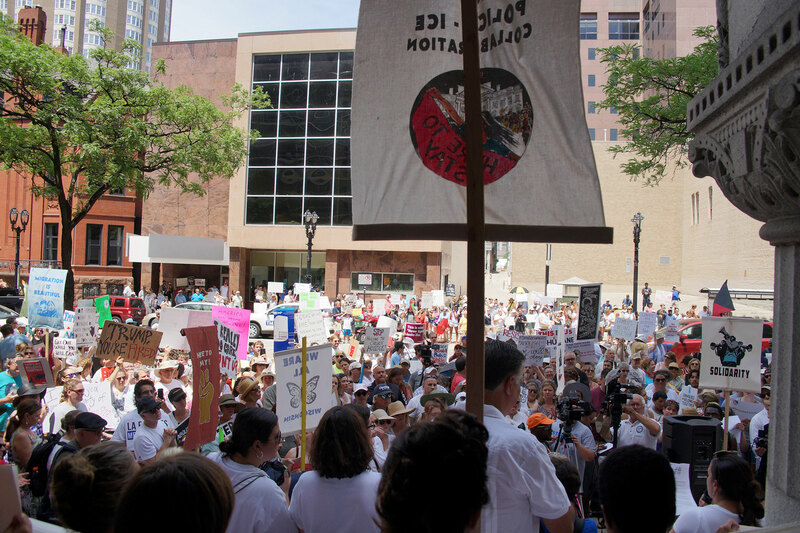 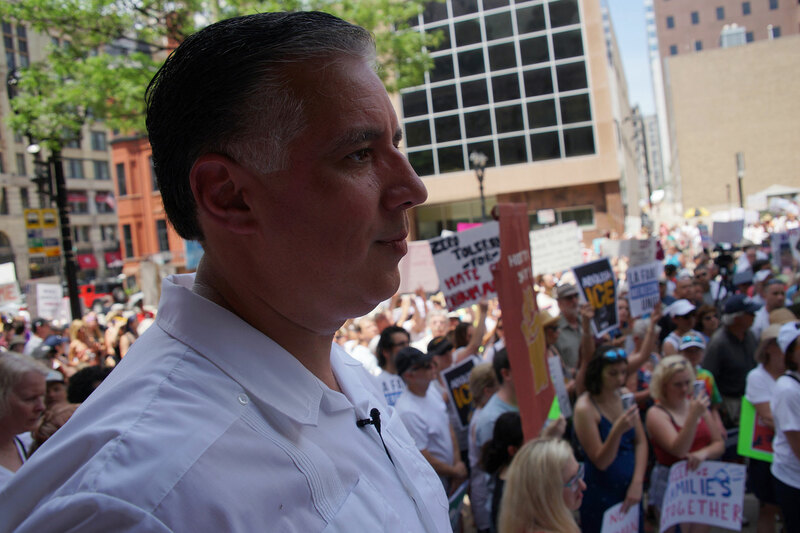 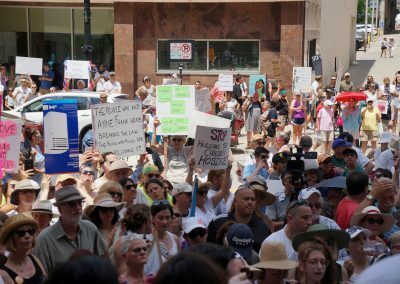 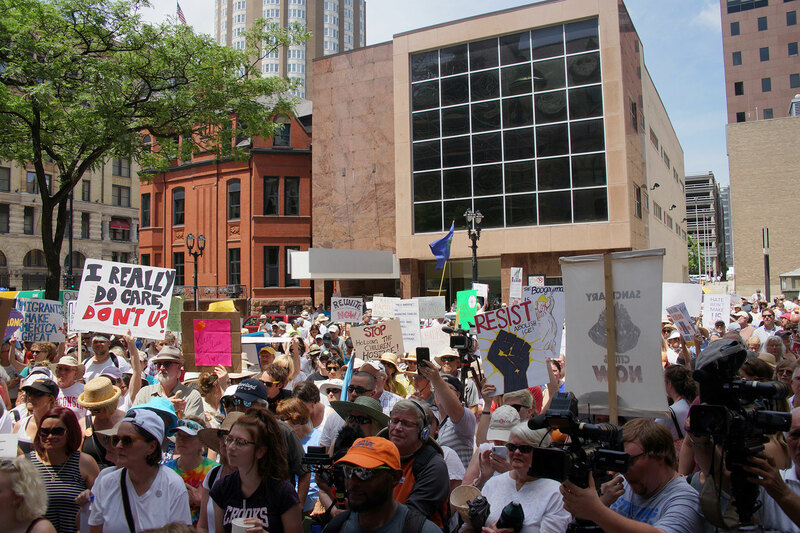 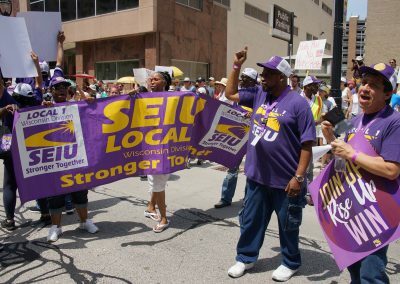 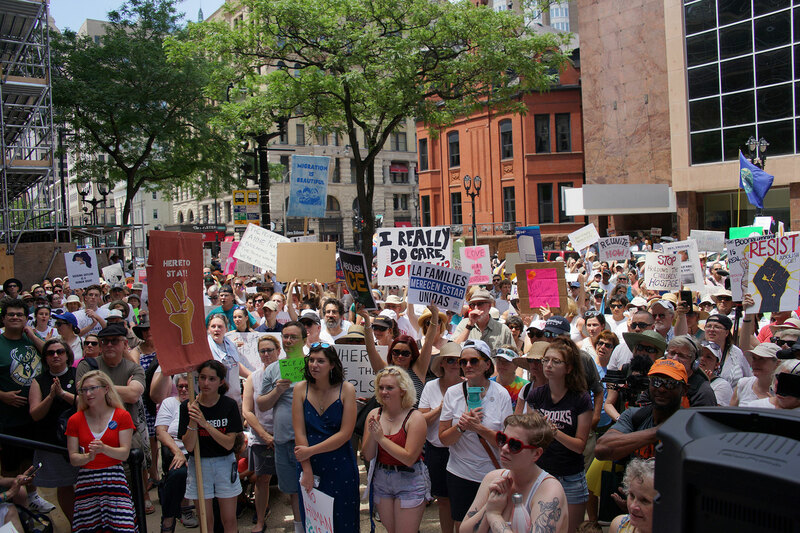 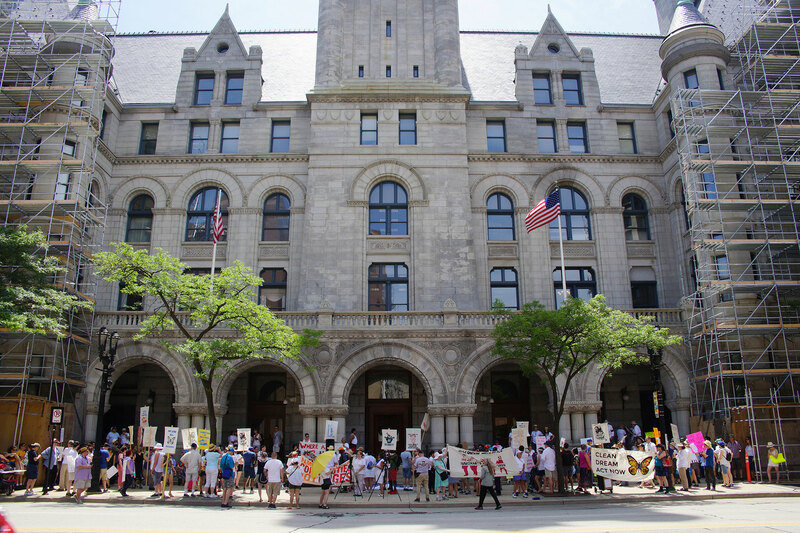 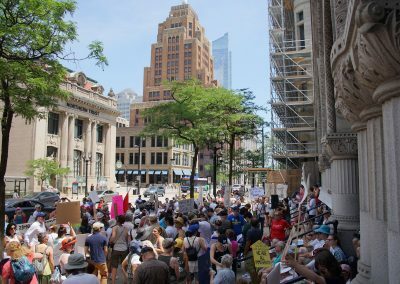 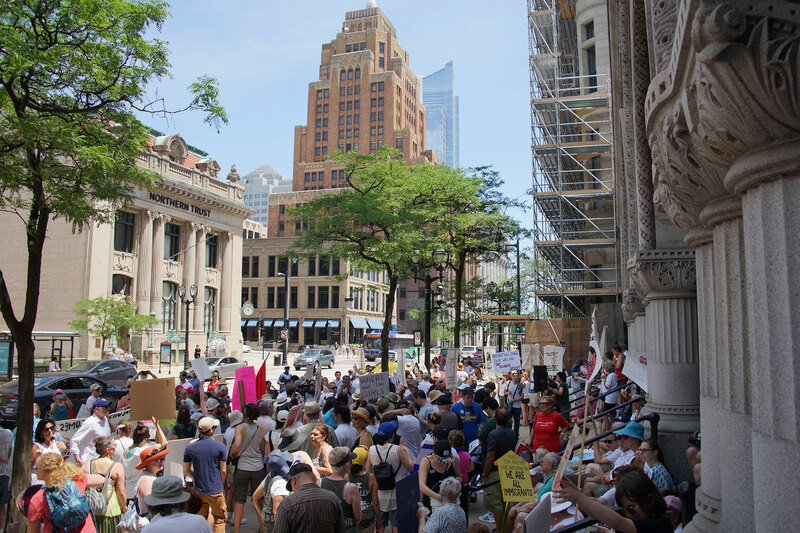 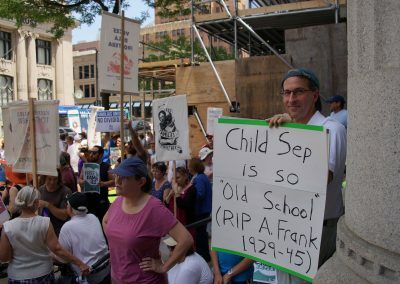 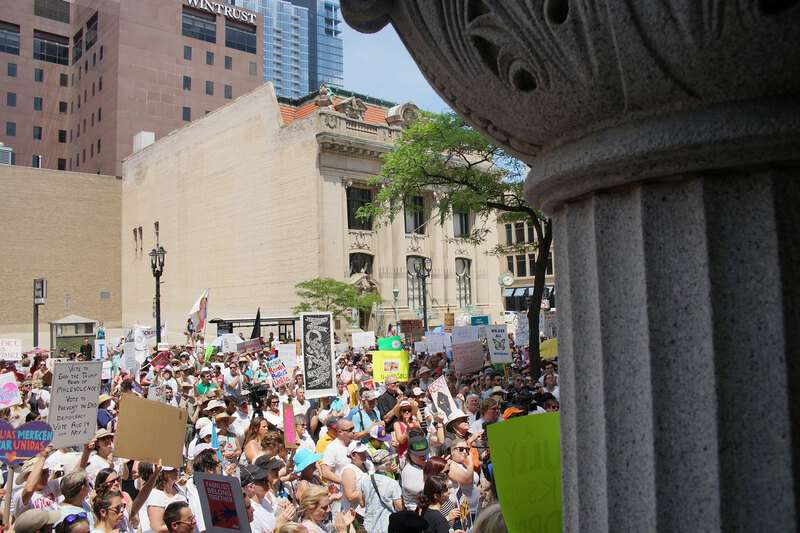 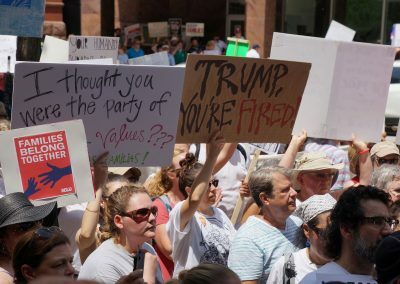 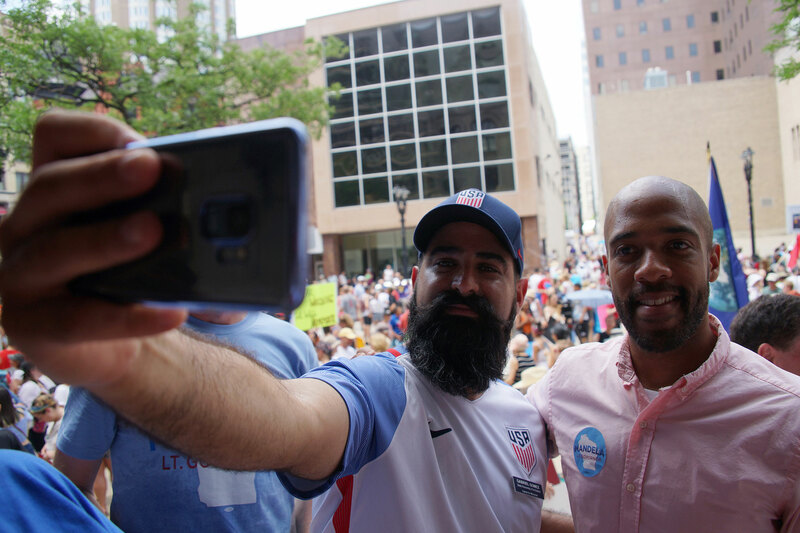 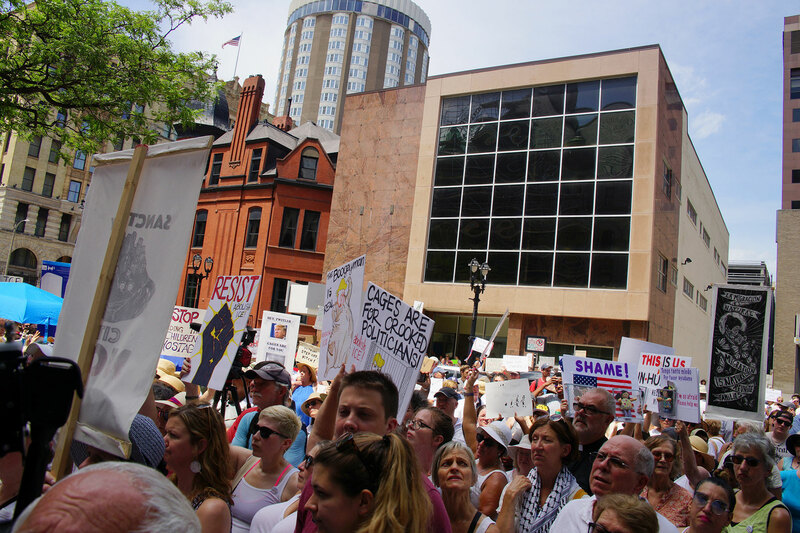 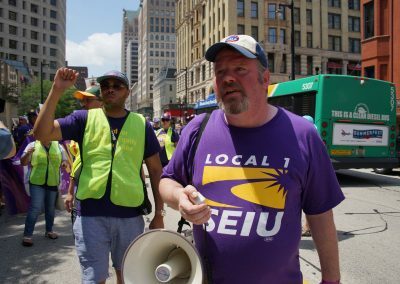 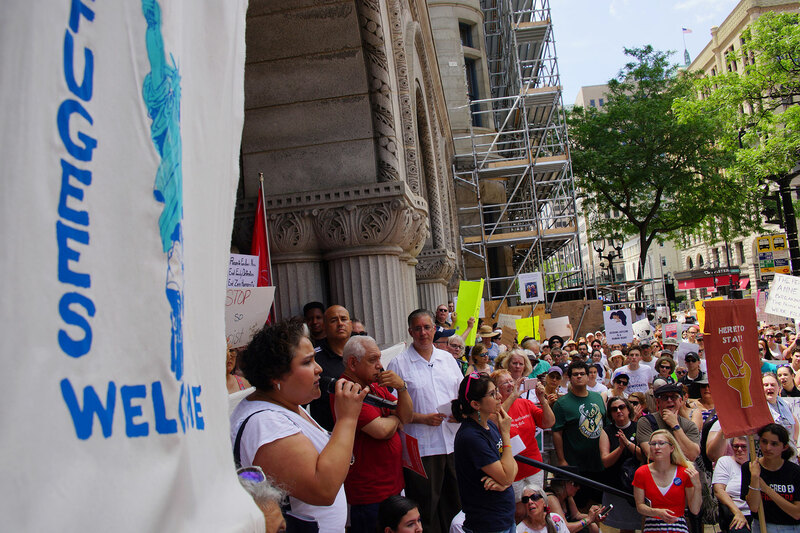 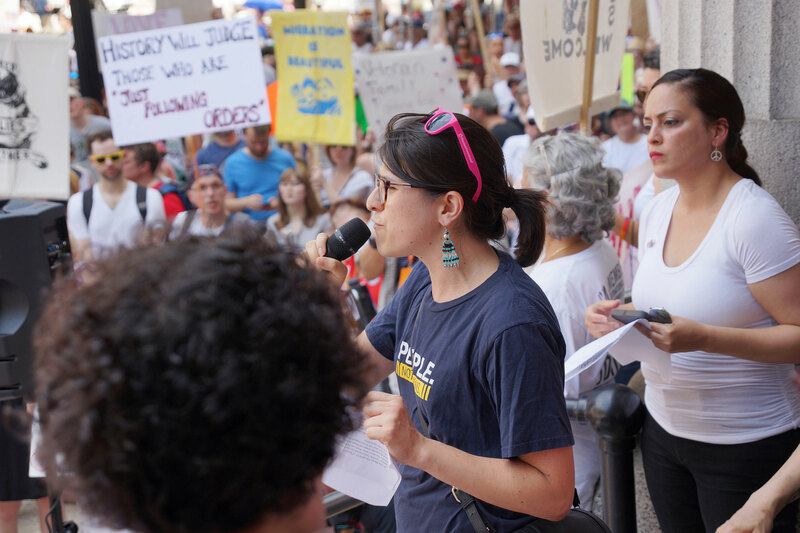 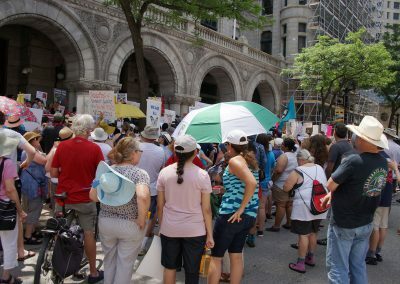 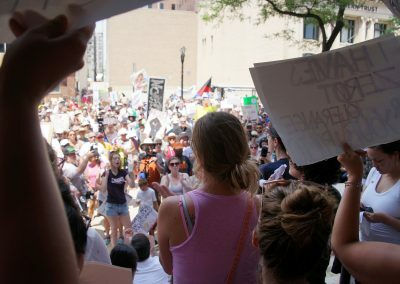 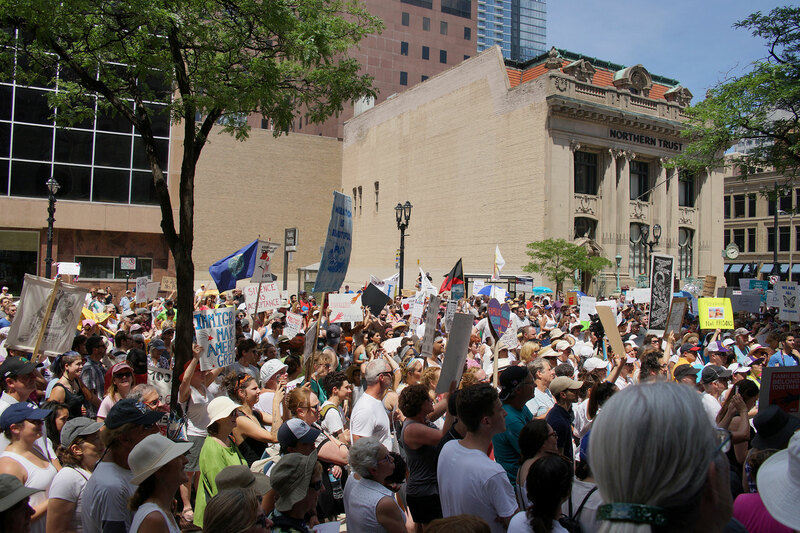 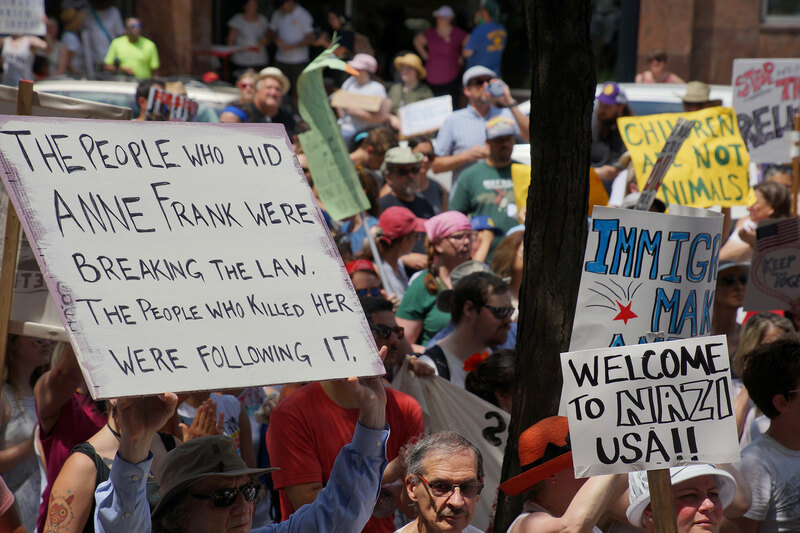 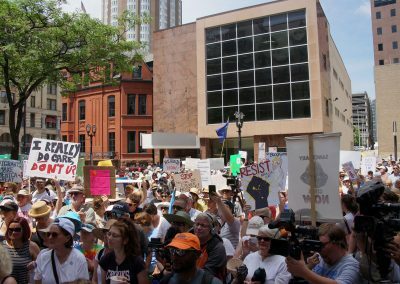 Hundreds of local activists and citizens of Milwaukee endured the heat and gathered outside the offices of U.S. 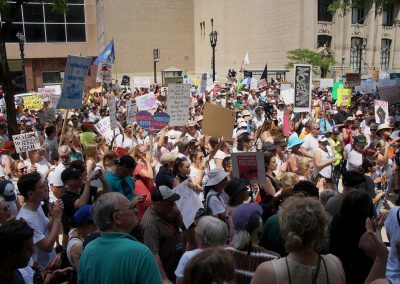 Senator Ron Johnson at the Federal Building, closing off a block of Wisconsin Avenue due to the massive size of the crowd. 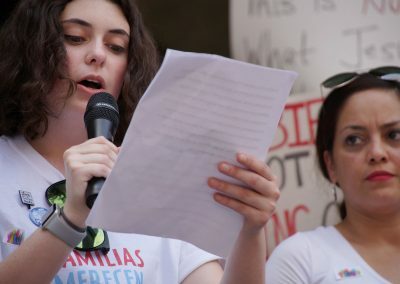 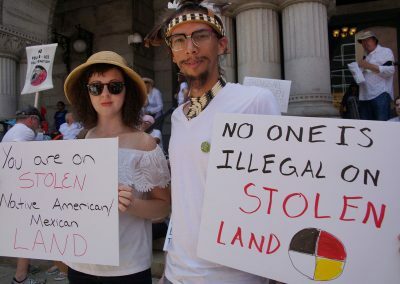 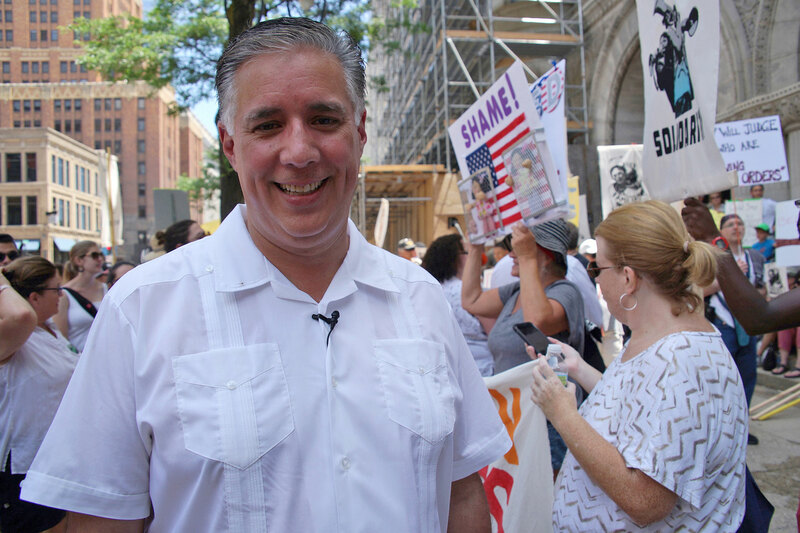 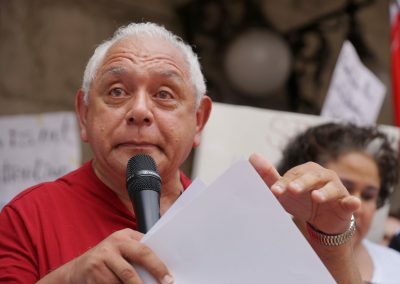 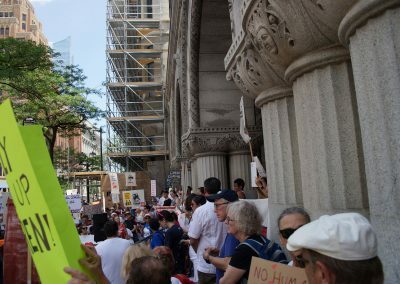 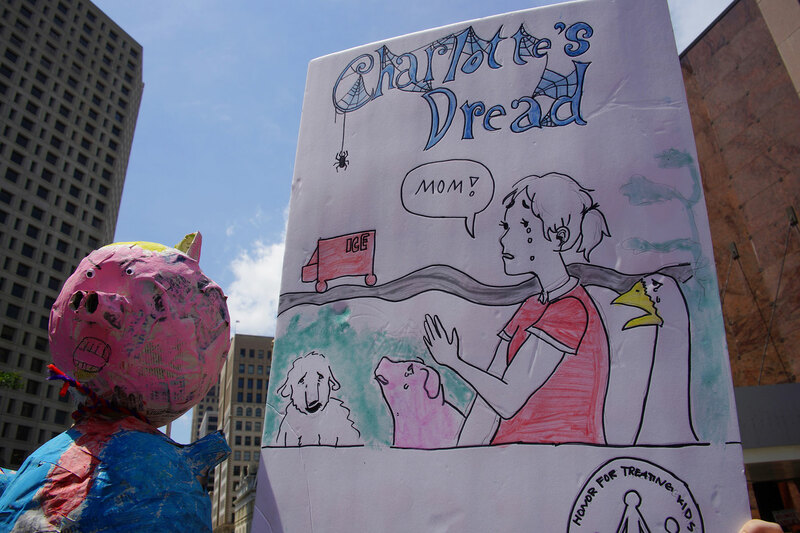 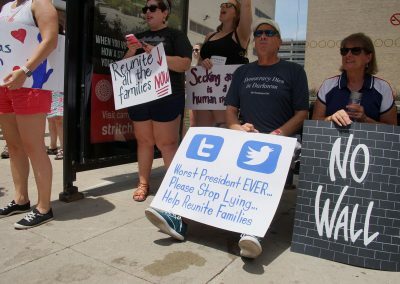 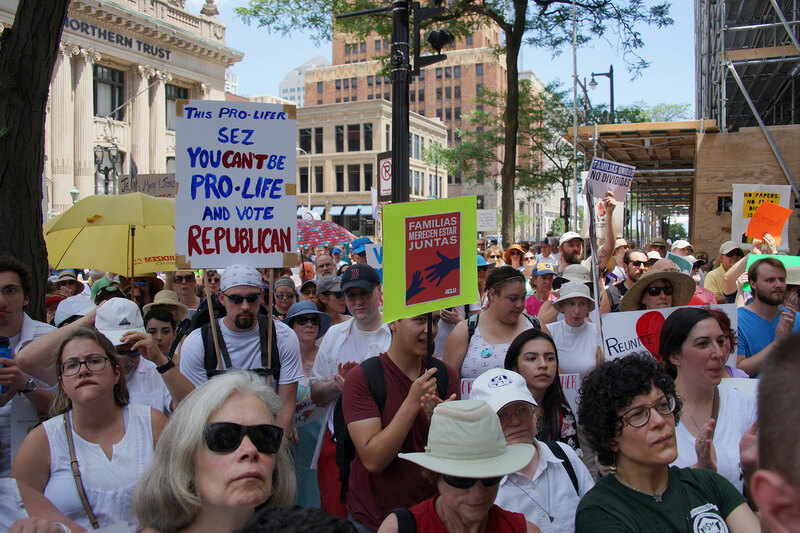 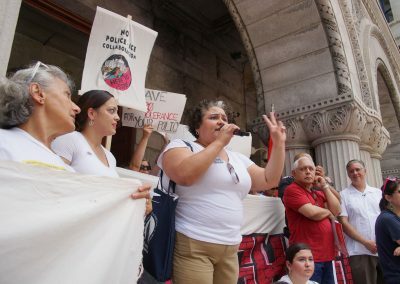 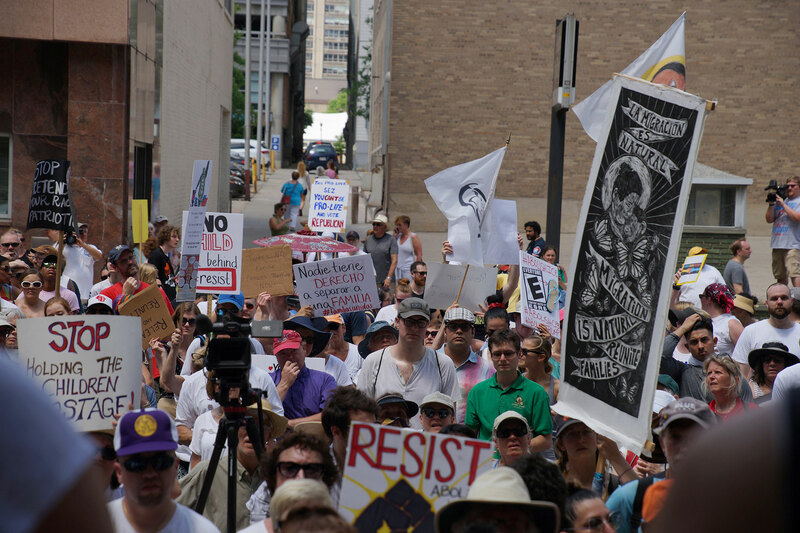 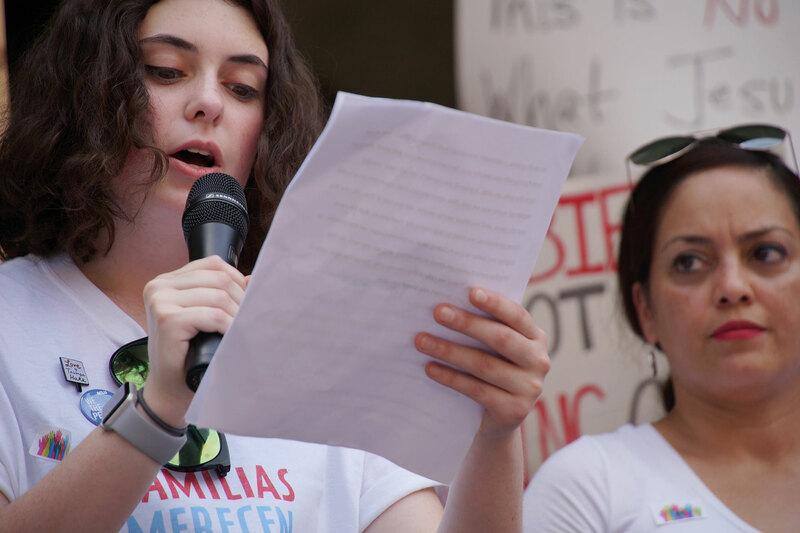 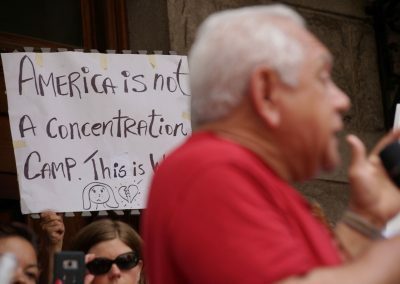 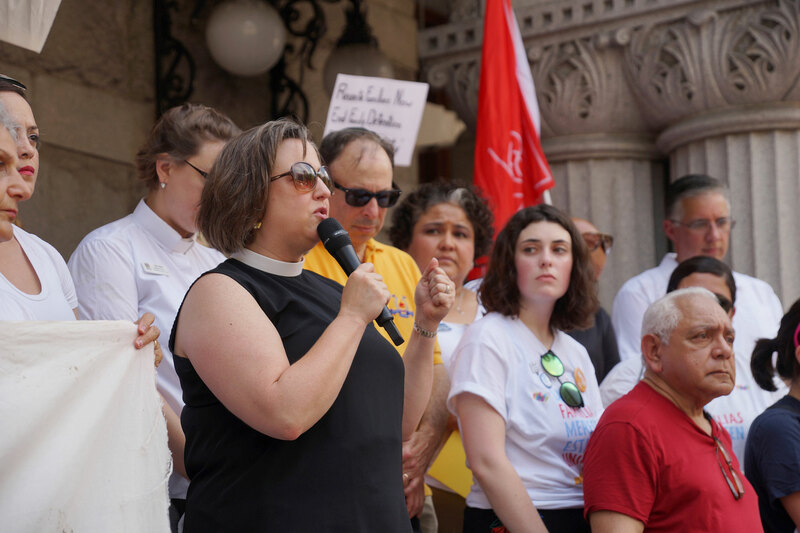 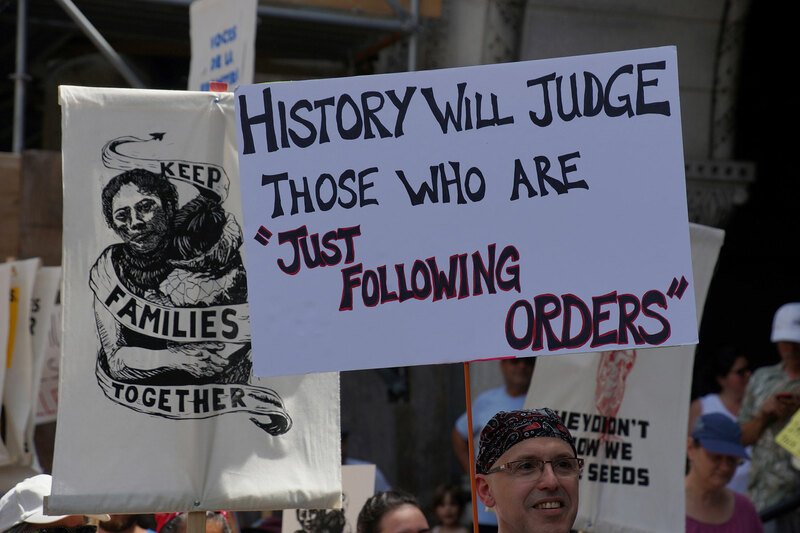 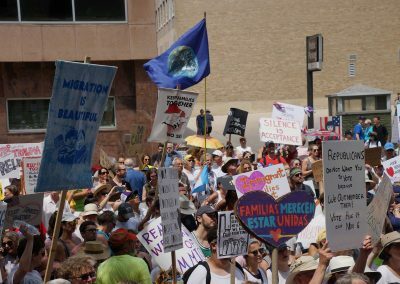 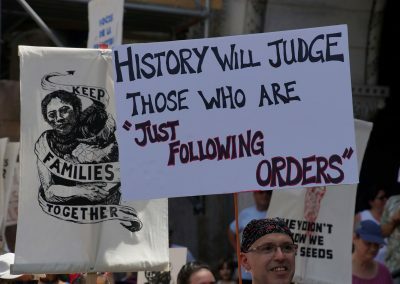 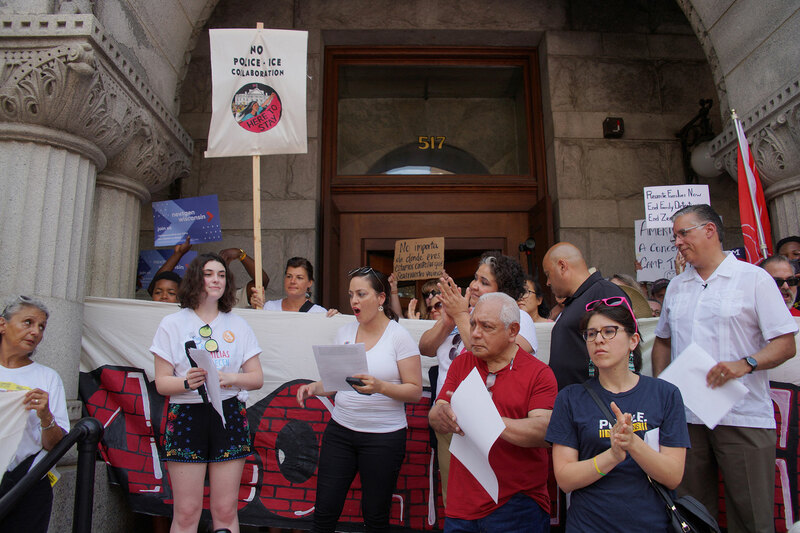 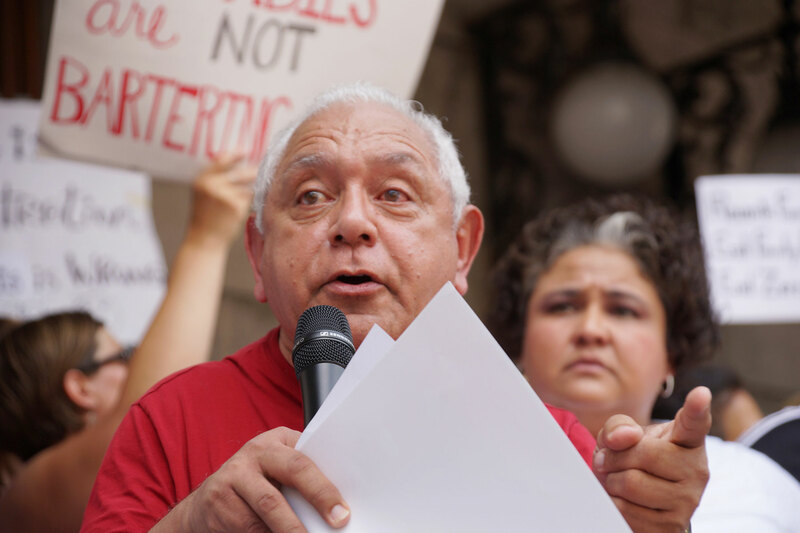 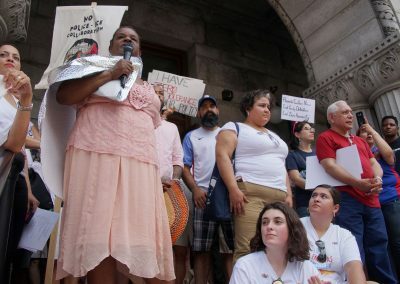 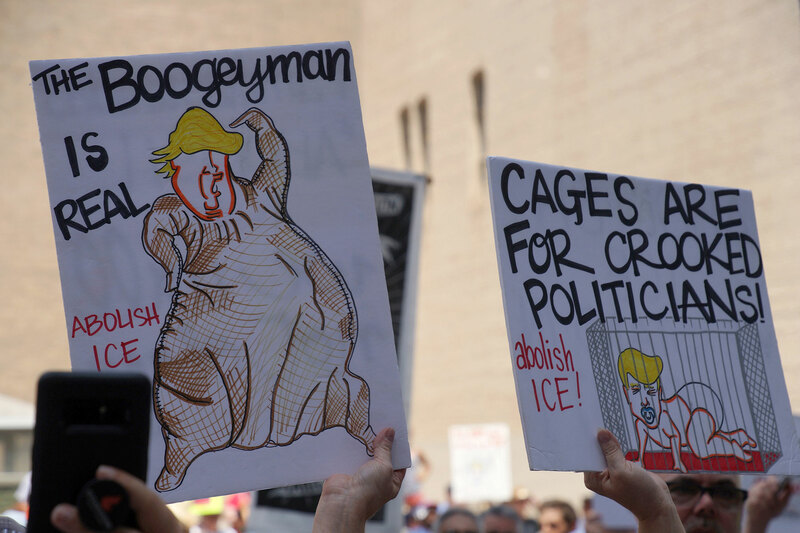 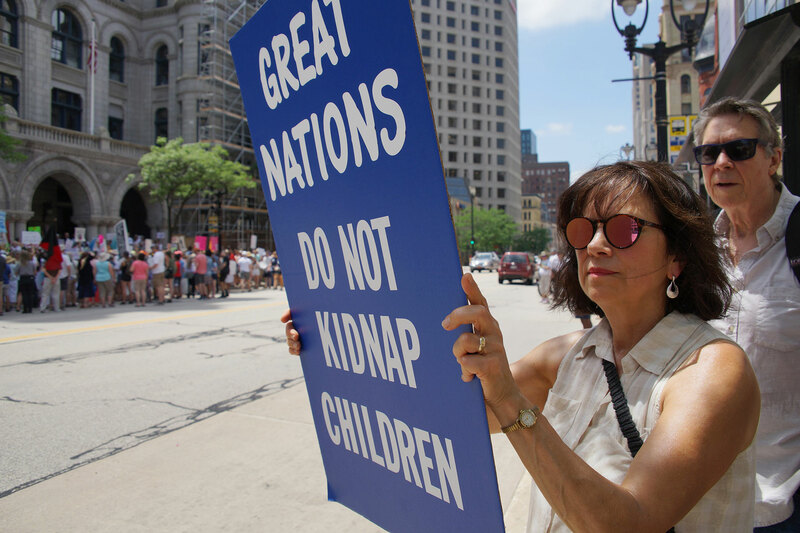 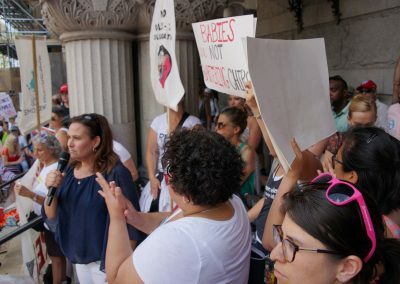 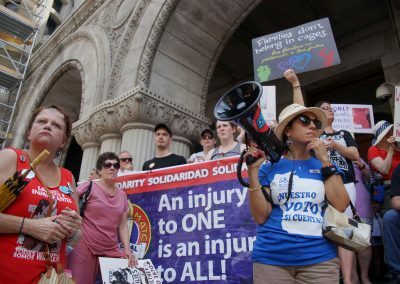 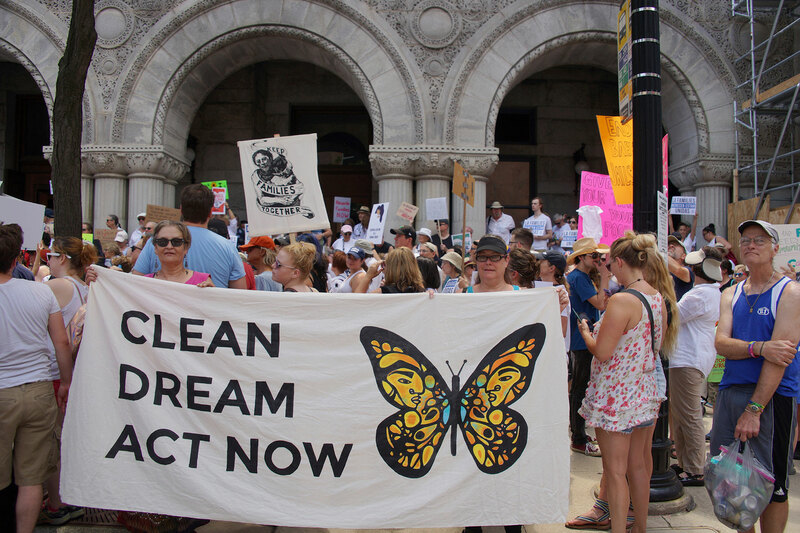 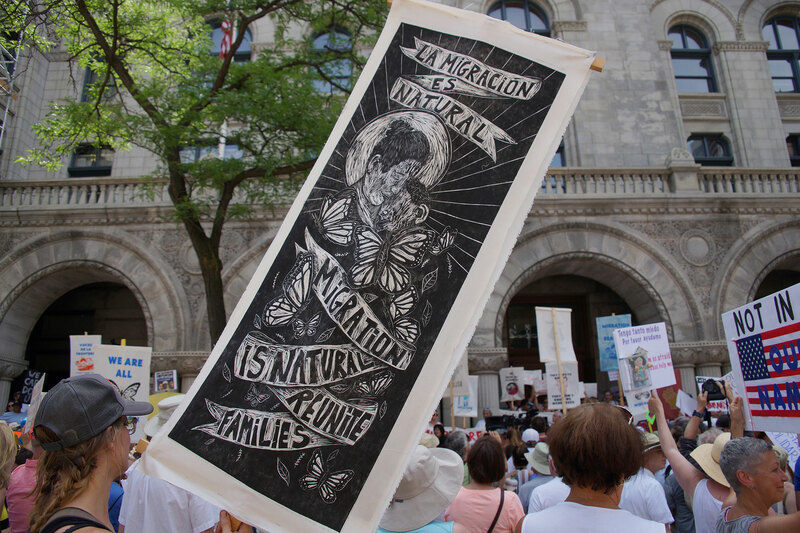 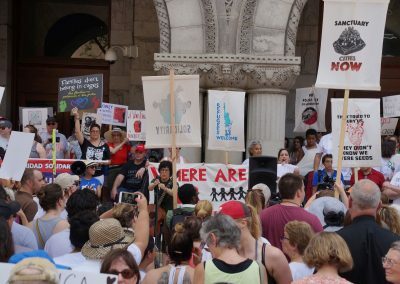 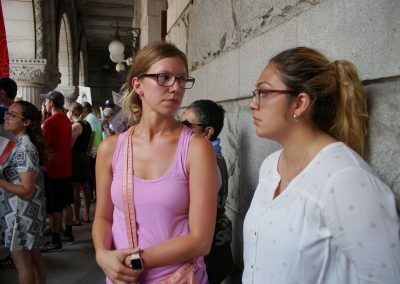 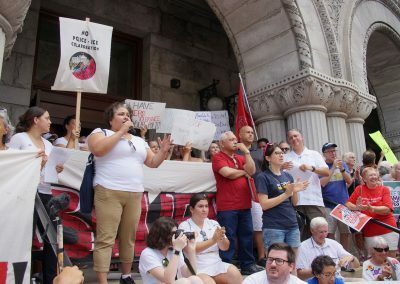 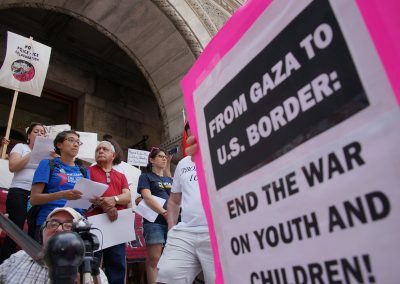 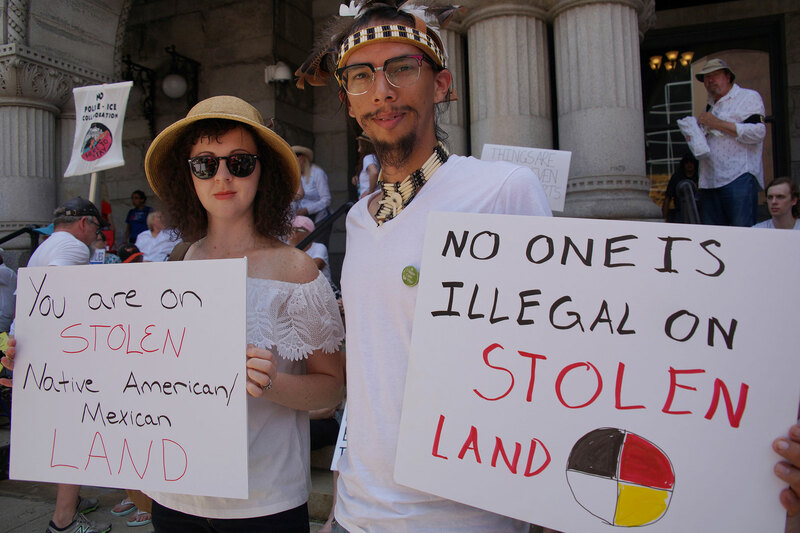 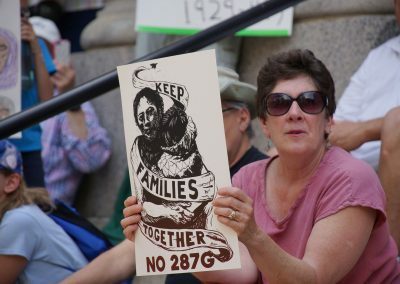 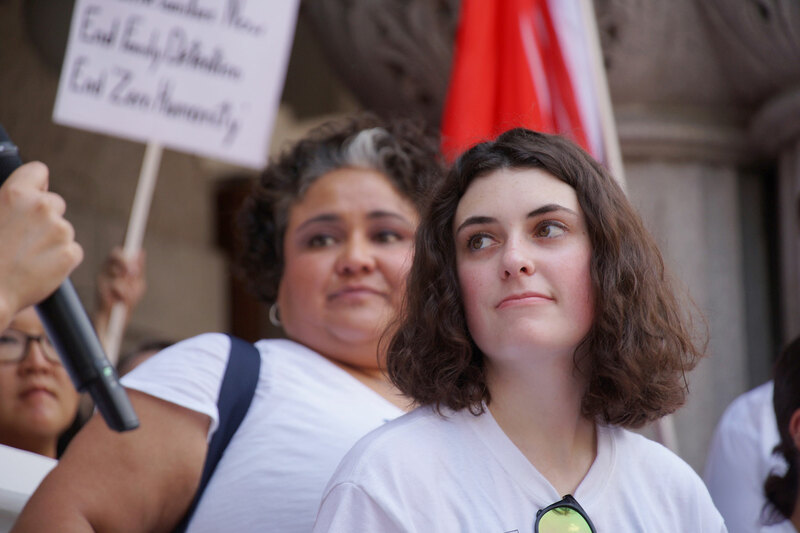 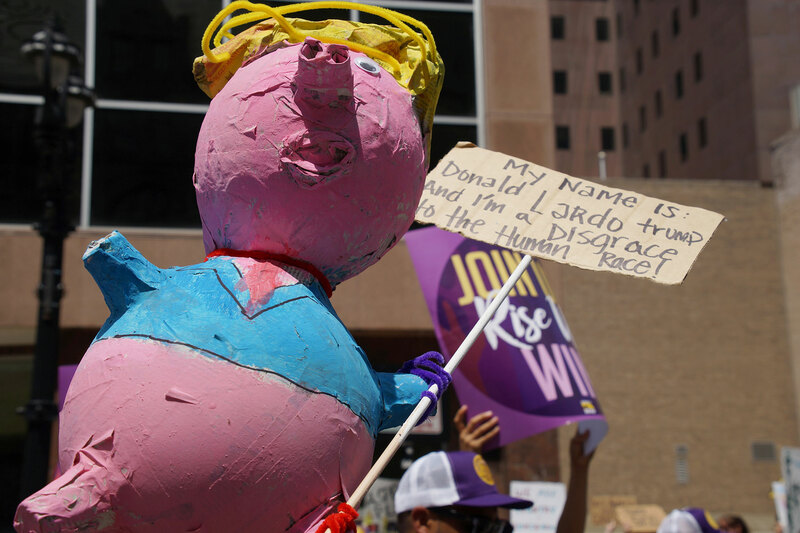 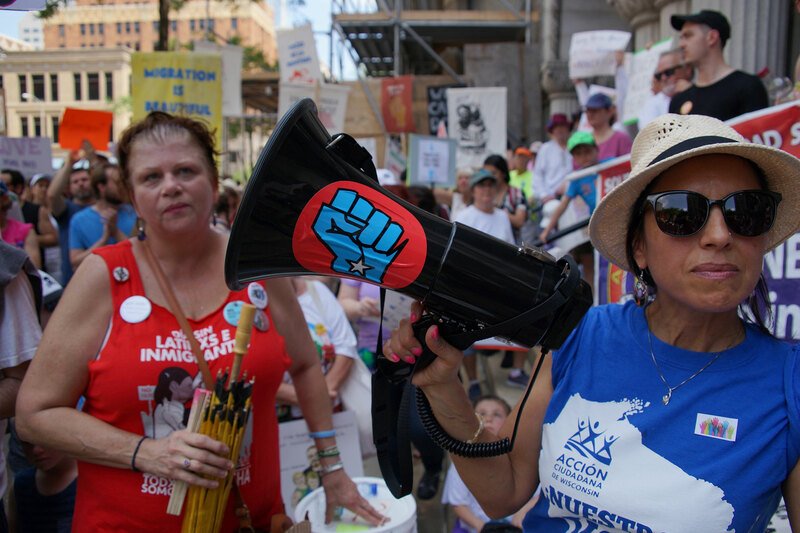 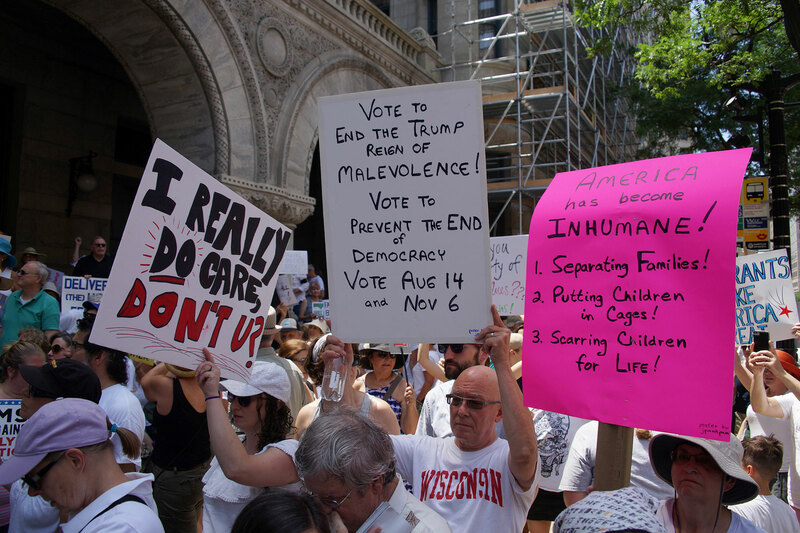 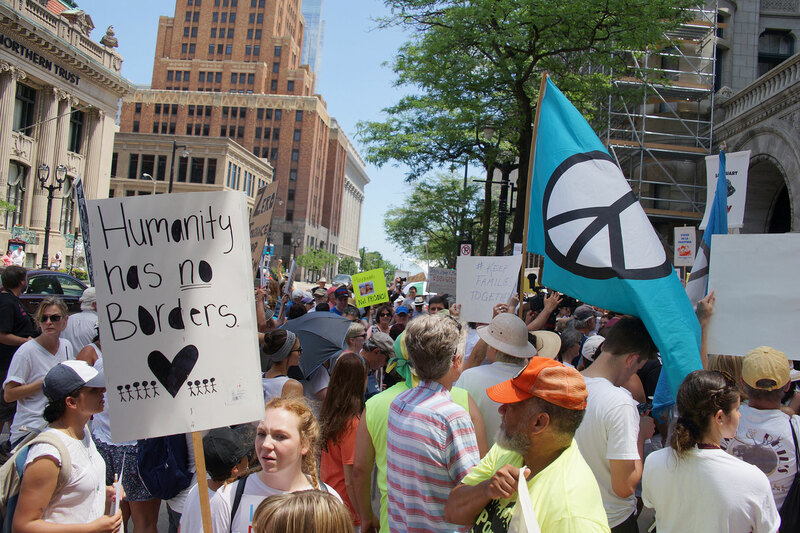 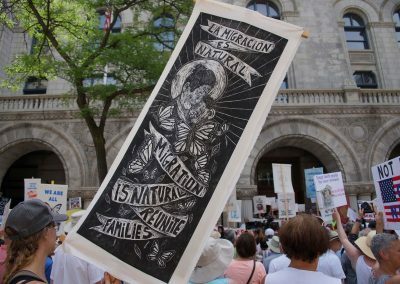 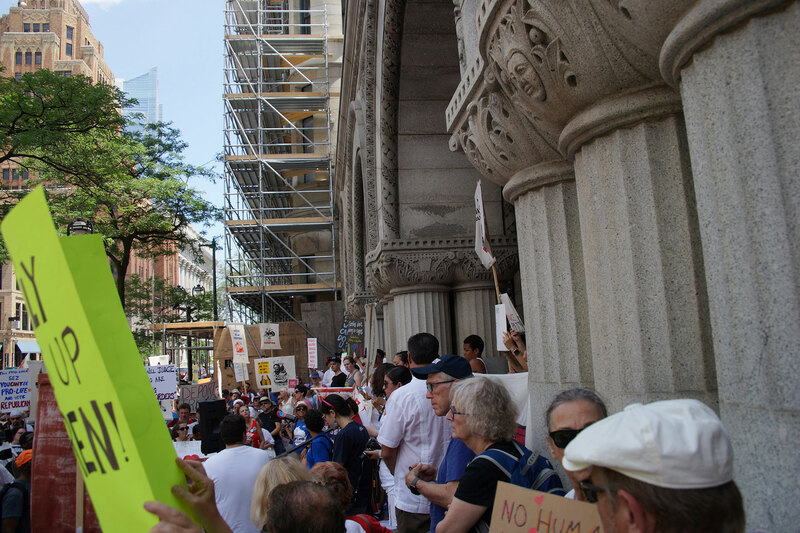 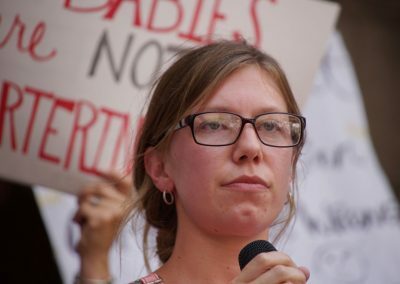 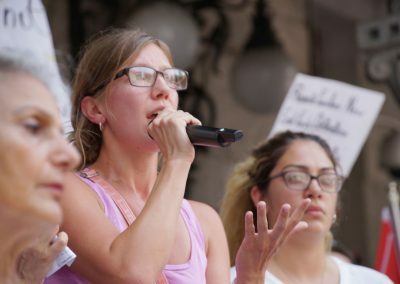 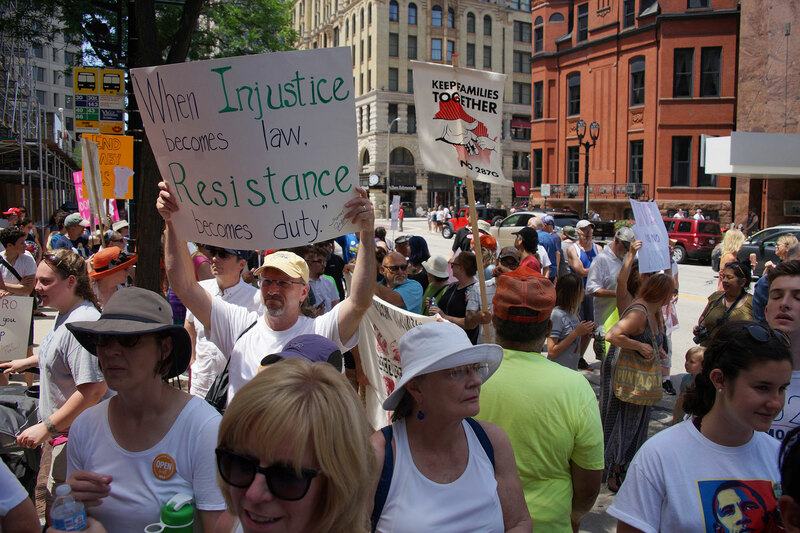 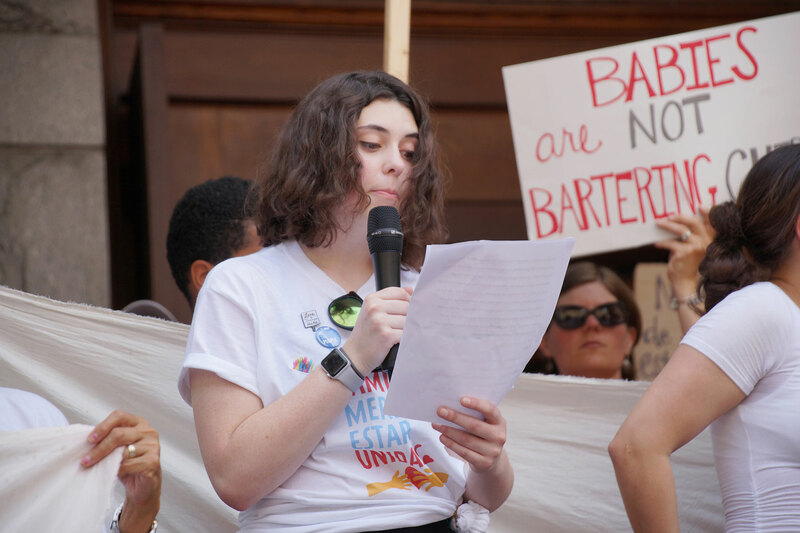 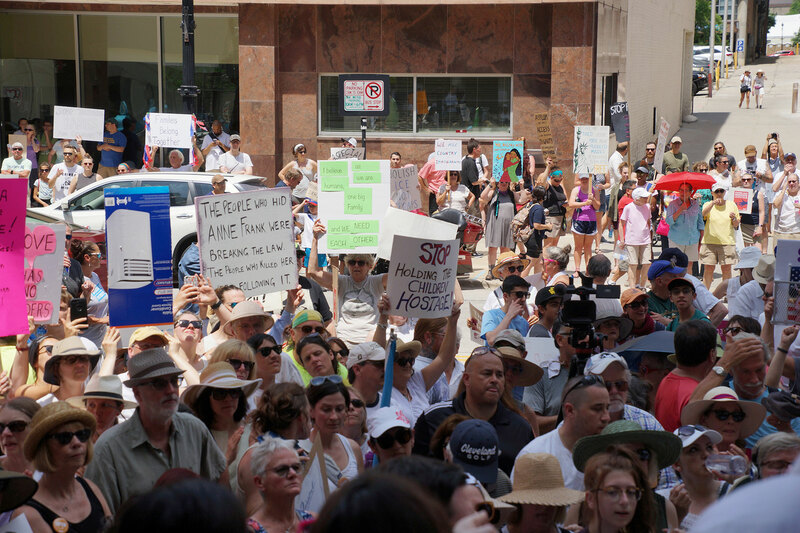 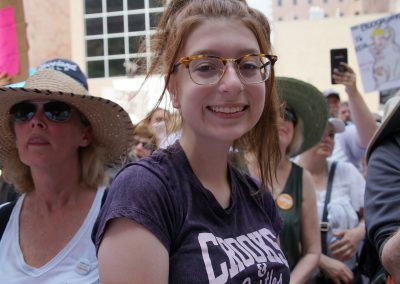 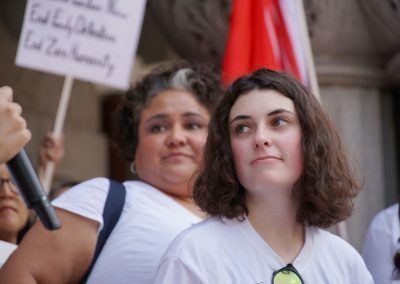 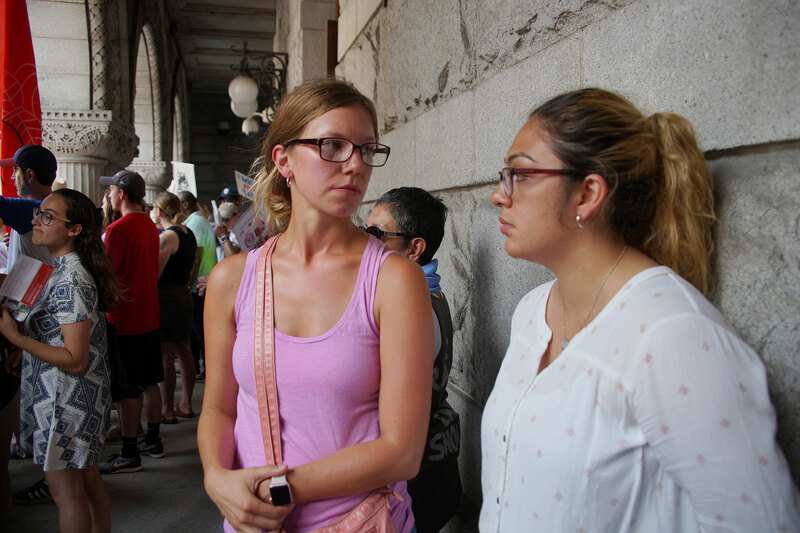 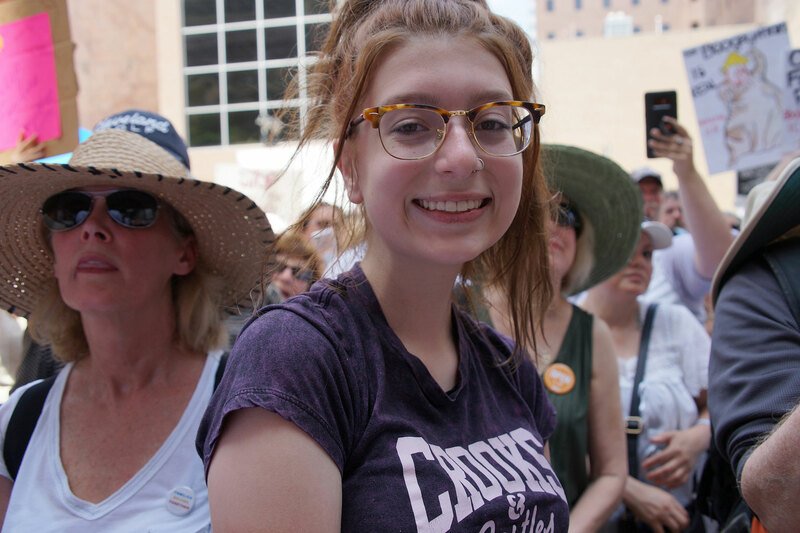 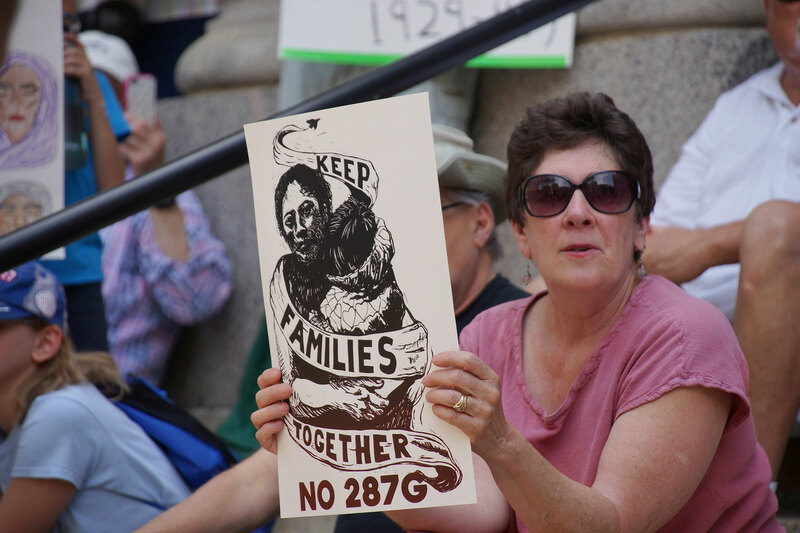 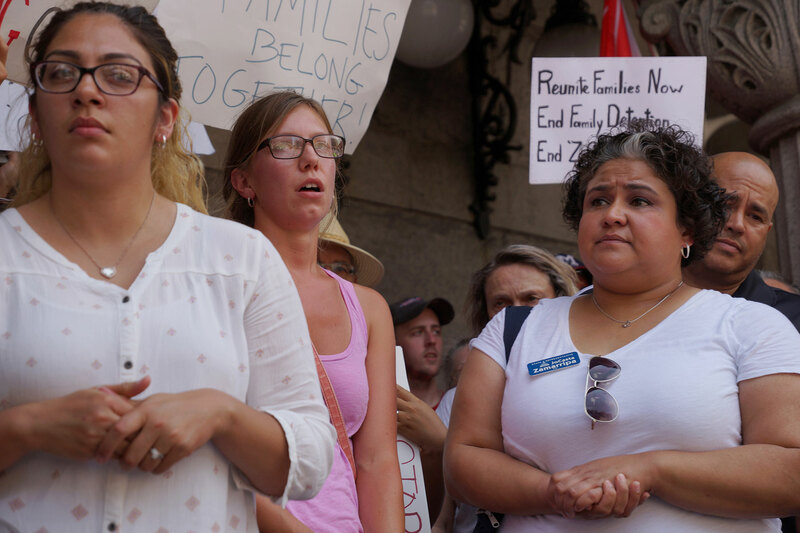 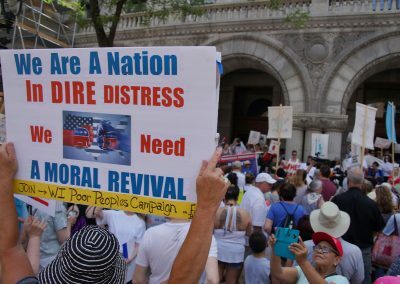 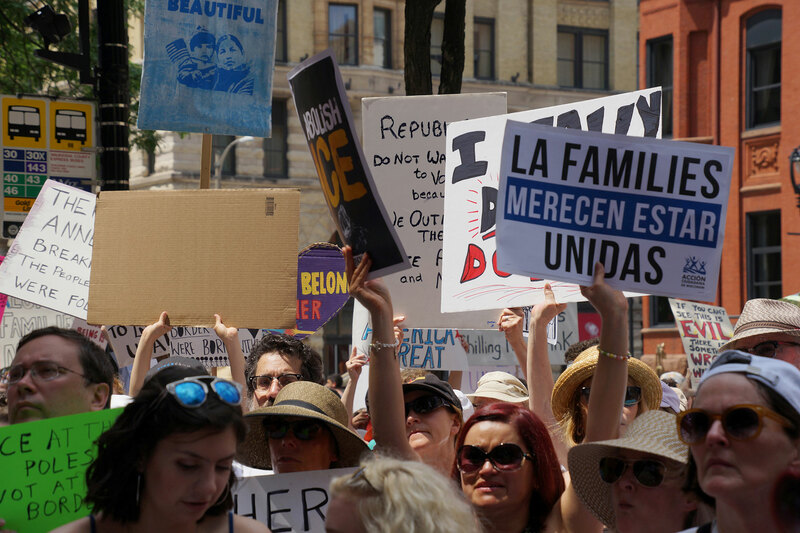 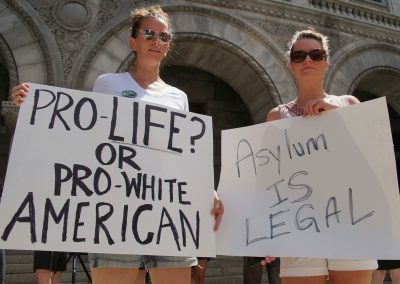 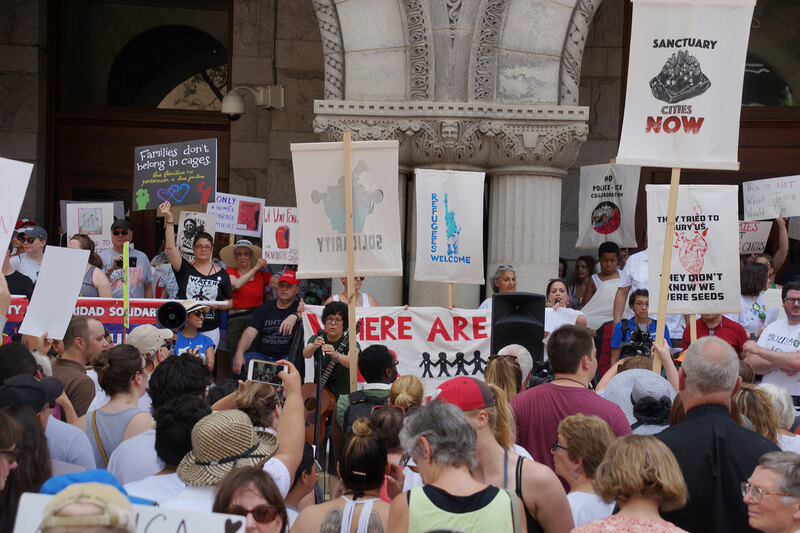 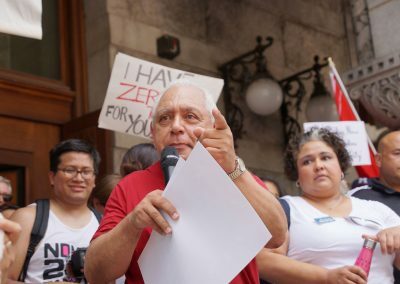 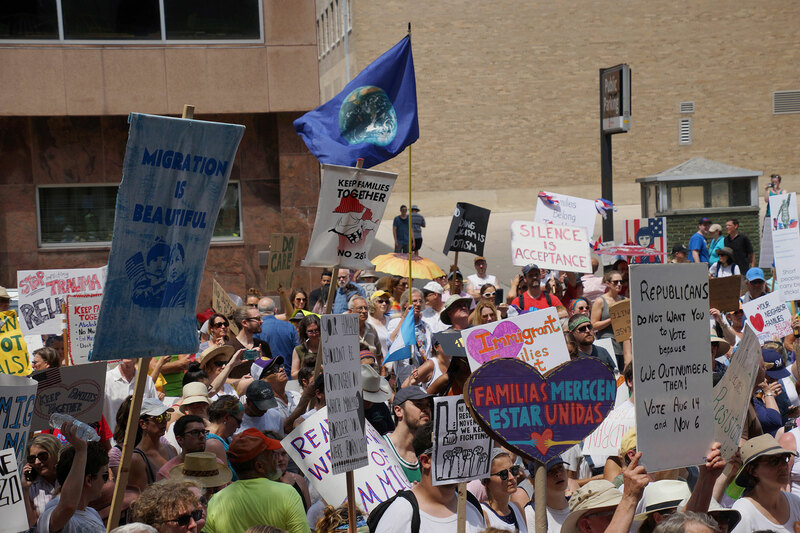 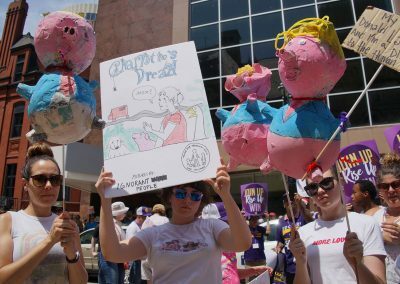 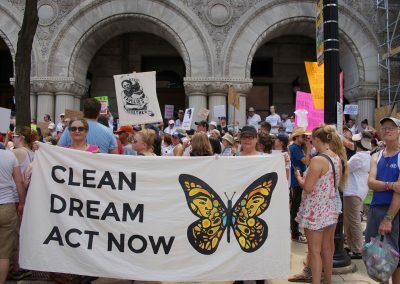 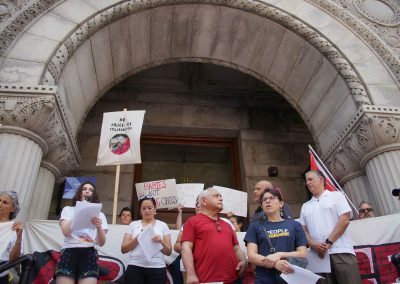 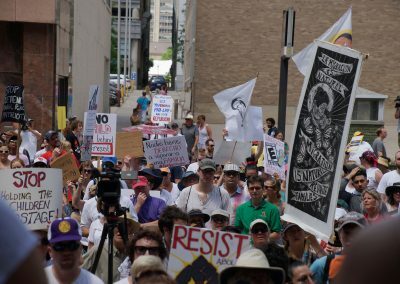 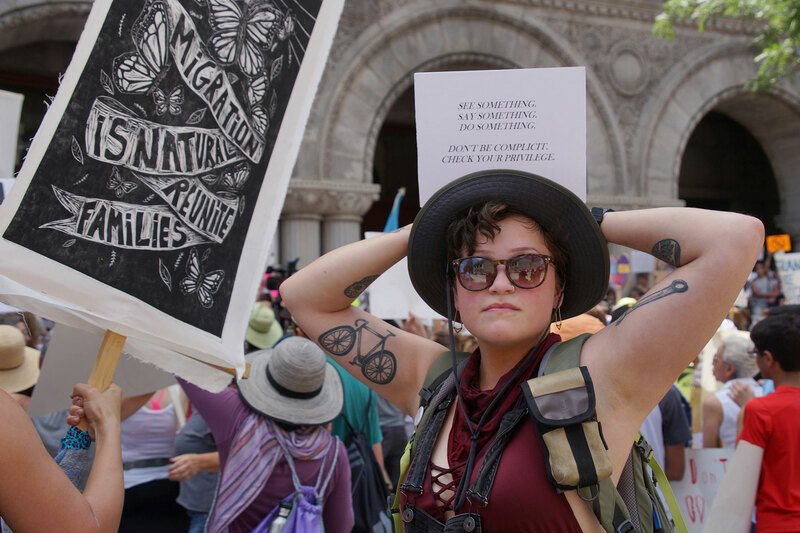 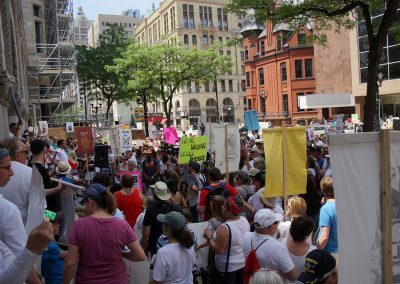 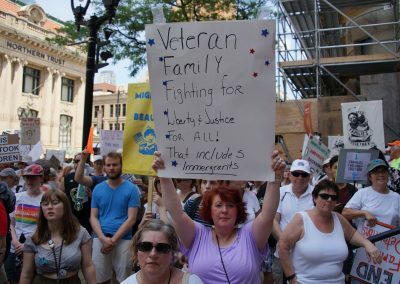 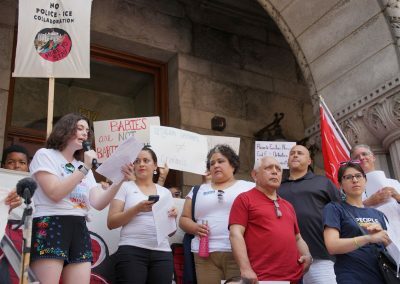 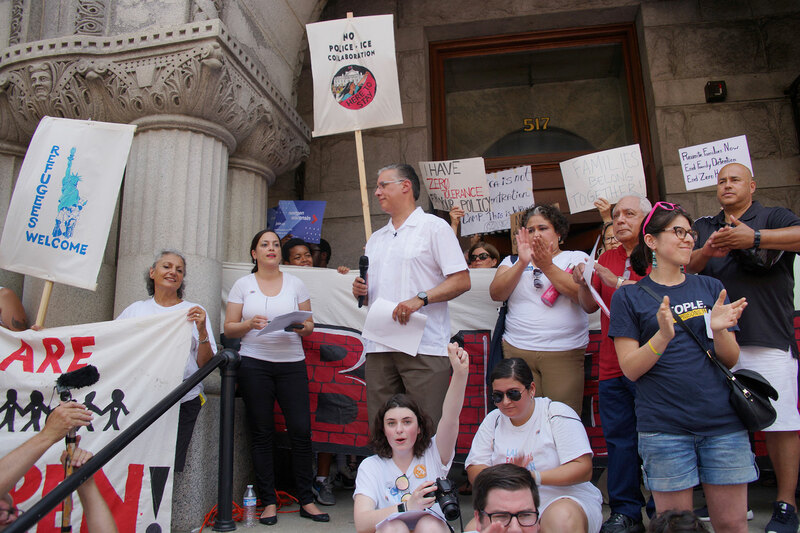 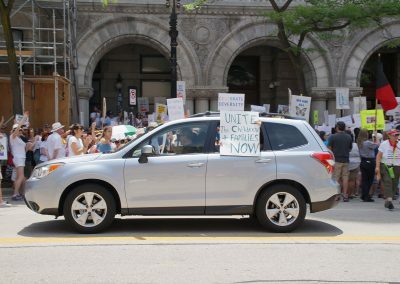 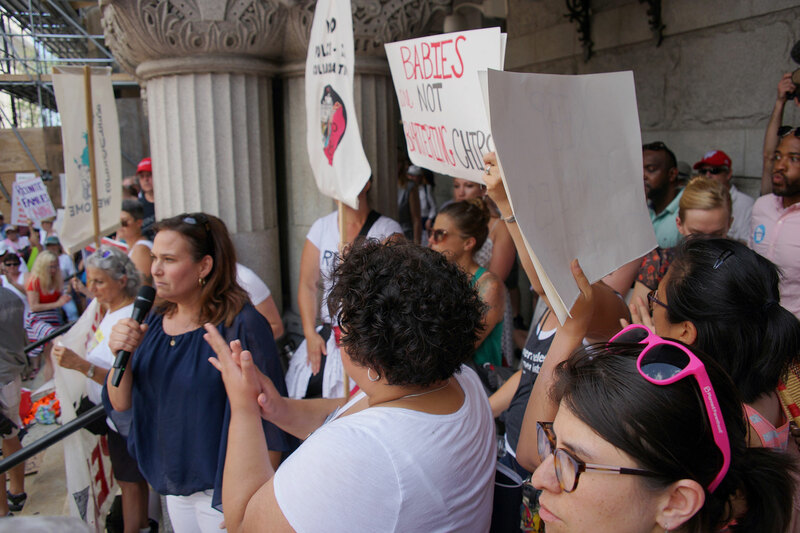 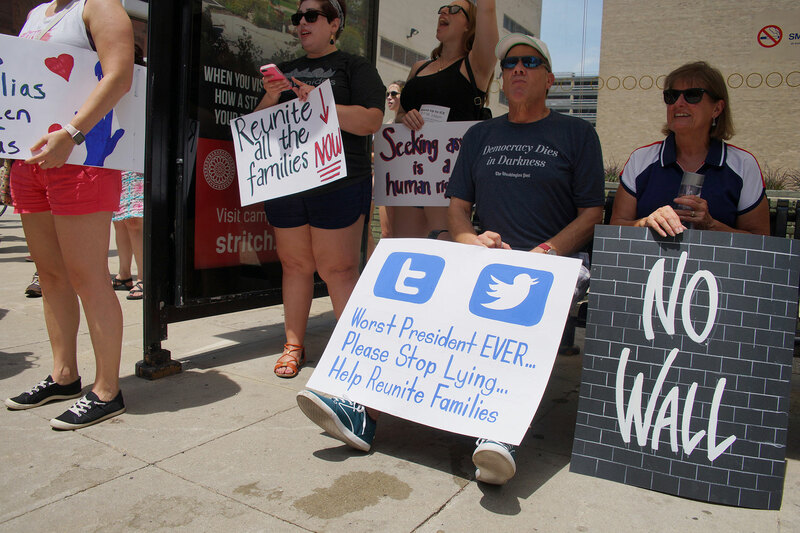 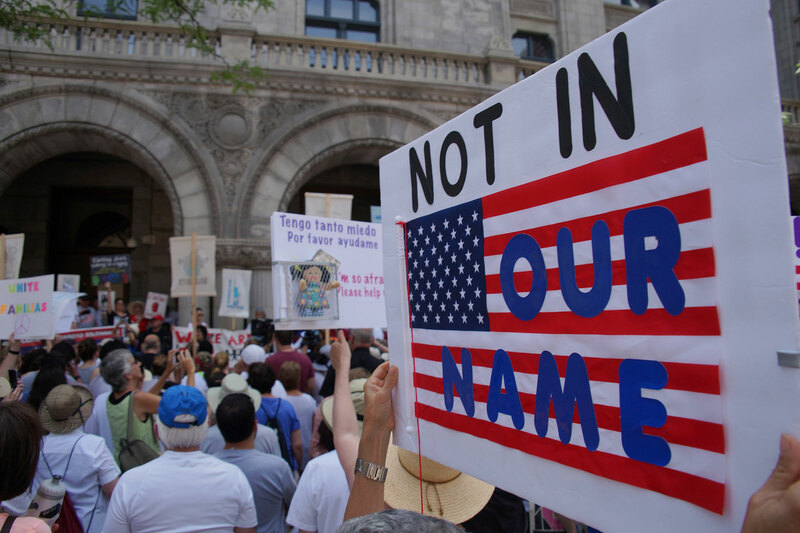 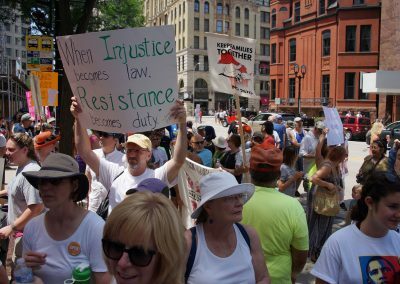 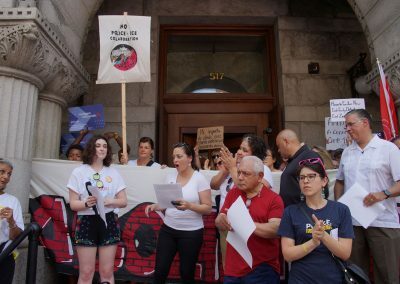 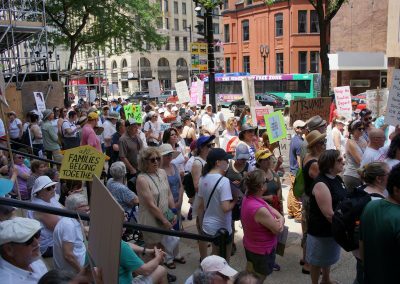 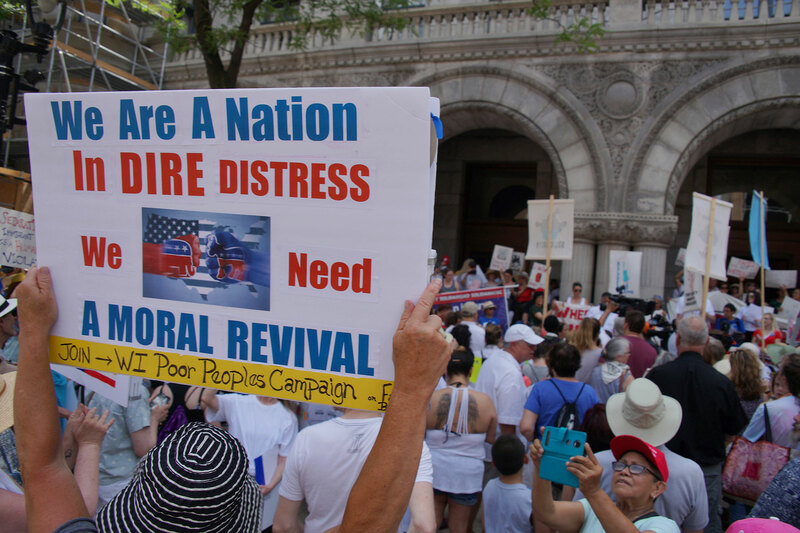 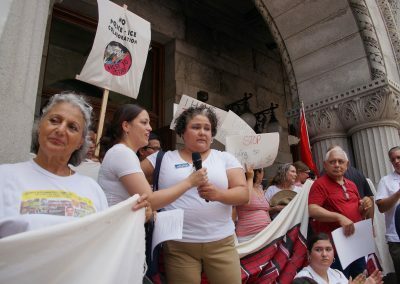 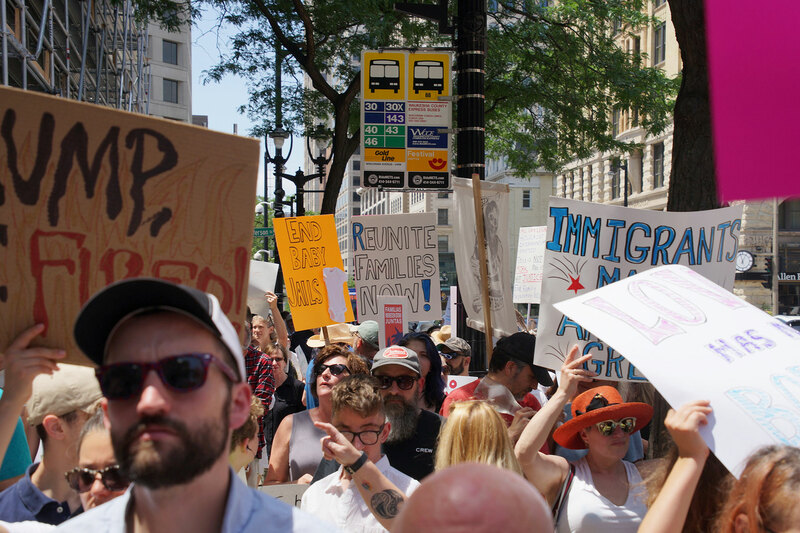 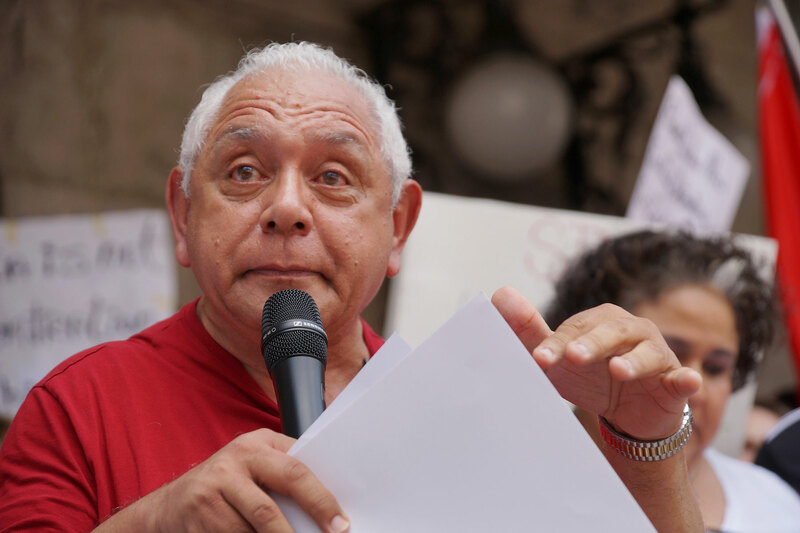 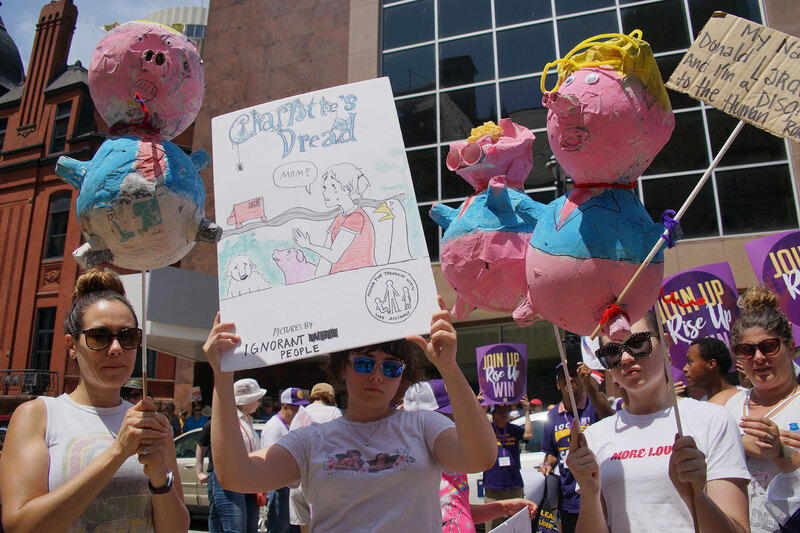 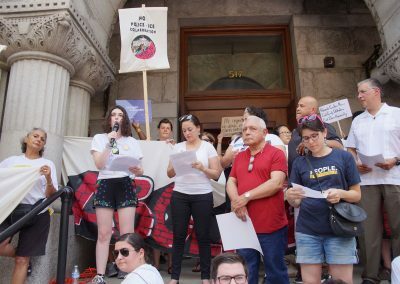 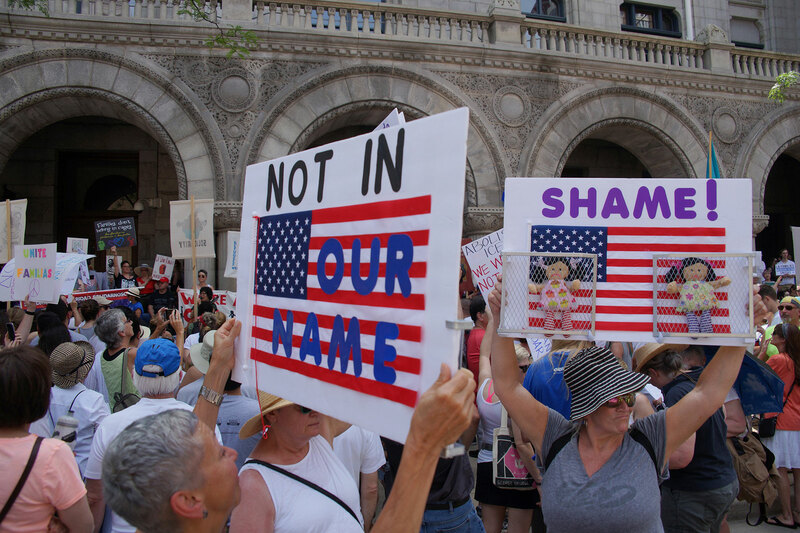 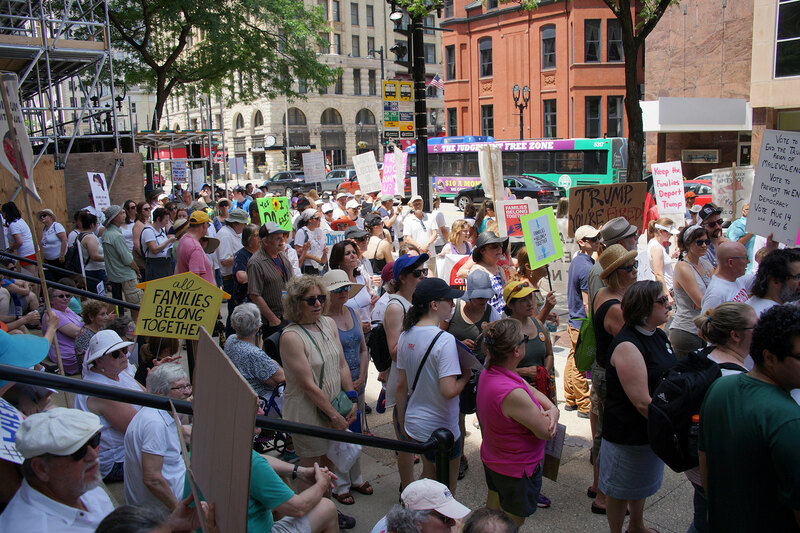 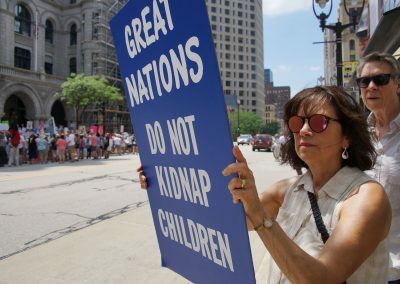 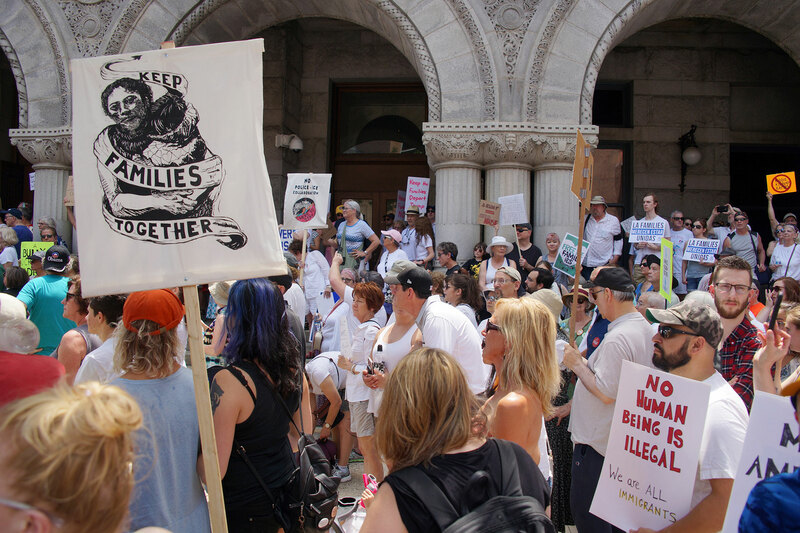 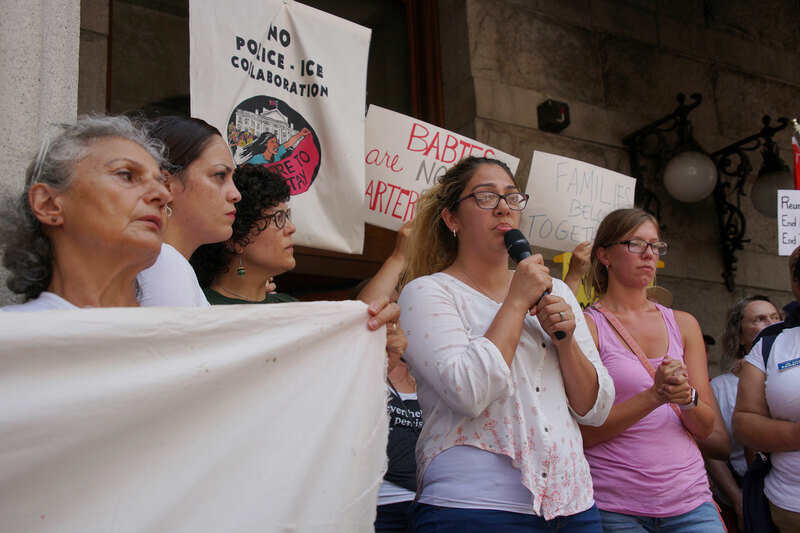 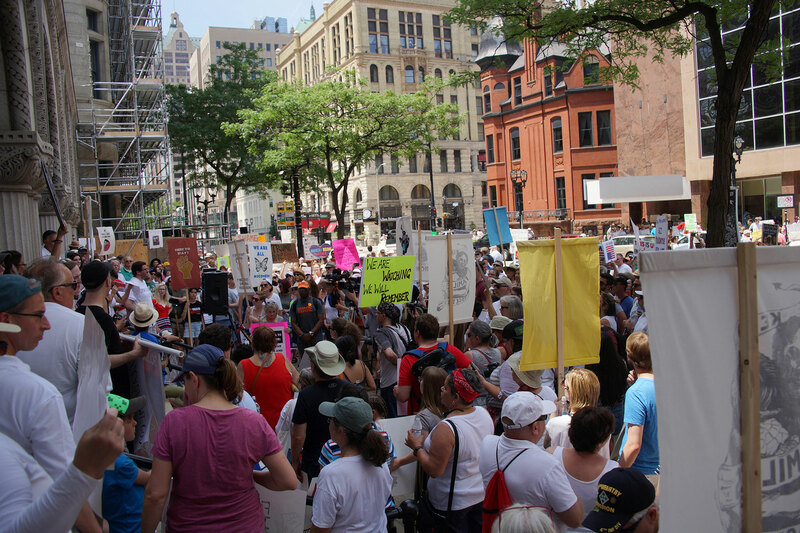 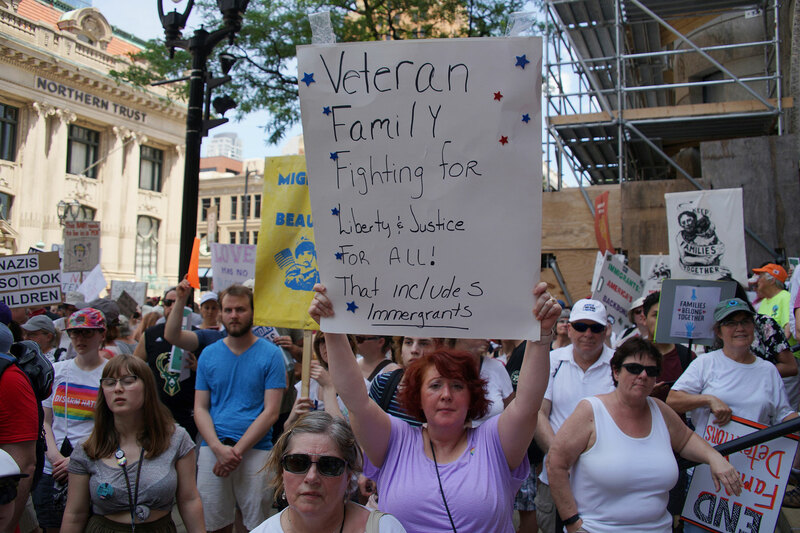 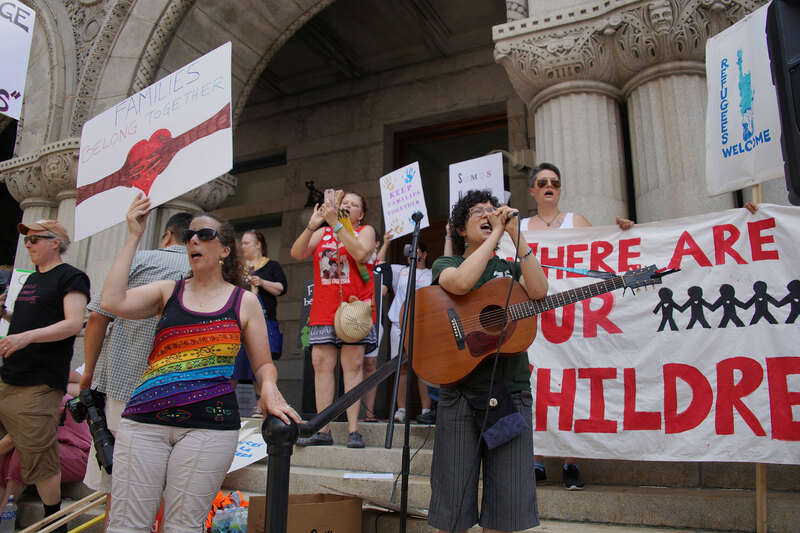 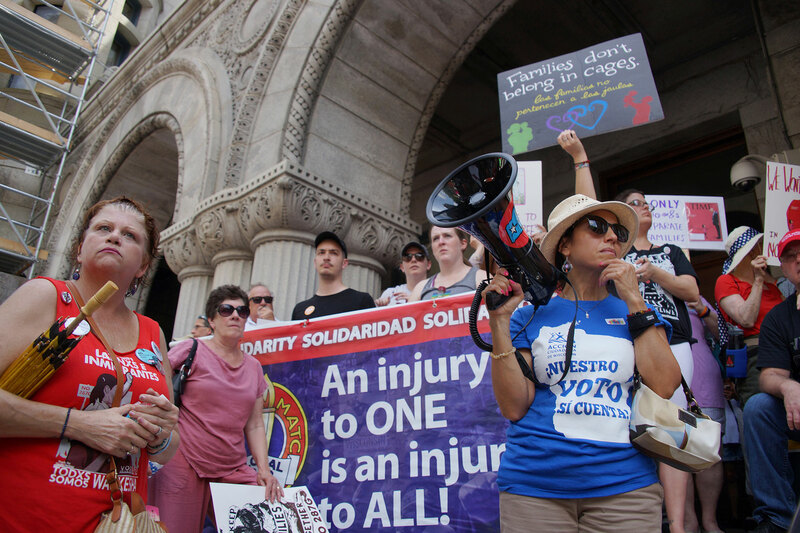 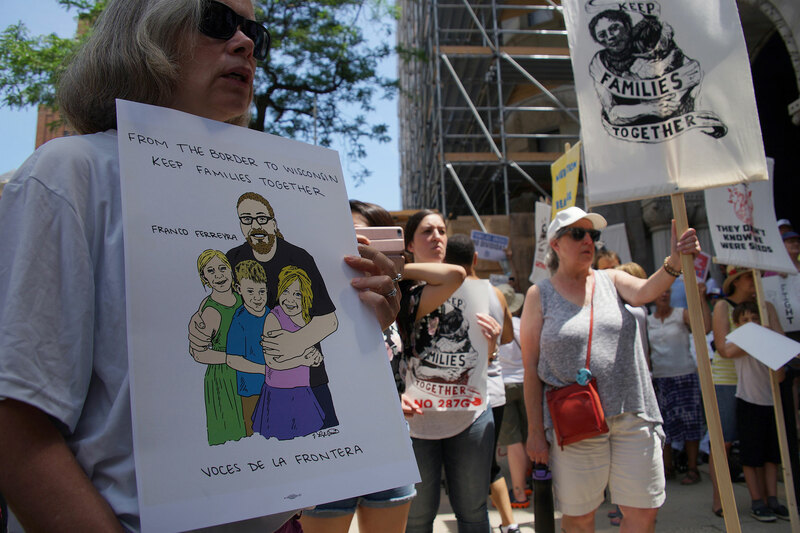 Participants joined the nationwide June 30 protest demanding that the Trump administration reunite families, and end the policy of family separation at the border with Mexico. 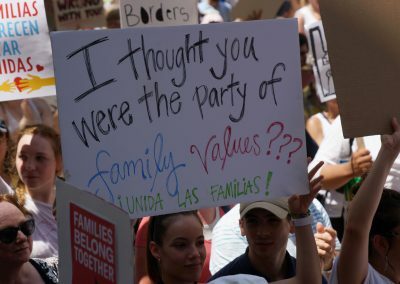 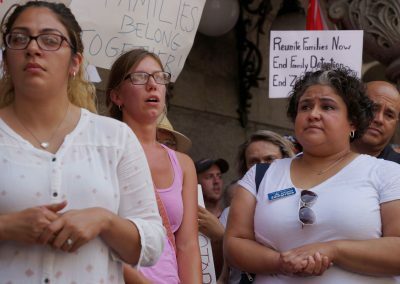 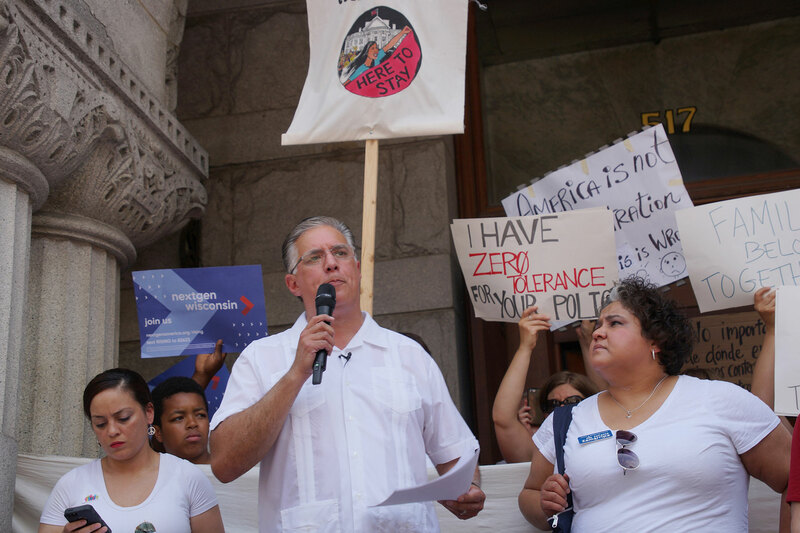 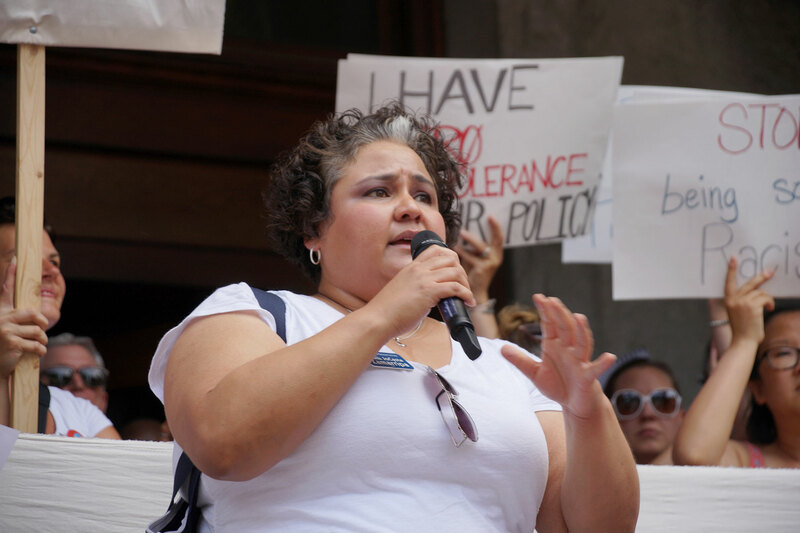 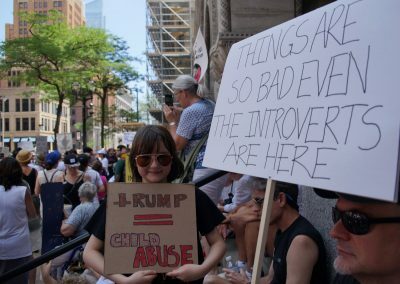 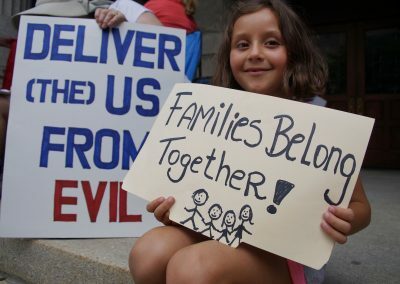 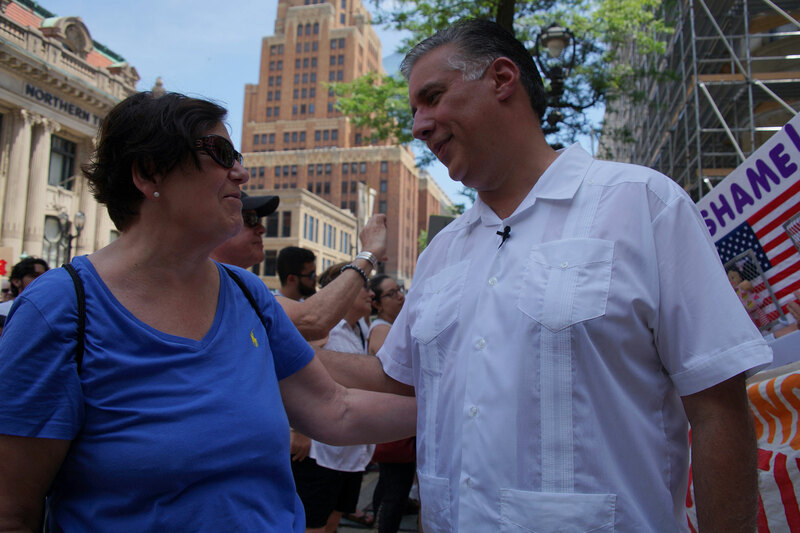 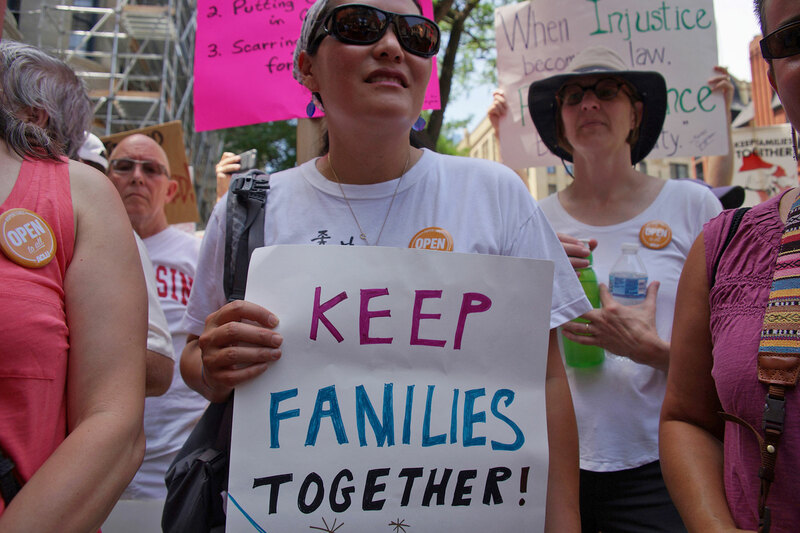 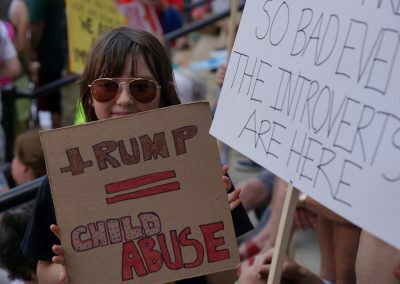 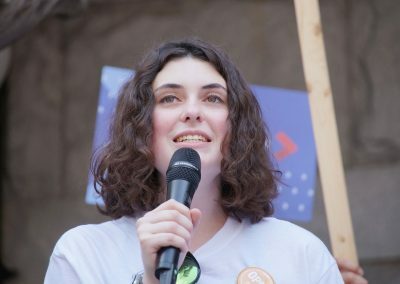 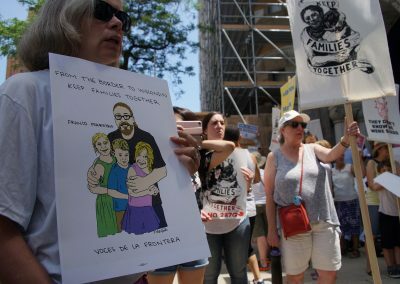 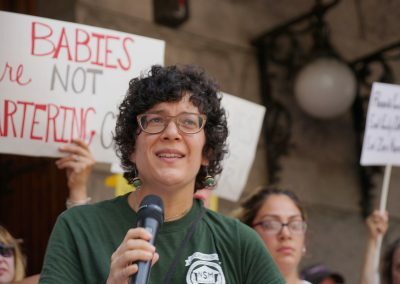 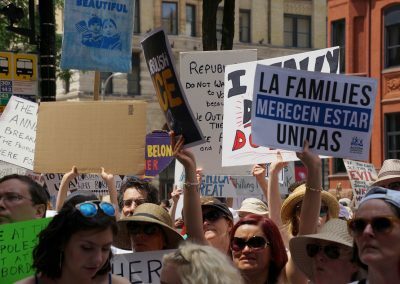 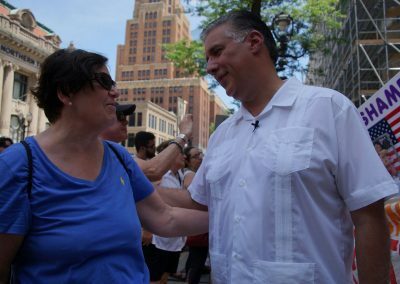 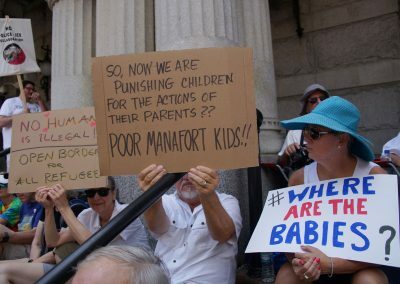 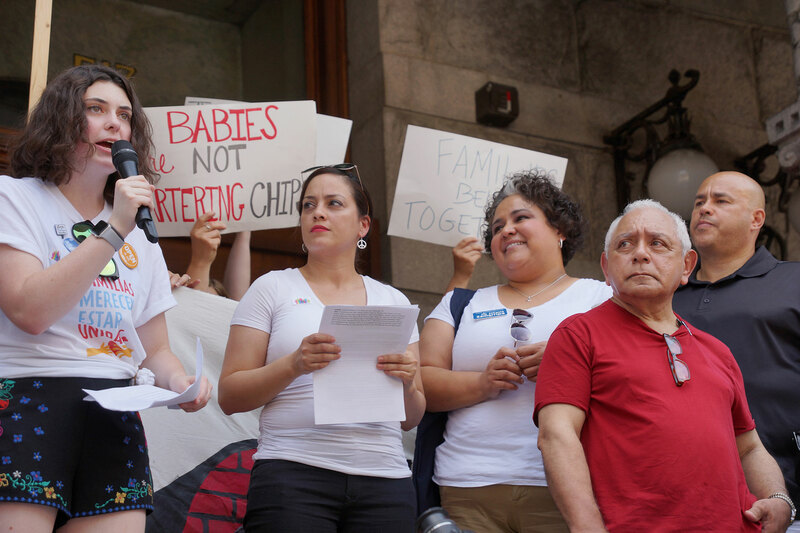 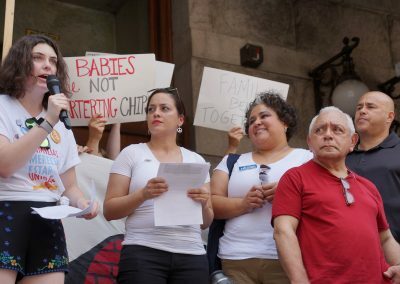 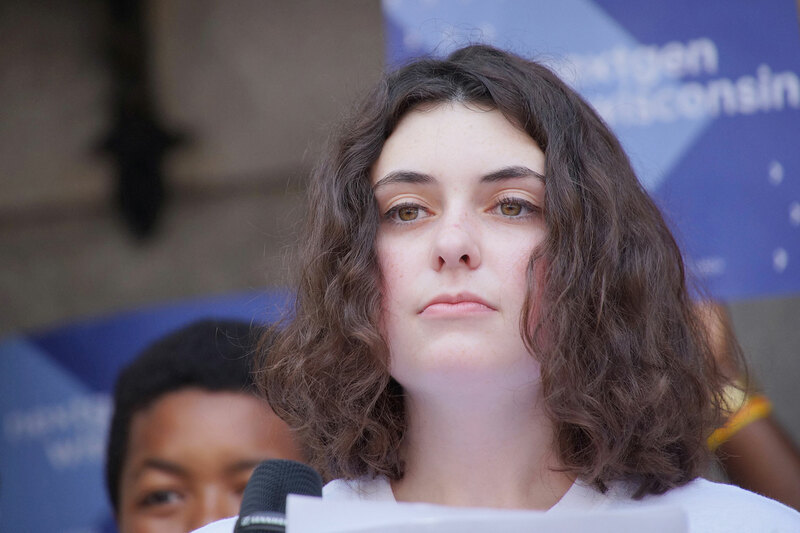 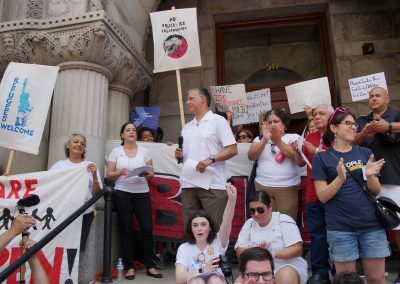 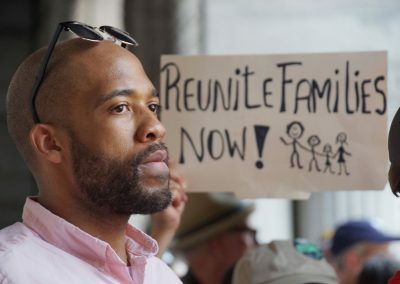 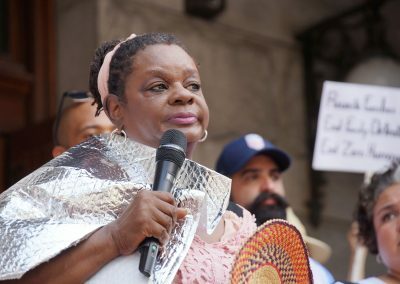 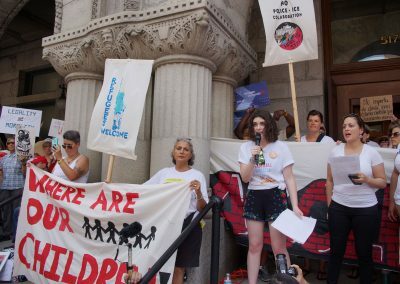 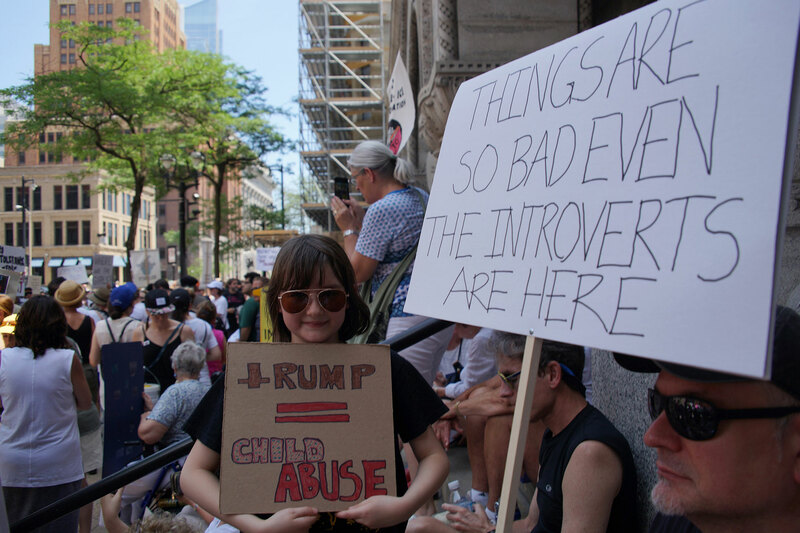 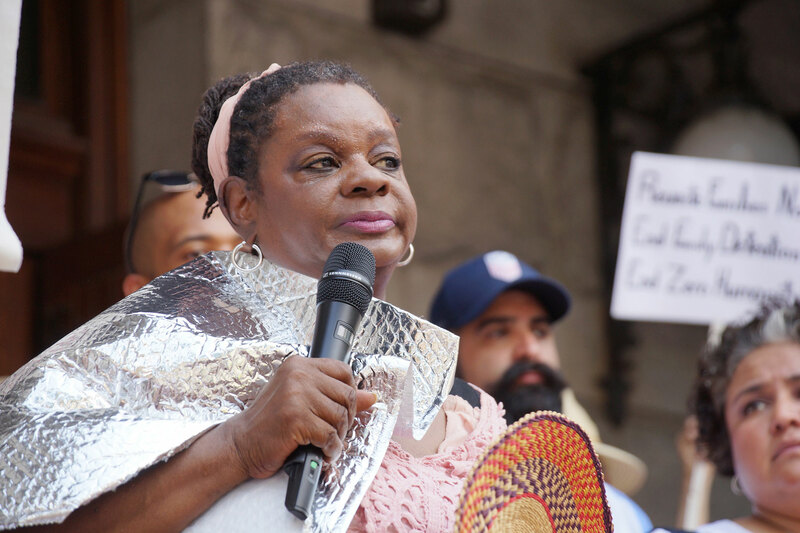 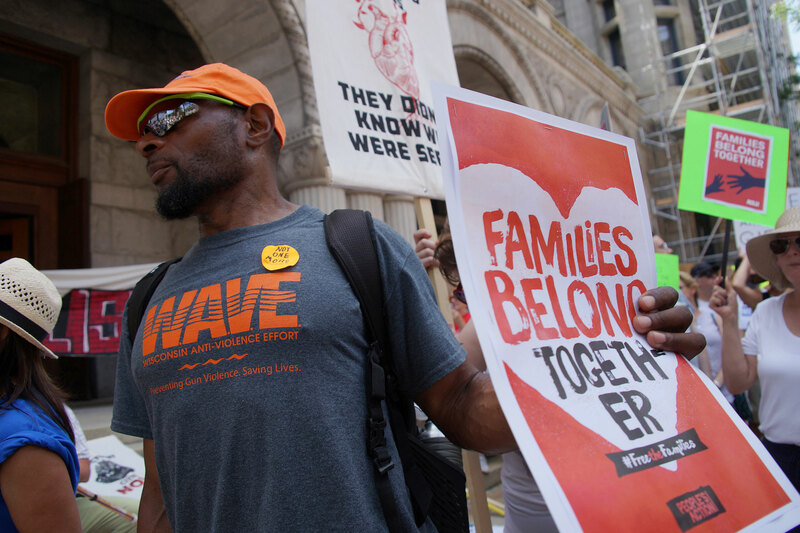 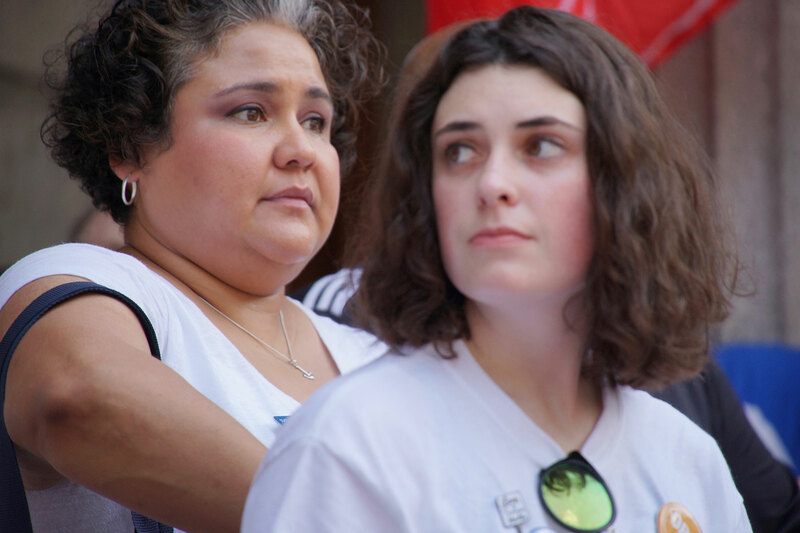 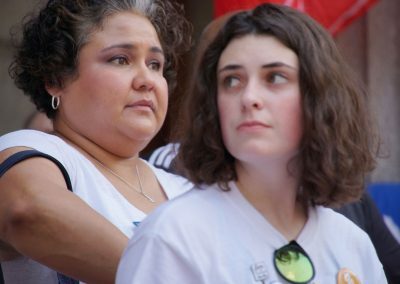 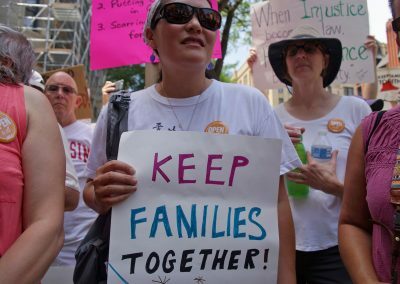 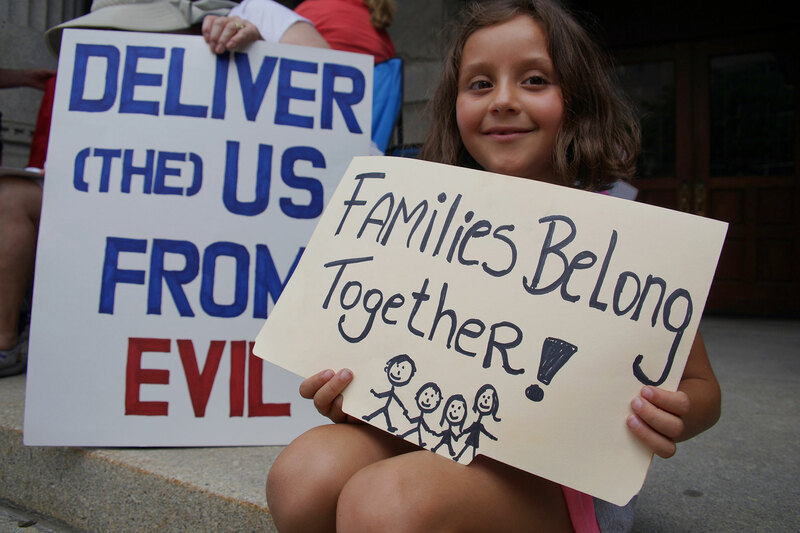 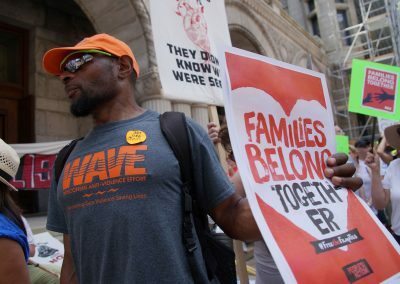 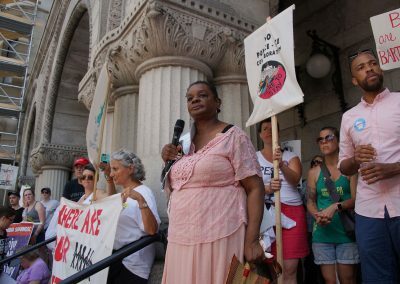 The Families Belong Together rally took aim at the ‘Zero Tolerance’ policy of the Trump Administration, which pulled families apart. 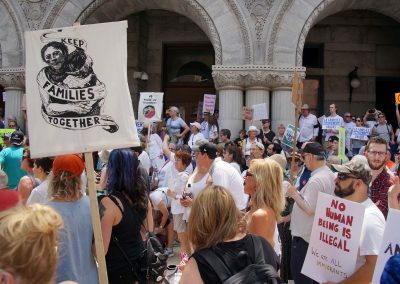 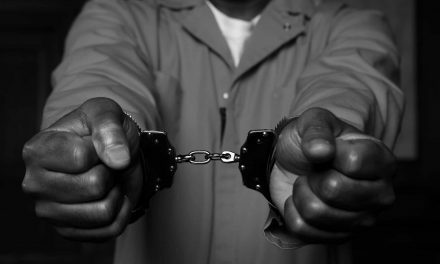 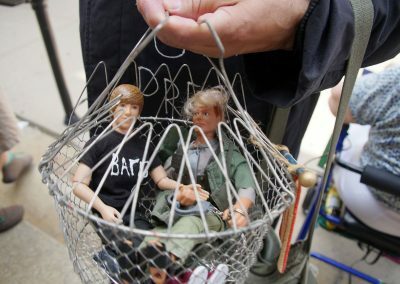 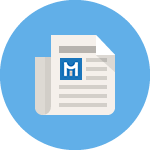 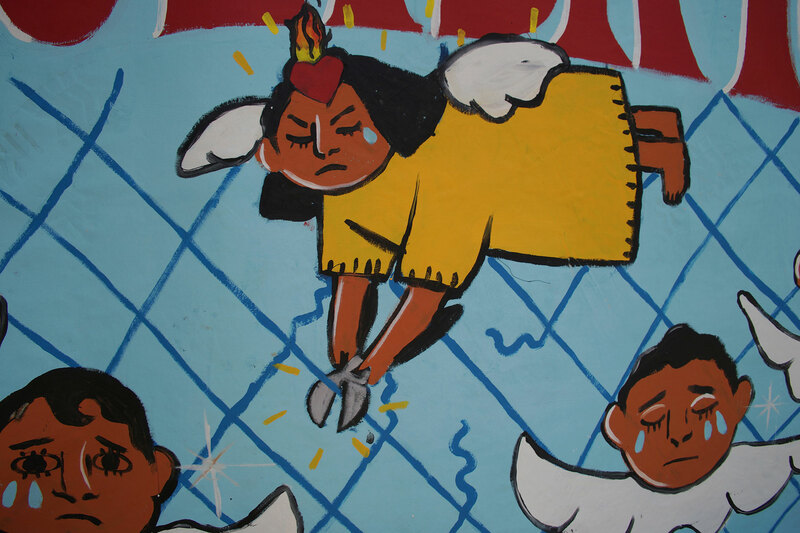 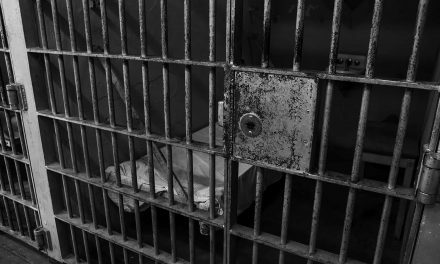 Individuals who illegally entered the United States were prosecuted under this directive, and their children were taken away and placed in shelters. 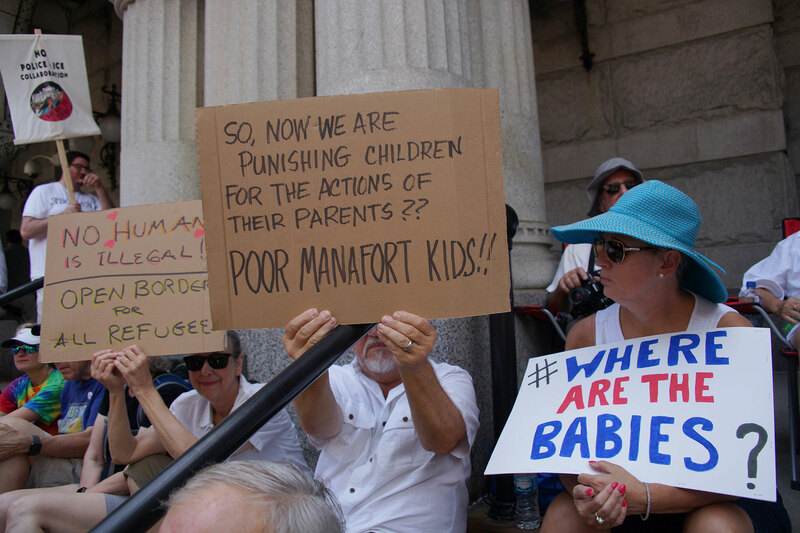 Over the previous week, Americans have watched in shock at the Southern border as children were locked in cages with thermal blankets, and separated from their parents. 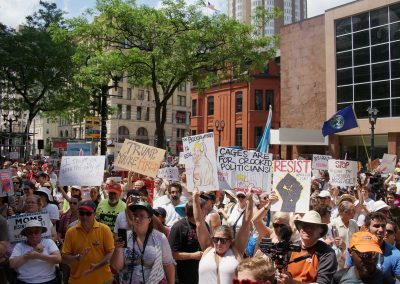 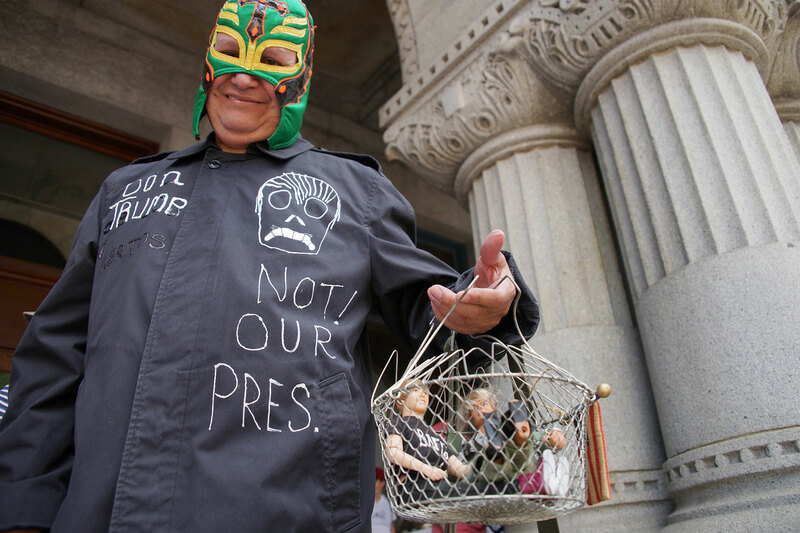 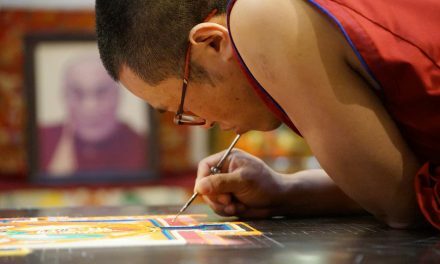 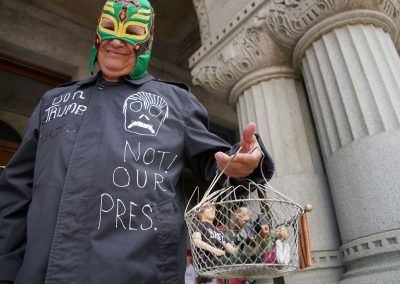 Protestors took to the streets of cities all across the nation, with hundreds of organized events that expressed anger over the Trump policy. 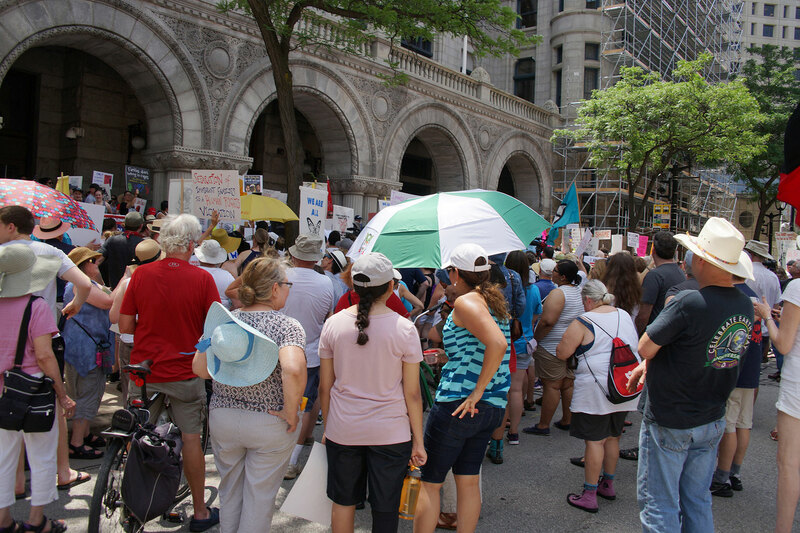 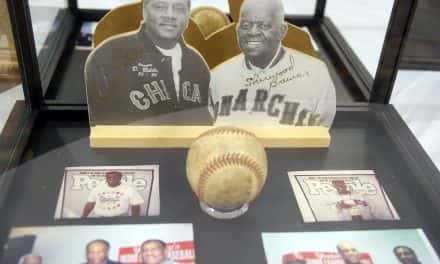 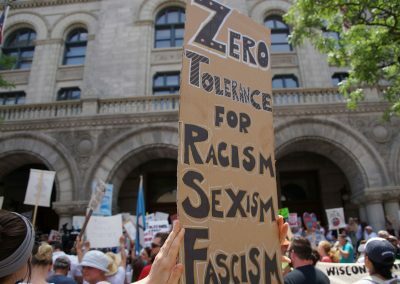 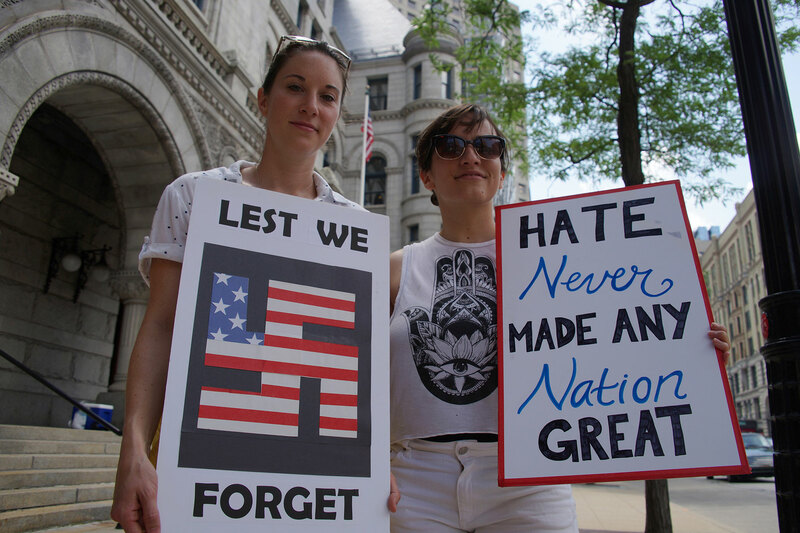 In Milwaukee, the local outrage that assembled along Wisconsin Avenue ran parallel to the 90+ degree temperature. 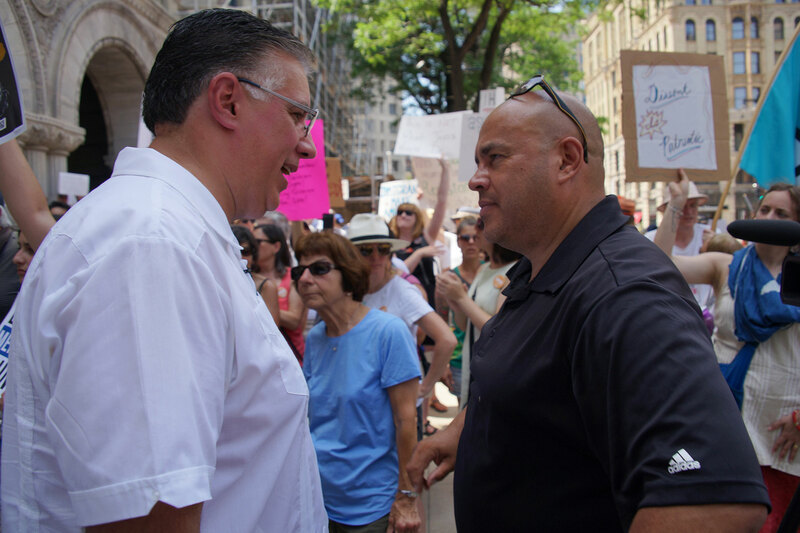 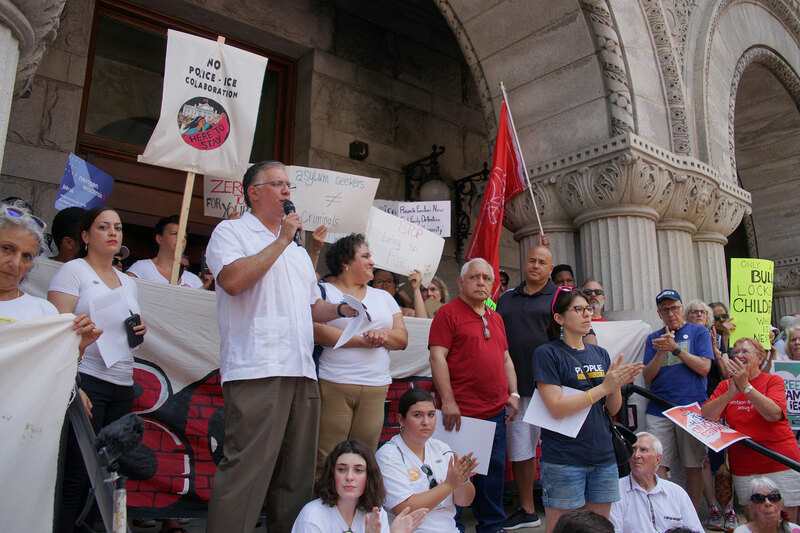 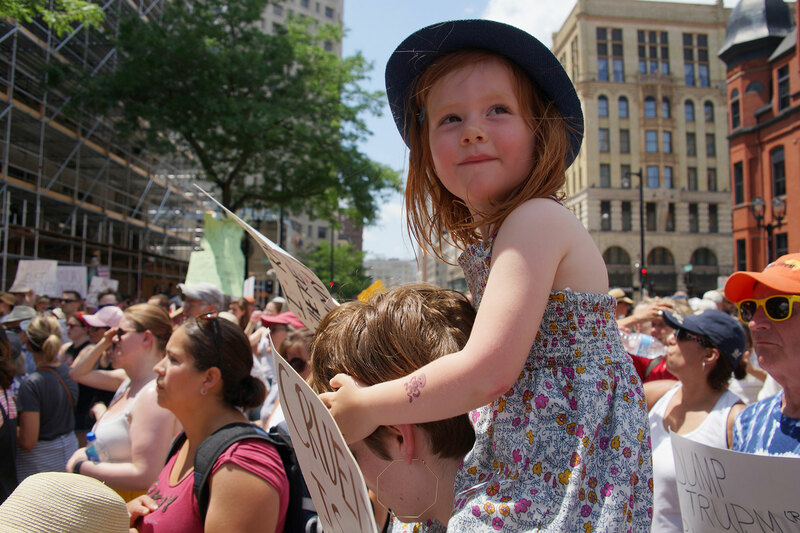 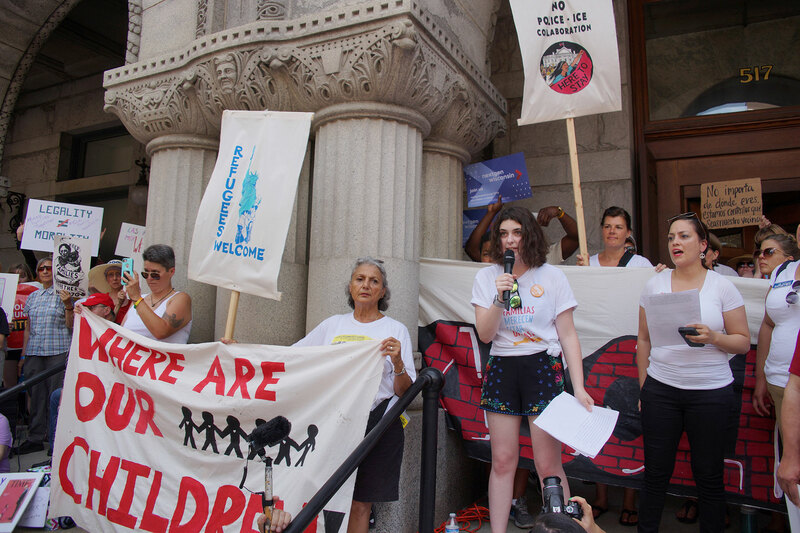 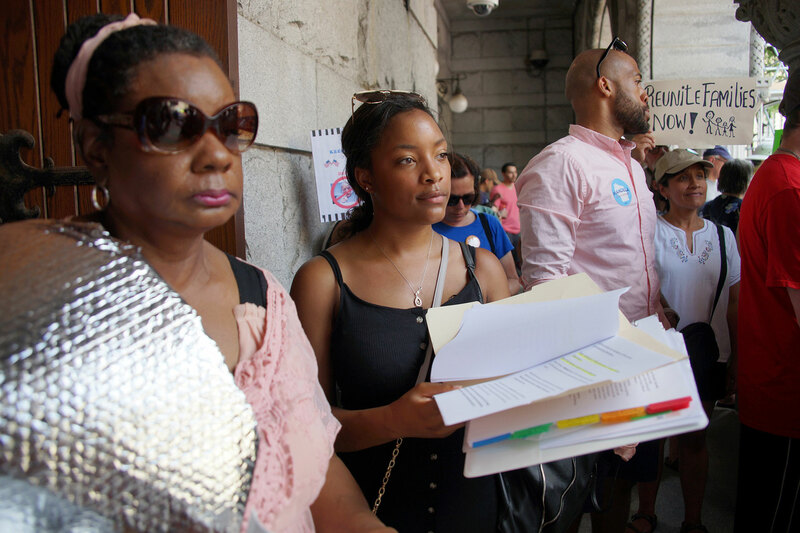 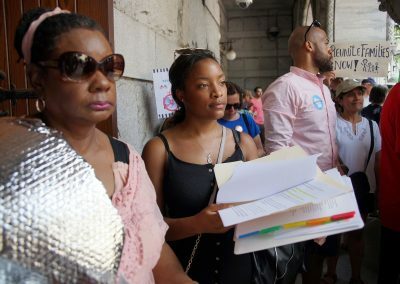 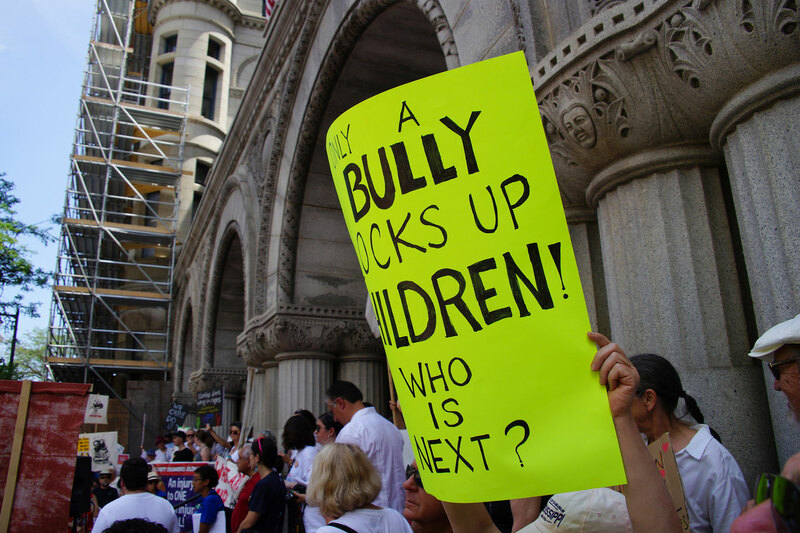 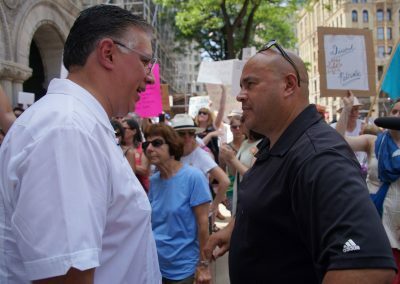 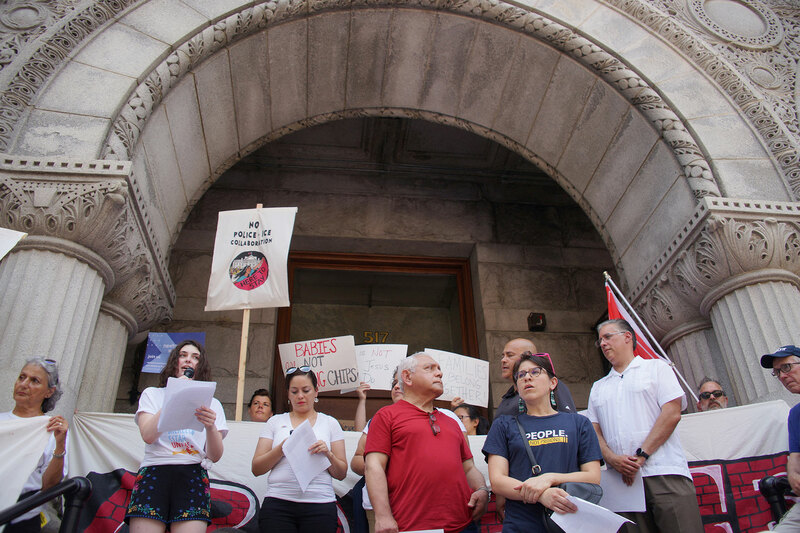 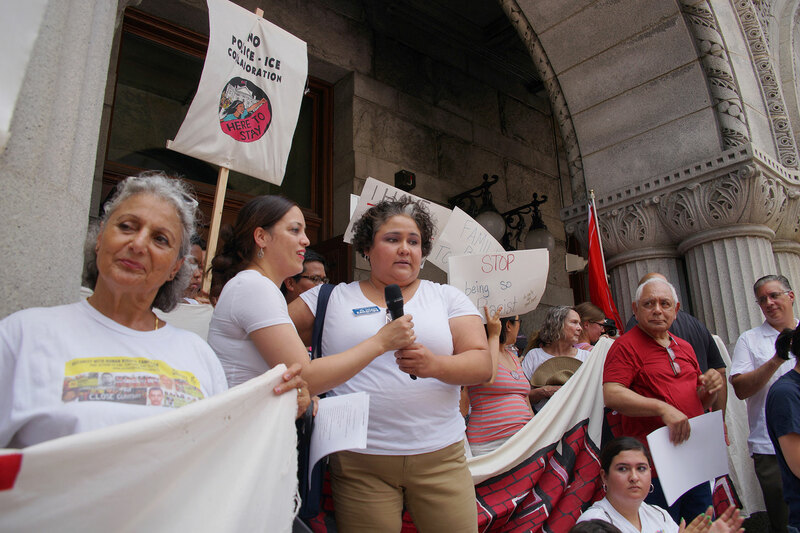 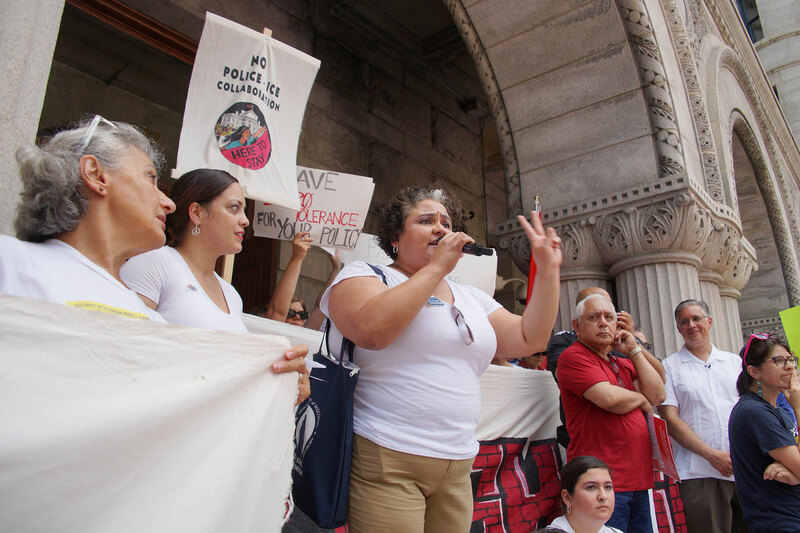 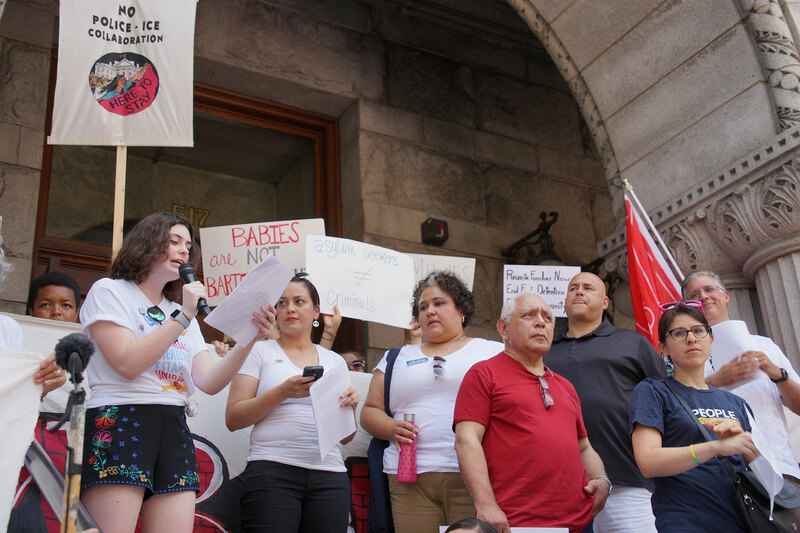 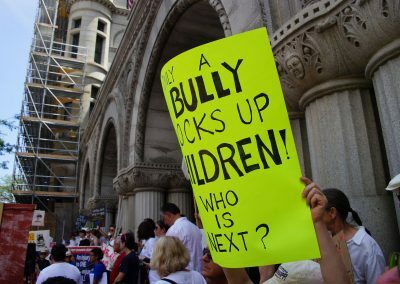 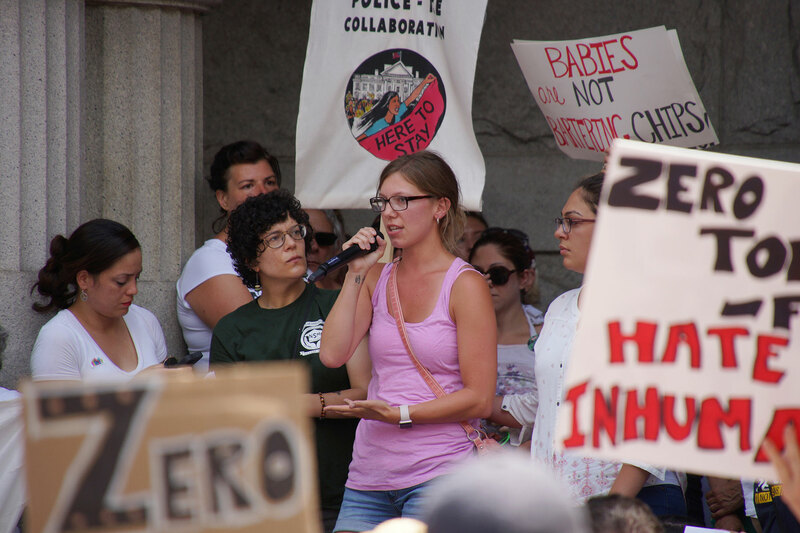 Parents, children, and concerned citizens braved the sweltering weather and added their voices to the call to action. 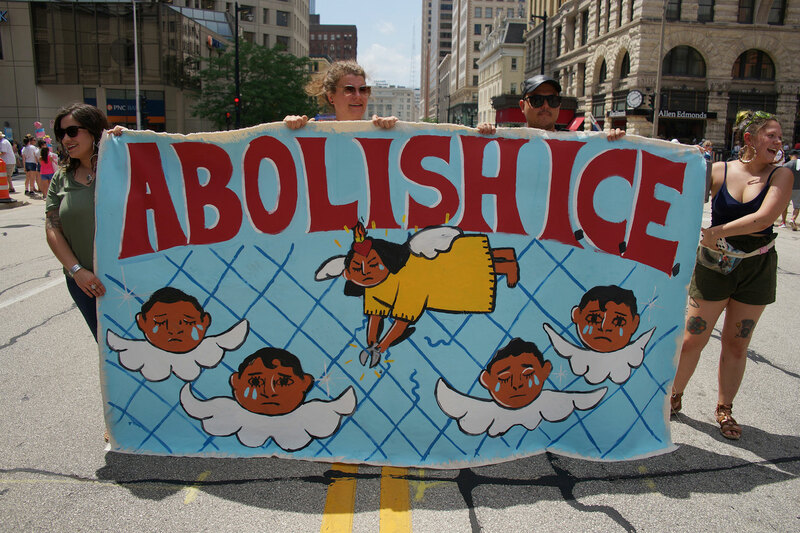 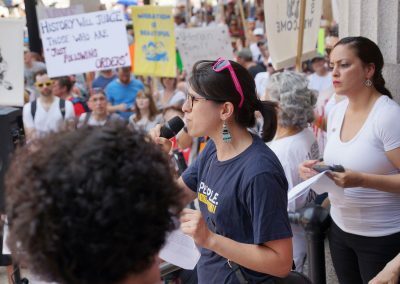 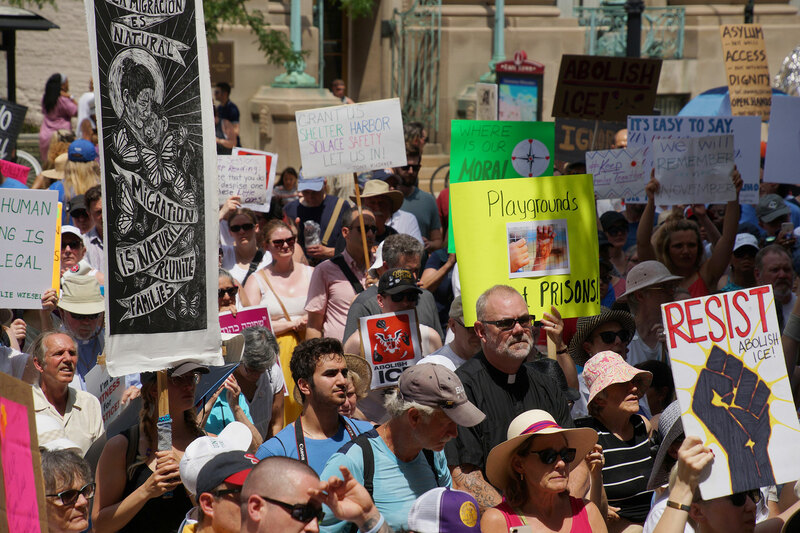 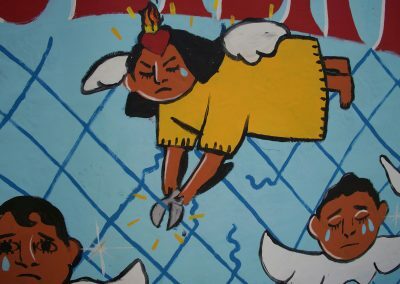 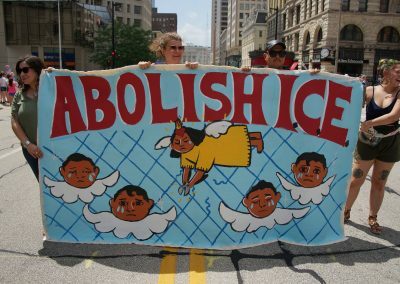 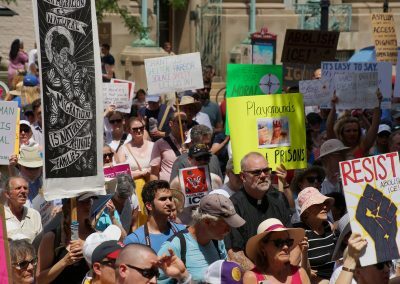 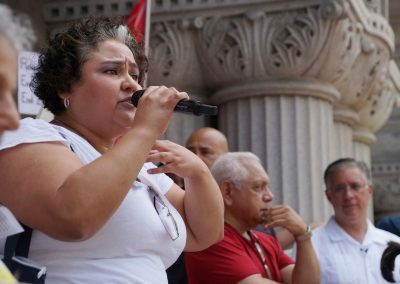 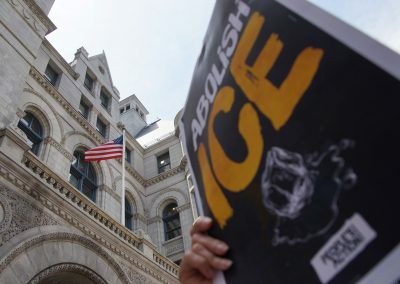 Chants echoed through the streets with words like “Abolish ICE,” “When I say people, you say power.” All the messages demanded reunification of the families separated at the border, as a result of Trump’s ‘zero tolerance’ immigration policy. 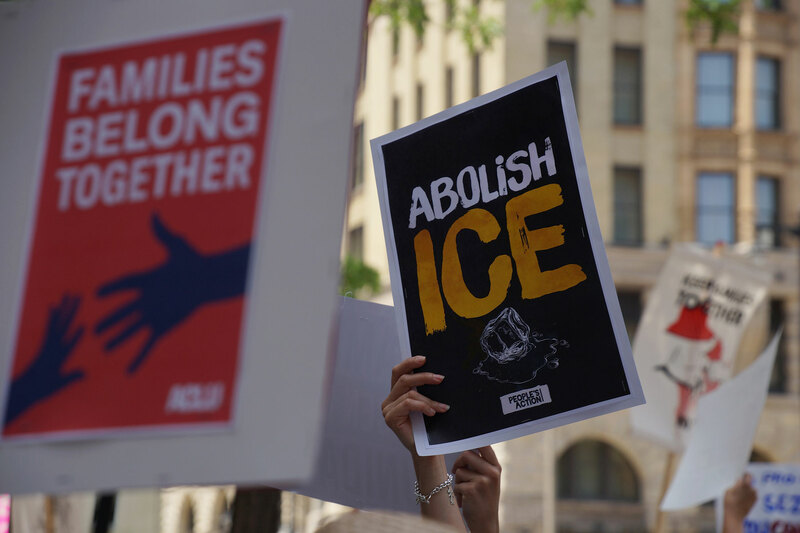 Most Immigrants flee their countries in order to find a better life in America, risking everything in order to escape the violence and instability of their homeland. 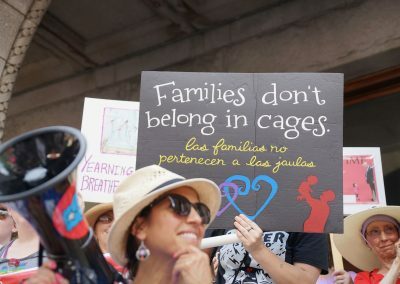 By coming to the United States, they risked being captured by ICE. 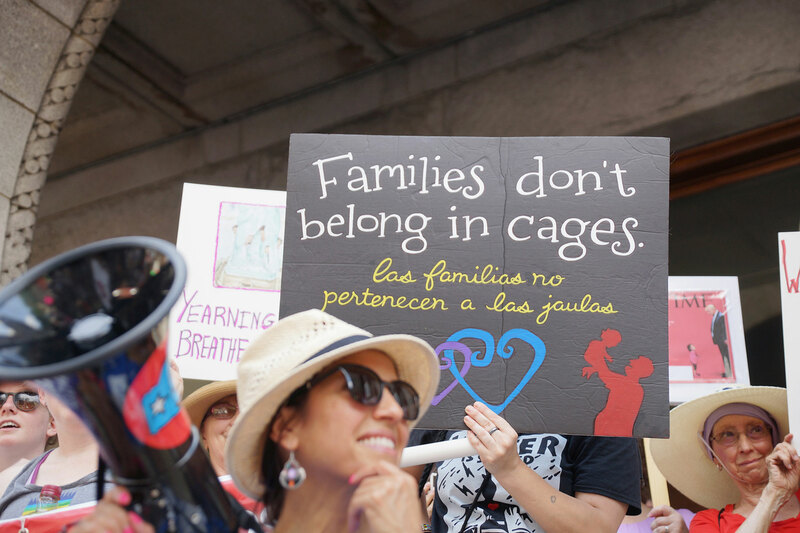 The circumstances at the border now are an even greater risk, because of the new methods used to detain them. 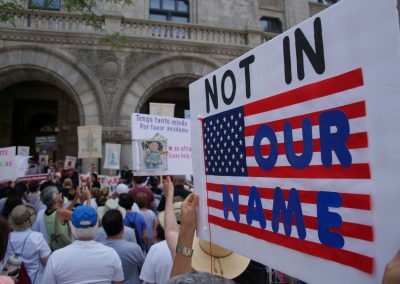 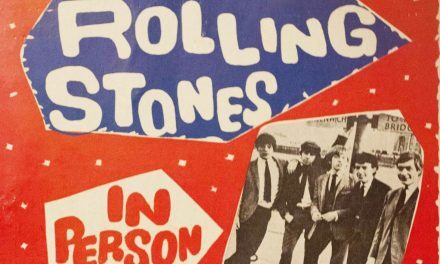 America, in fact, has always been a nation of immigrants. 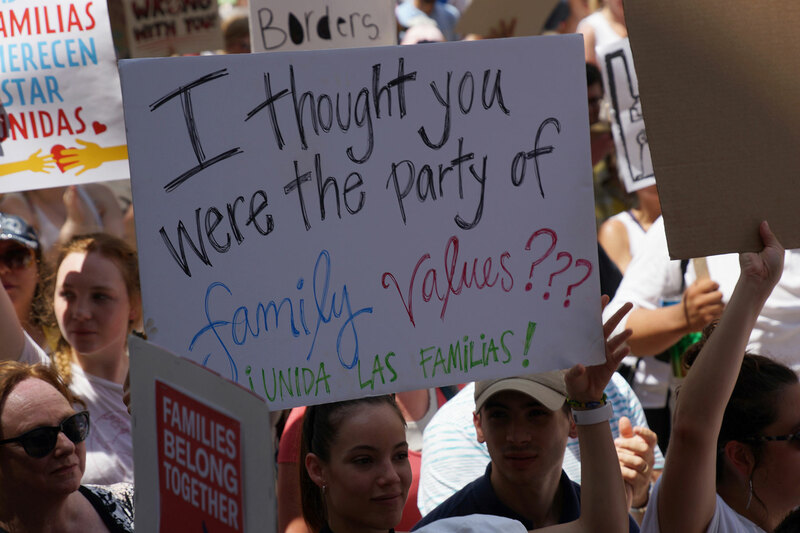 The backlash to Trump’s policy was almost immediate. 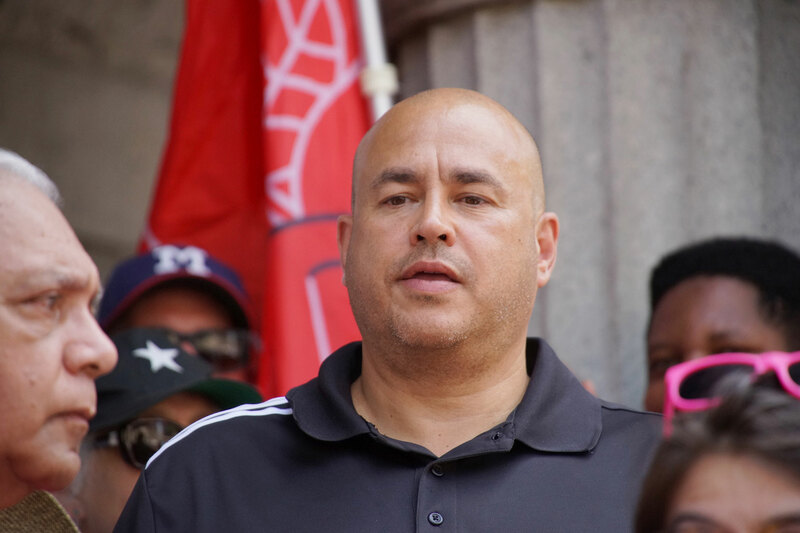 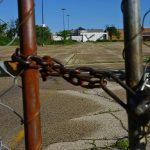 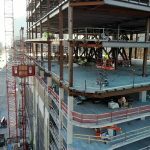 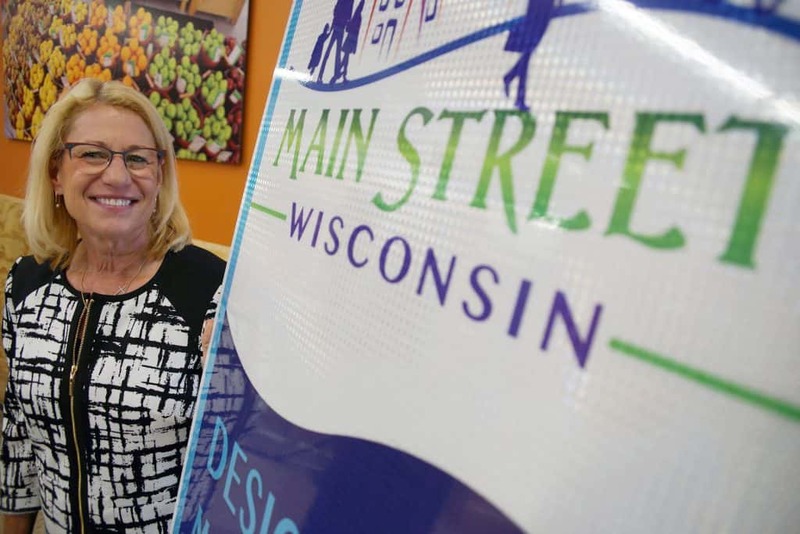 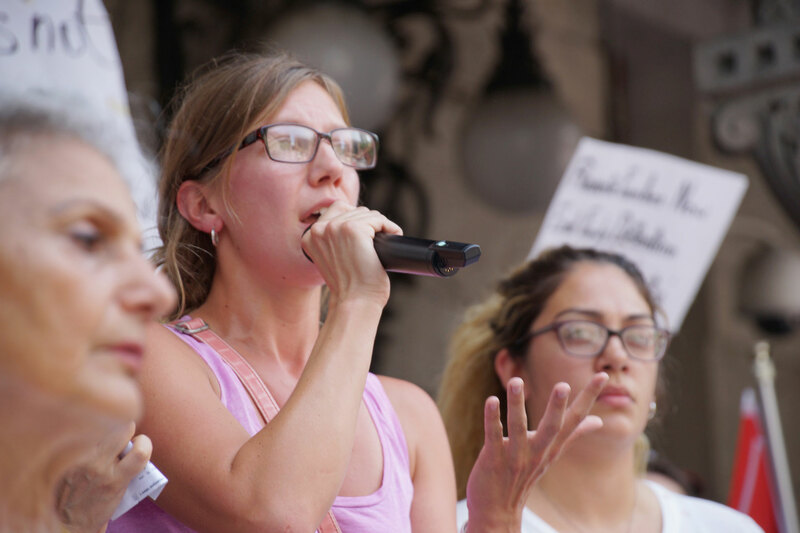 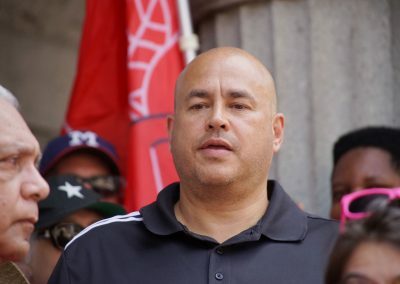 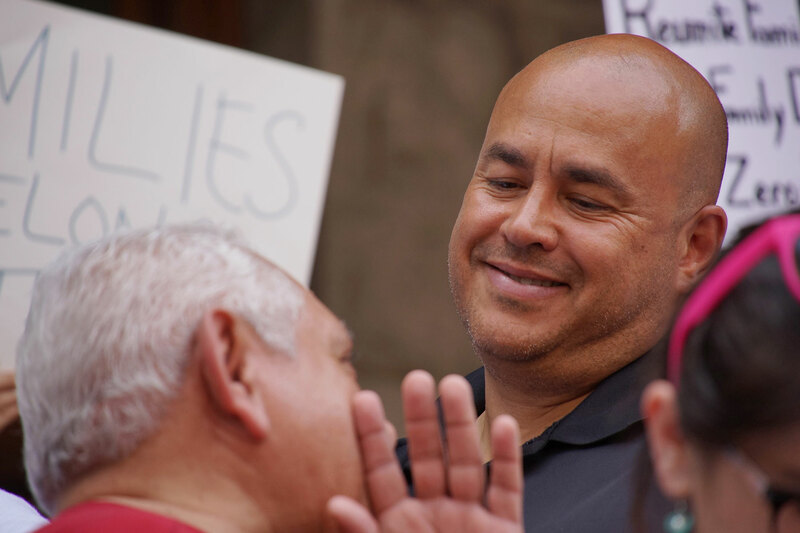 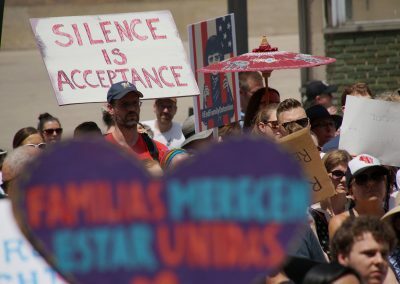 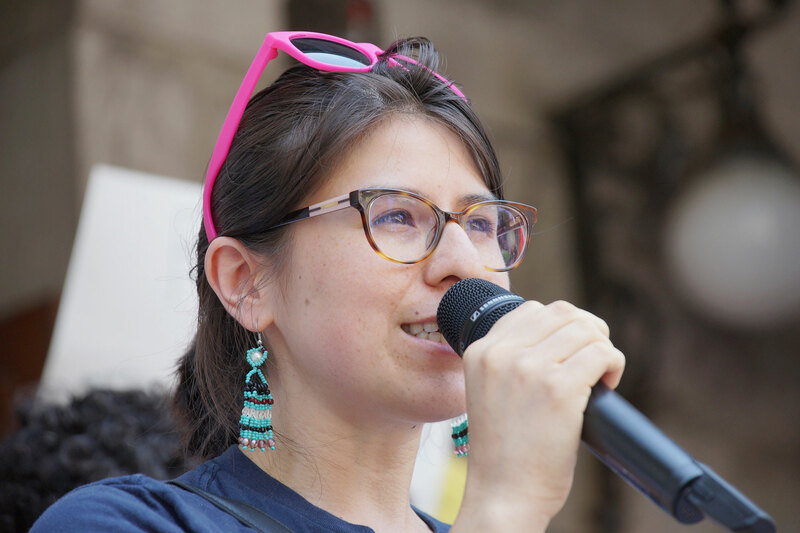 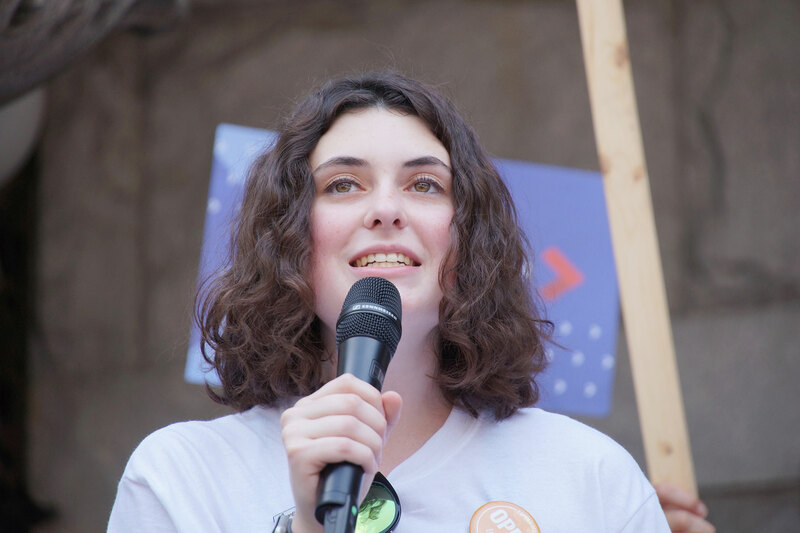 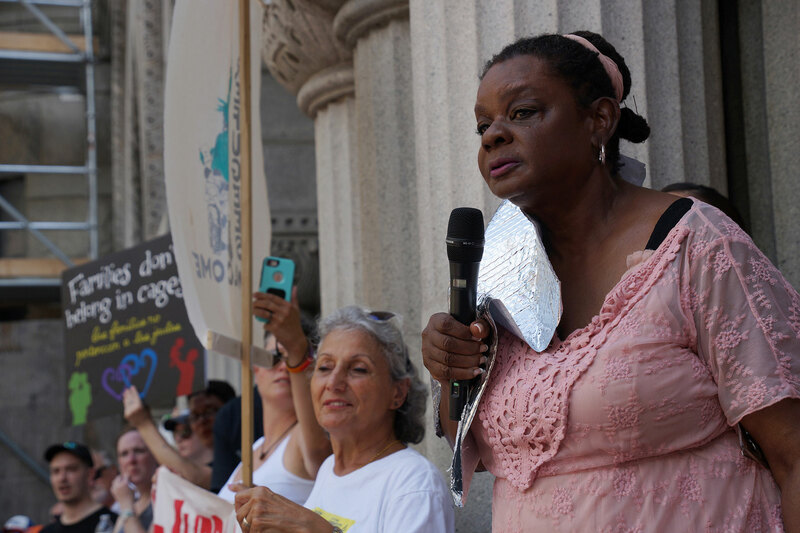 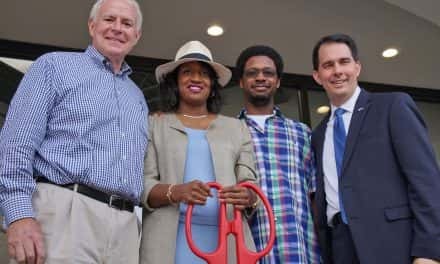 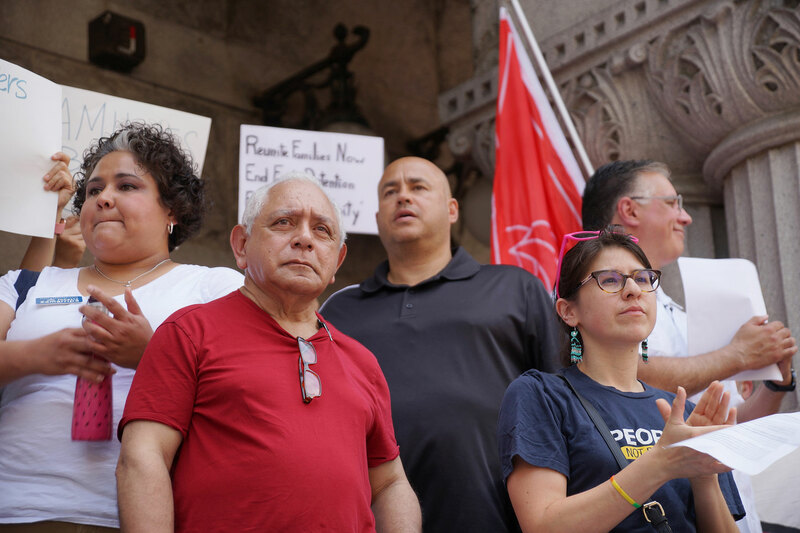 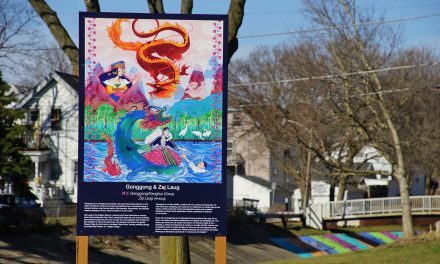 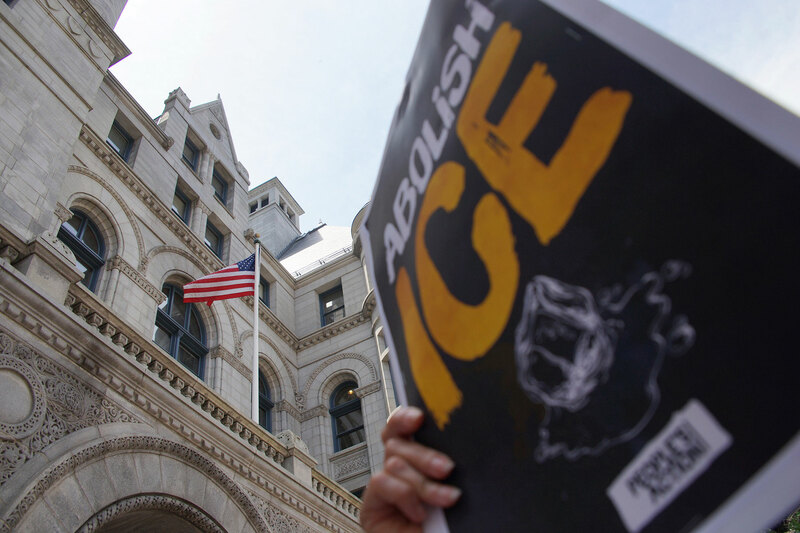 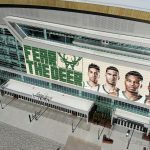 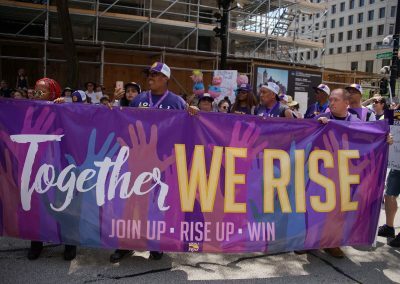 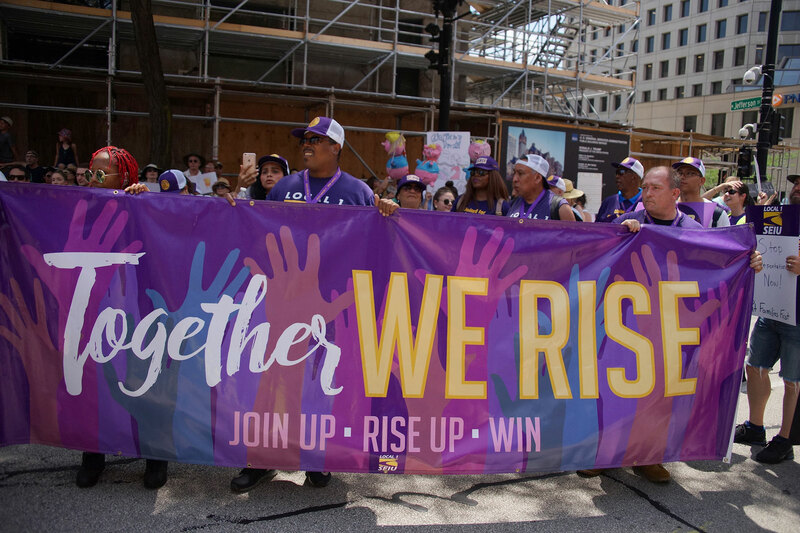 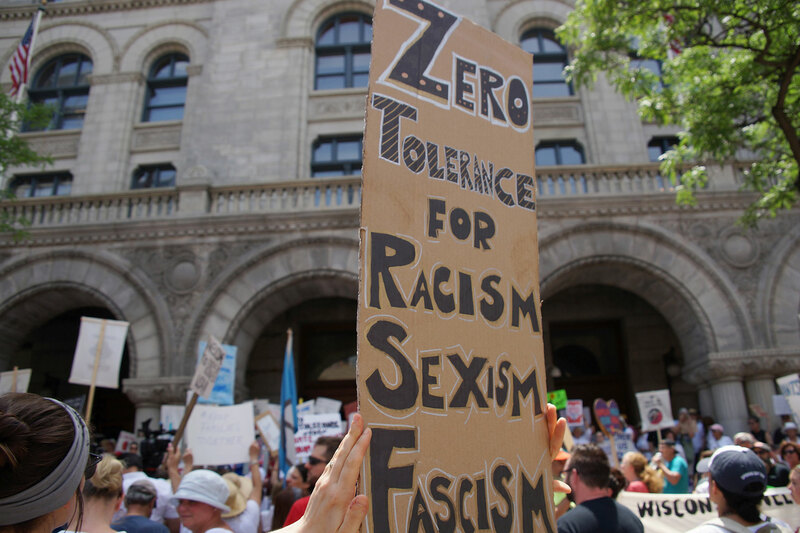 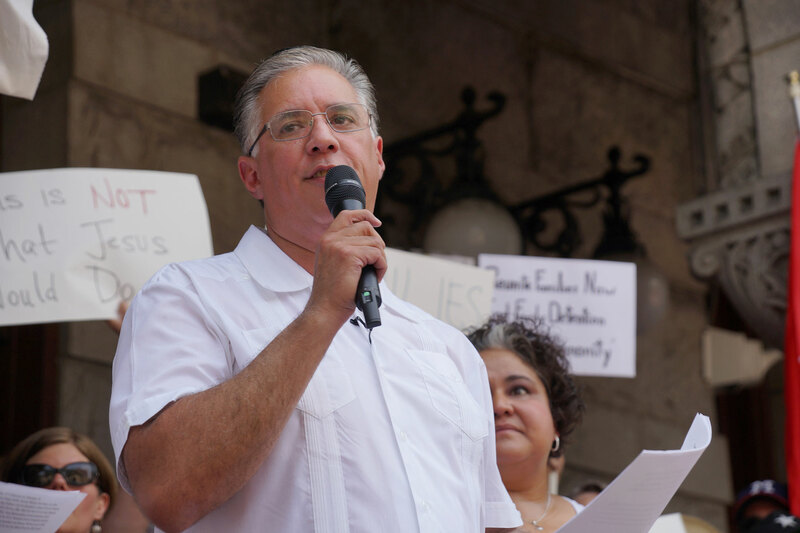 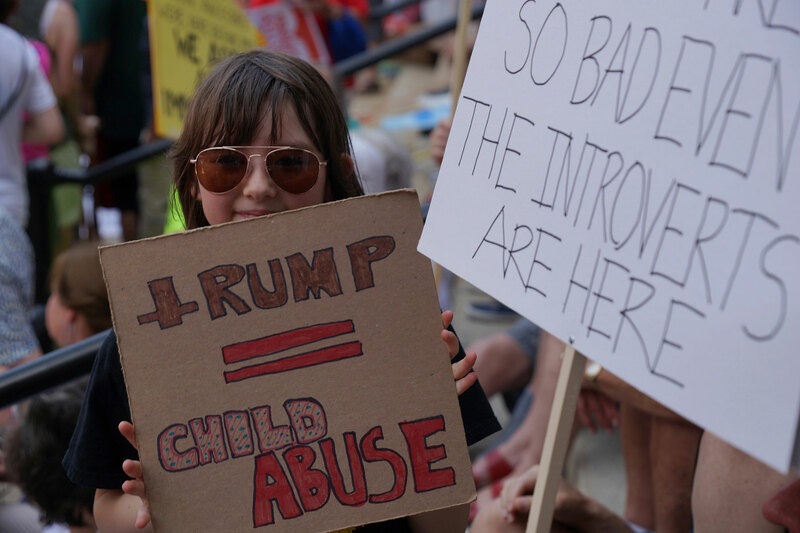 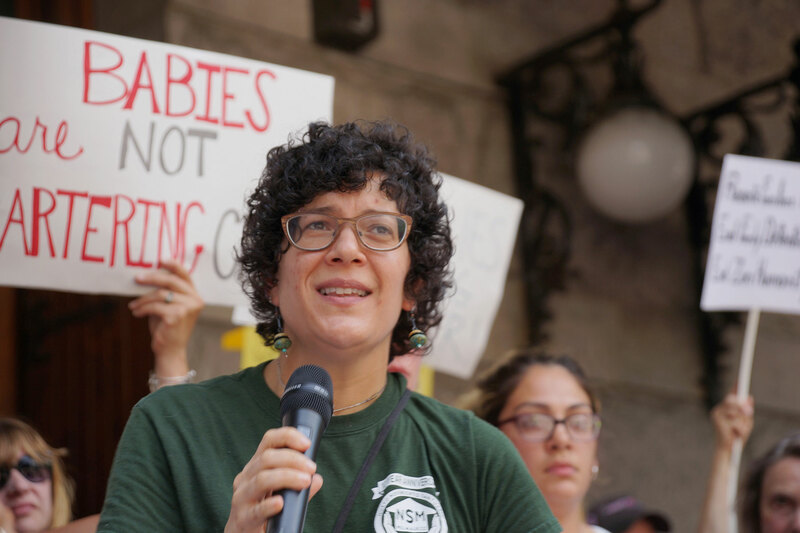 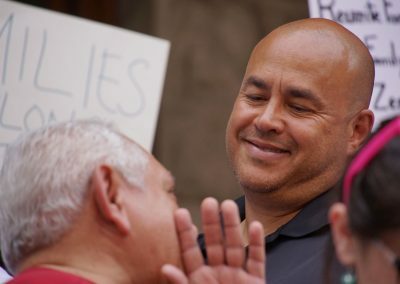 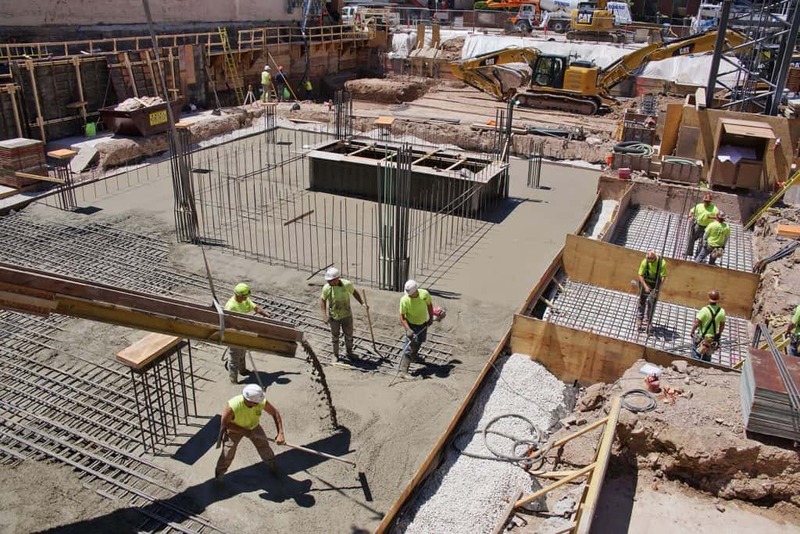 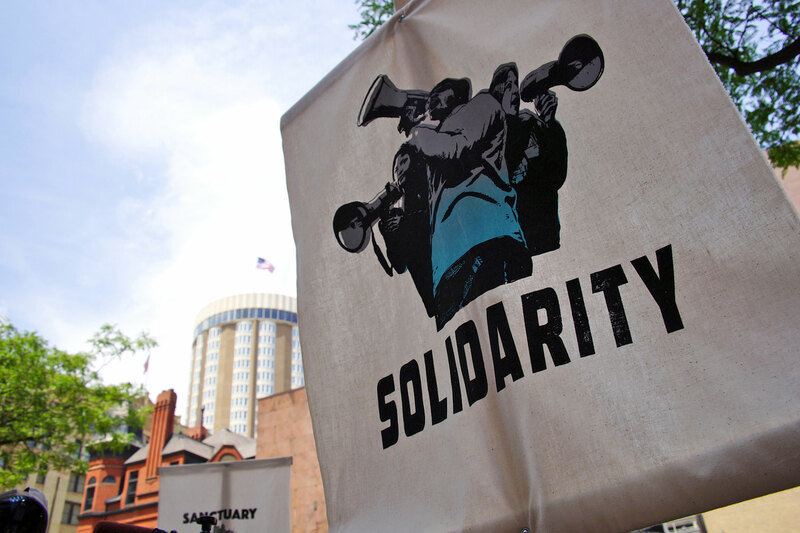 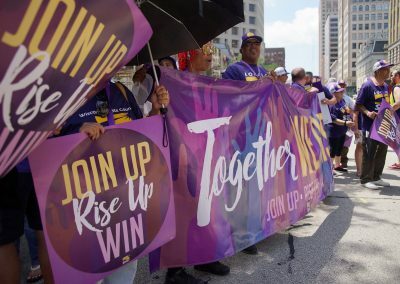 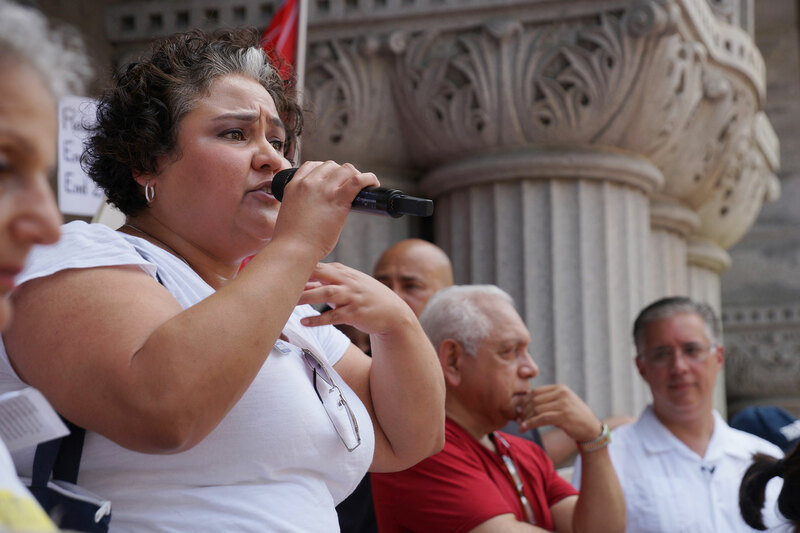 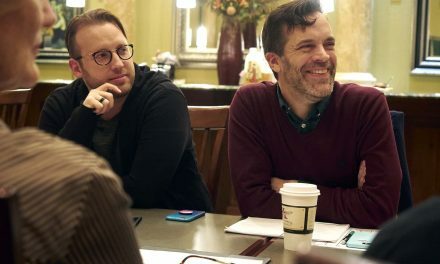 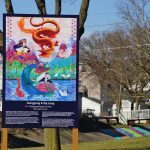 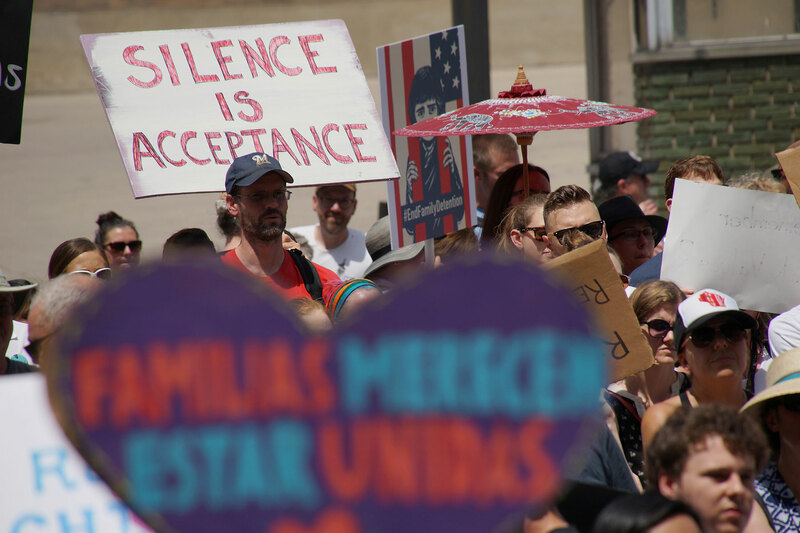 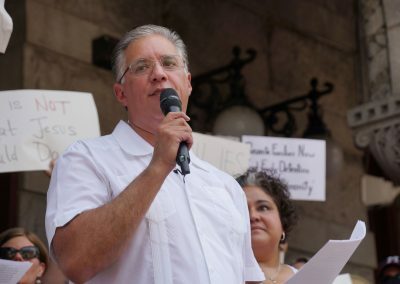 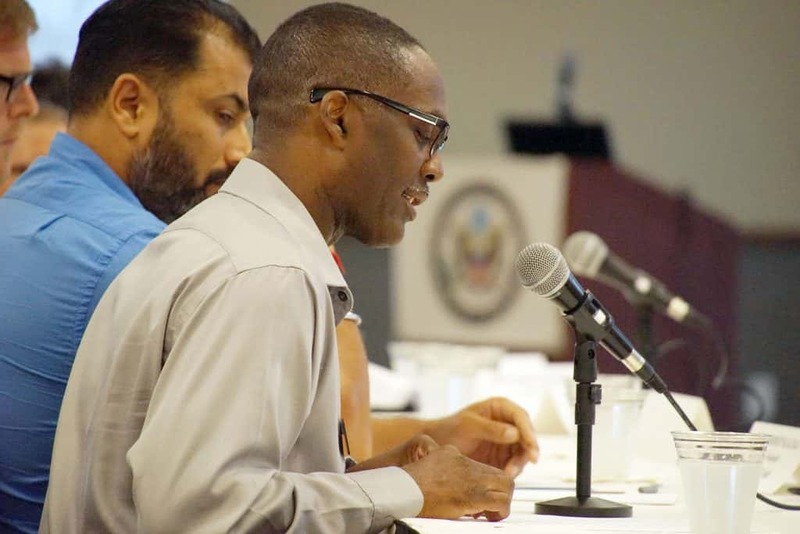 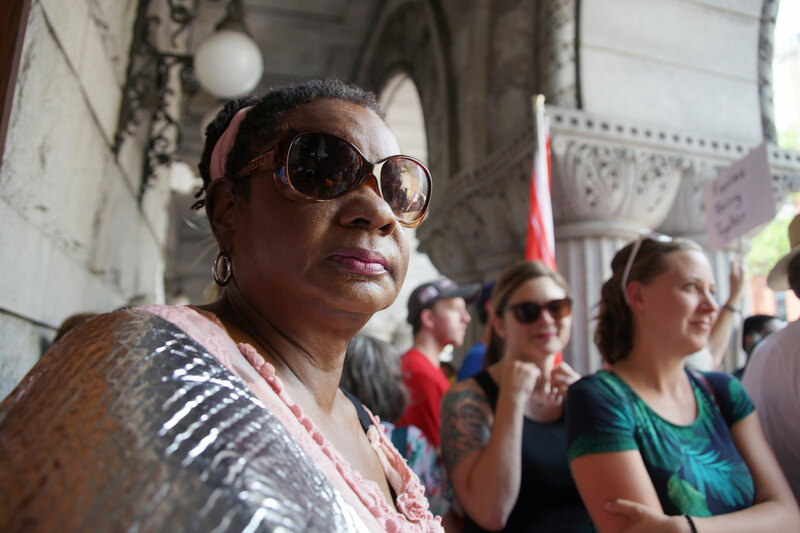 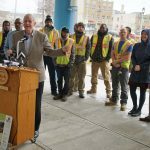 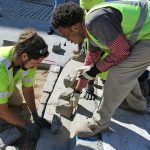 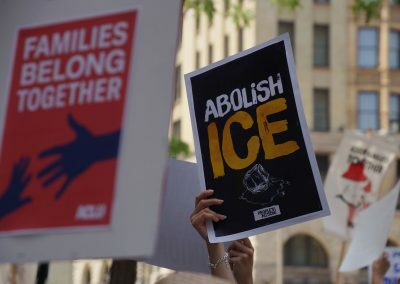 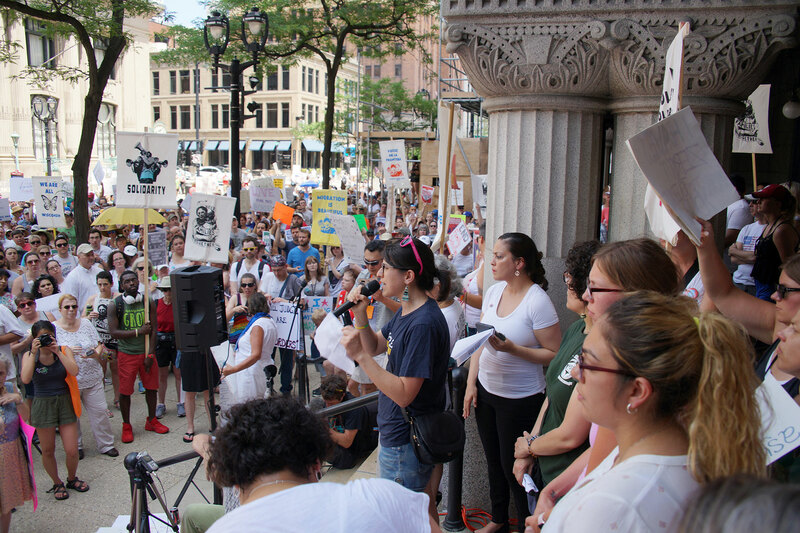 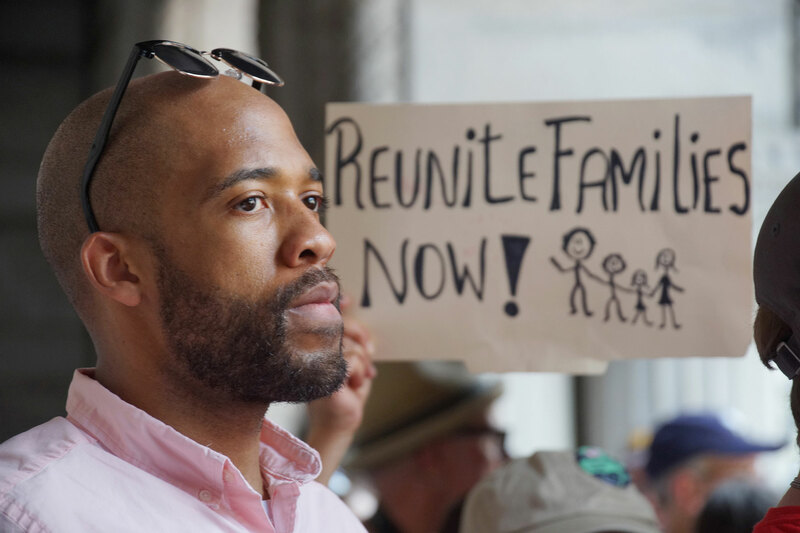 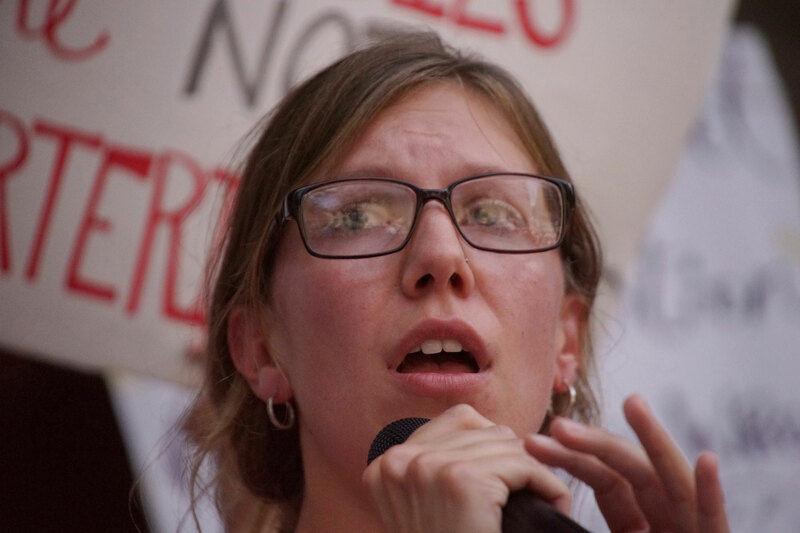 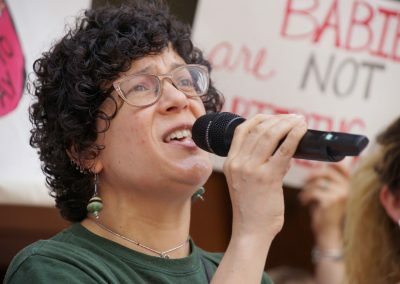 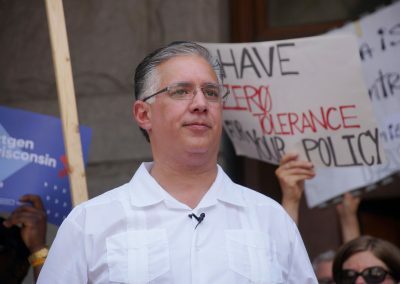 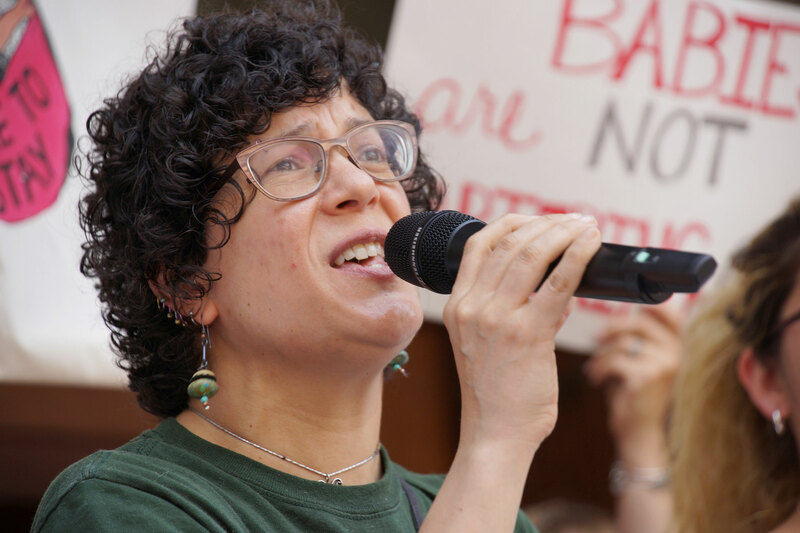 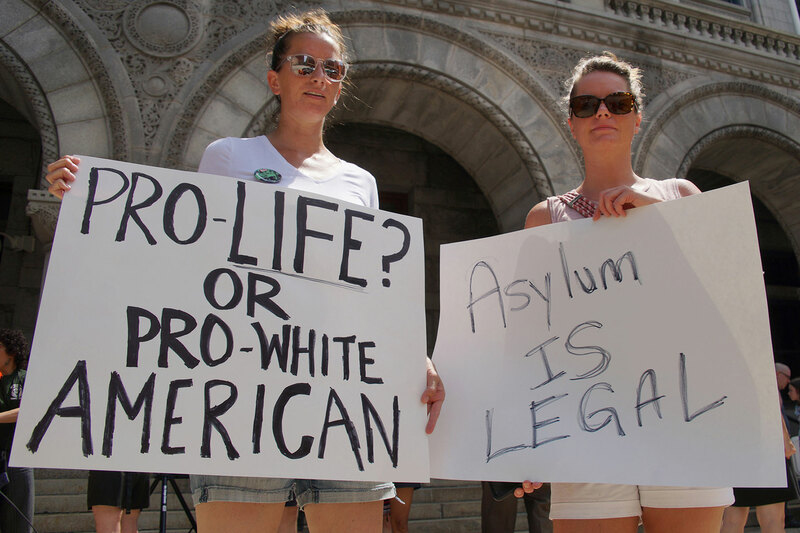 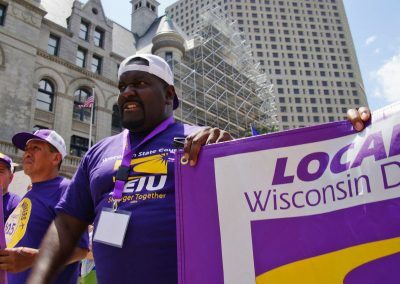 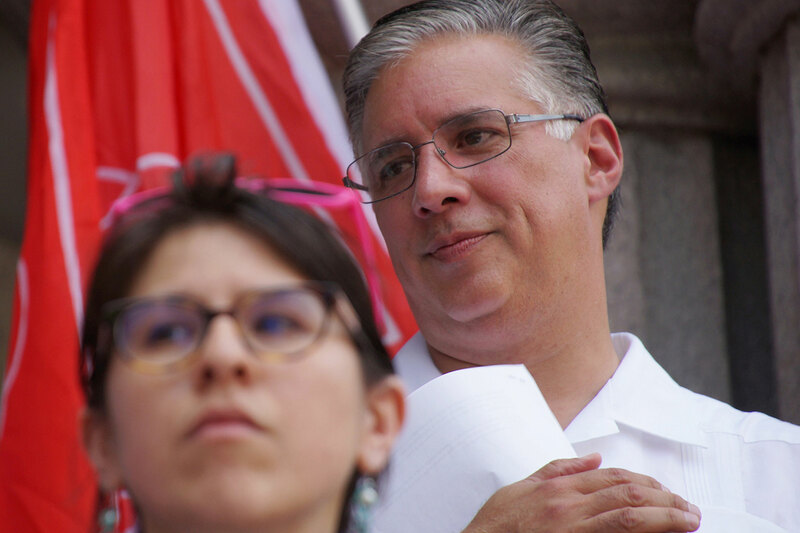 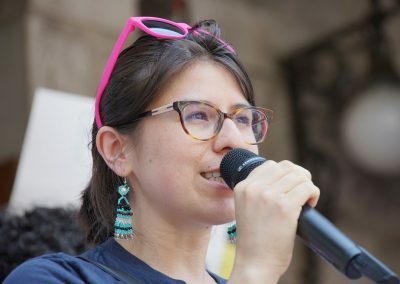 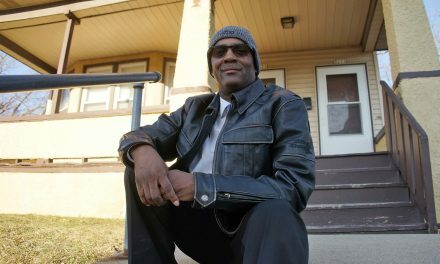 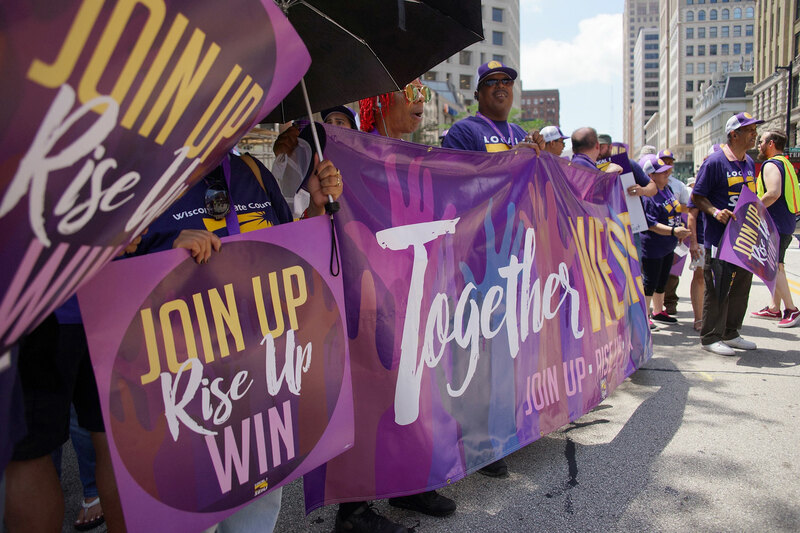 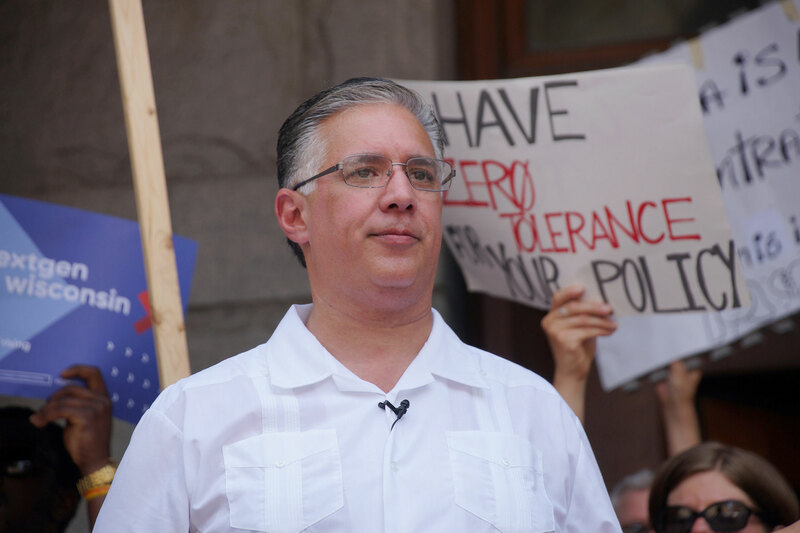 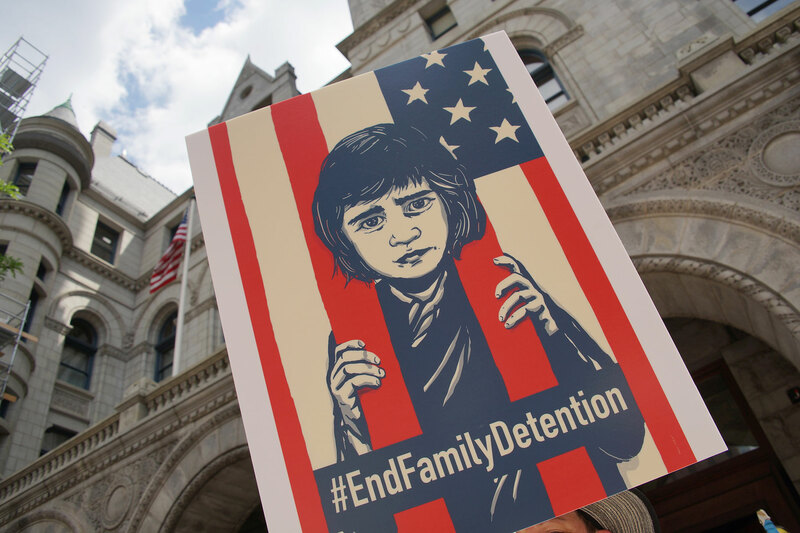 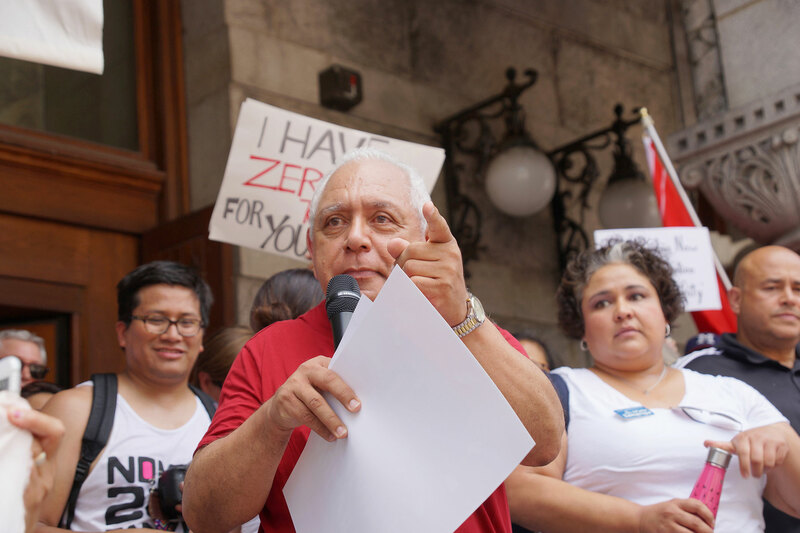 Many communities around the country and in Milwaukee came together from the very beginning, to bring immediate attention to the agenda of the Trump Administration and fight back against the traumatic process being implemented out.